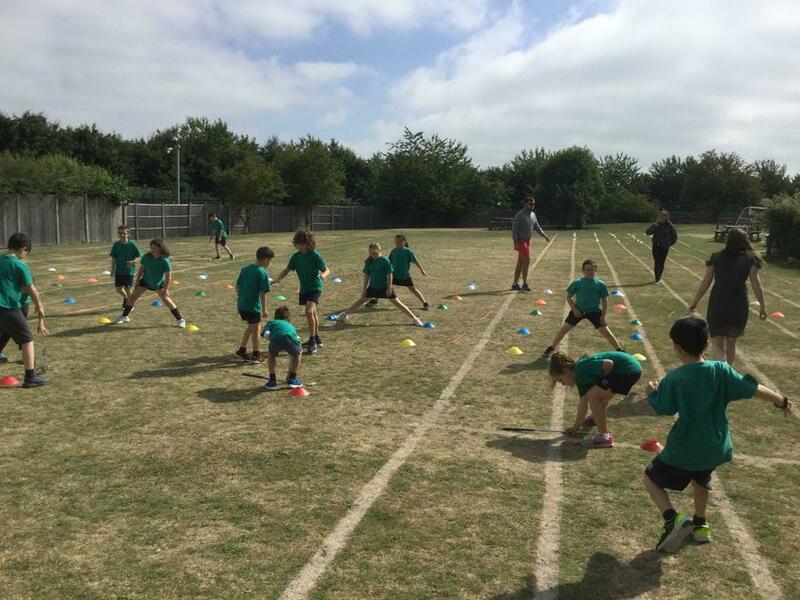 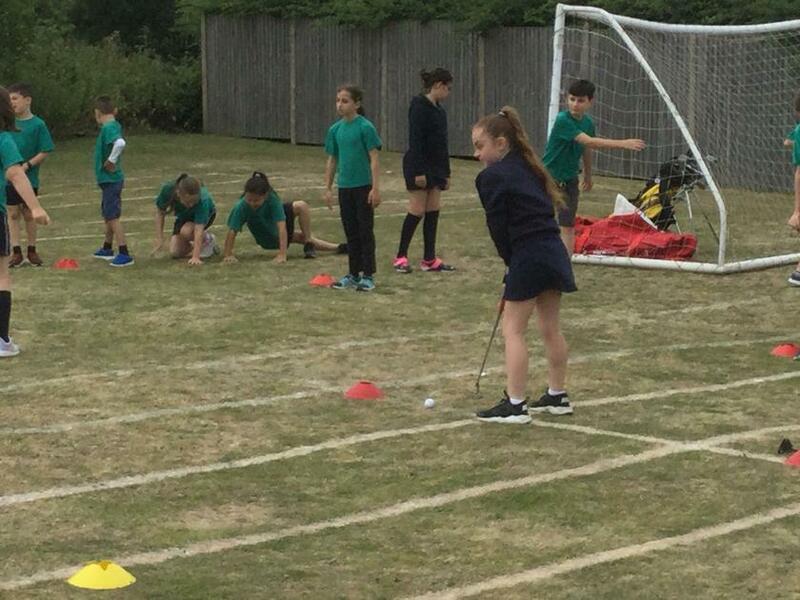 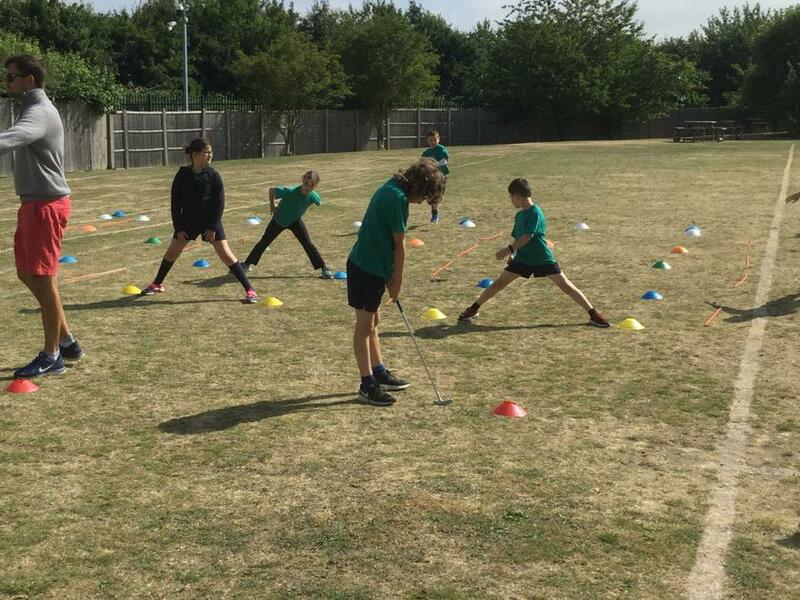 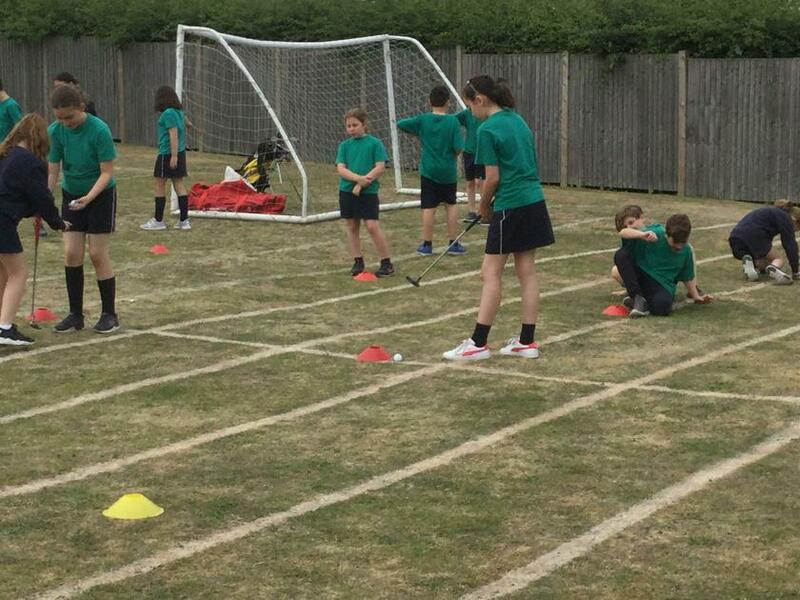 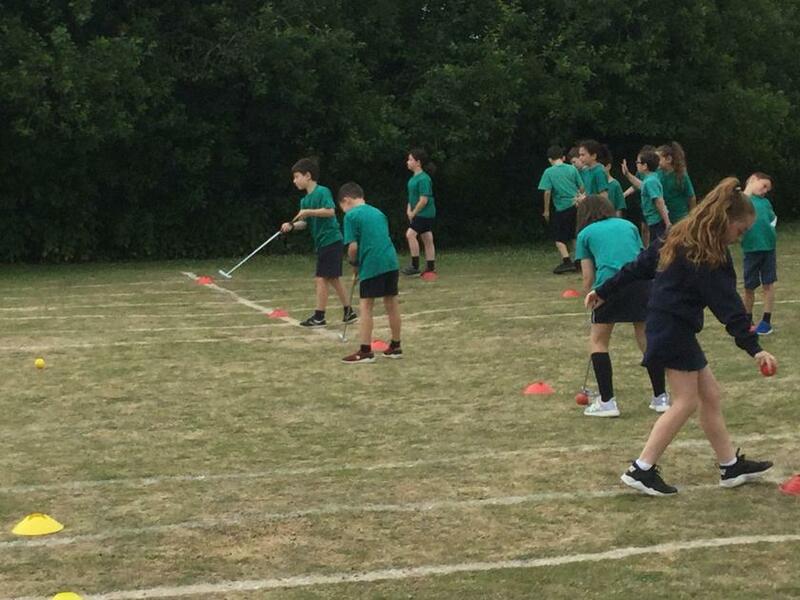 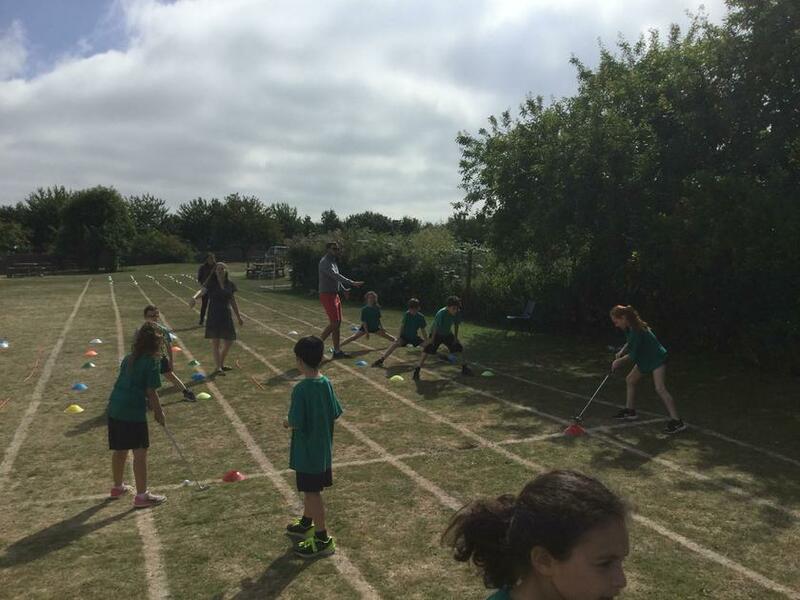 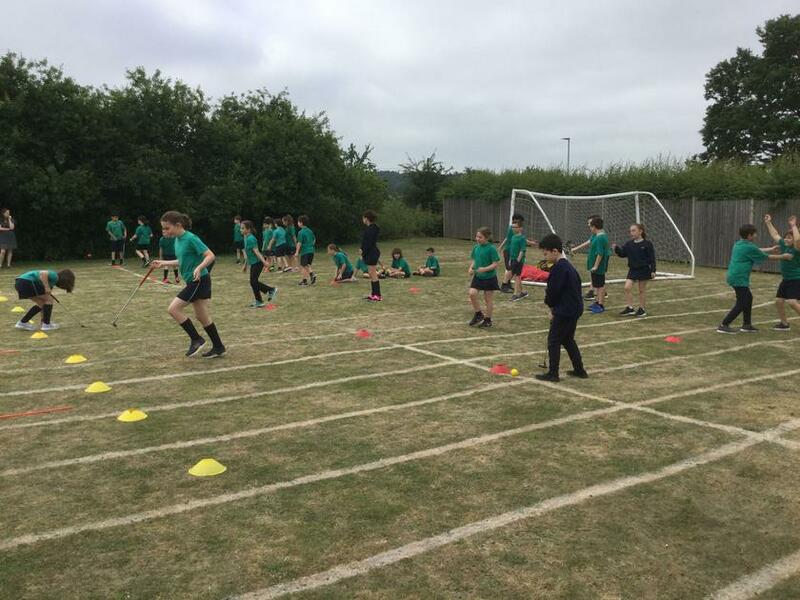 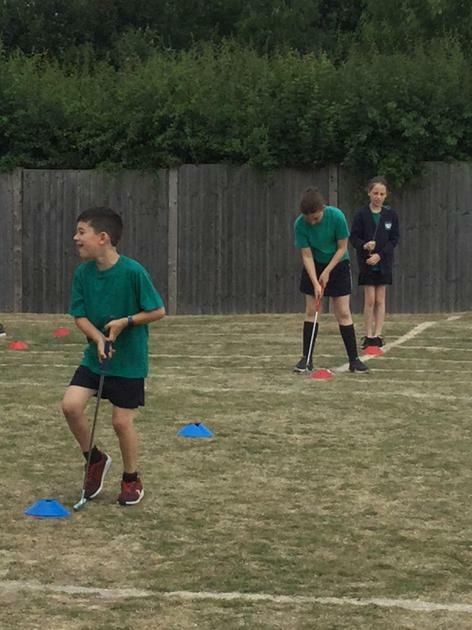 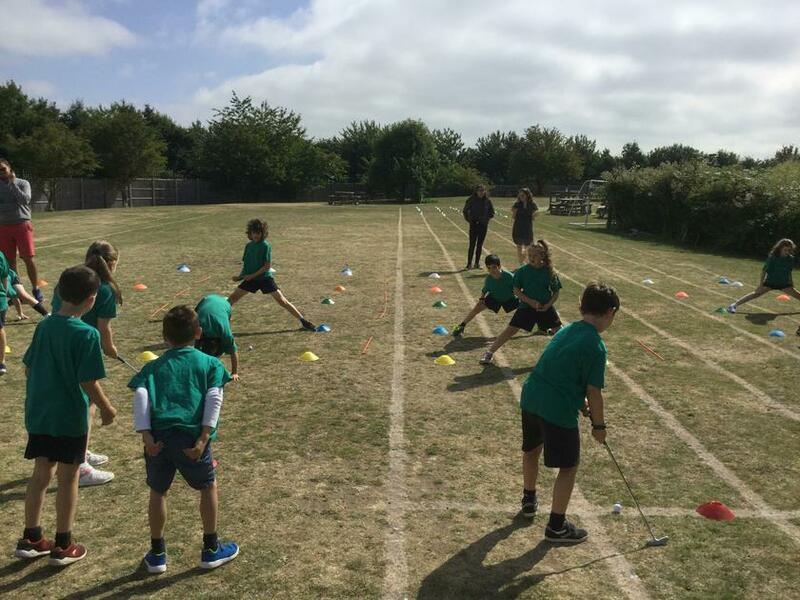 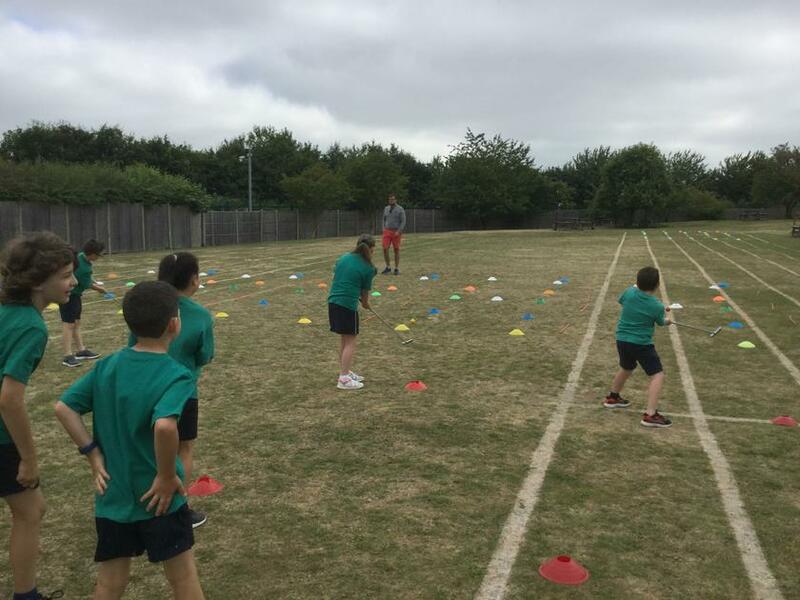 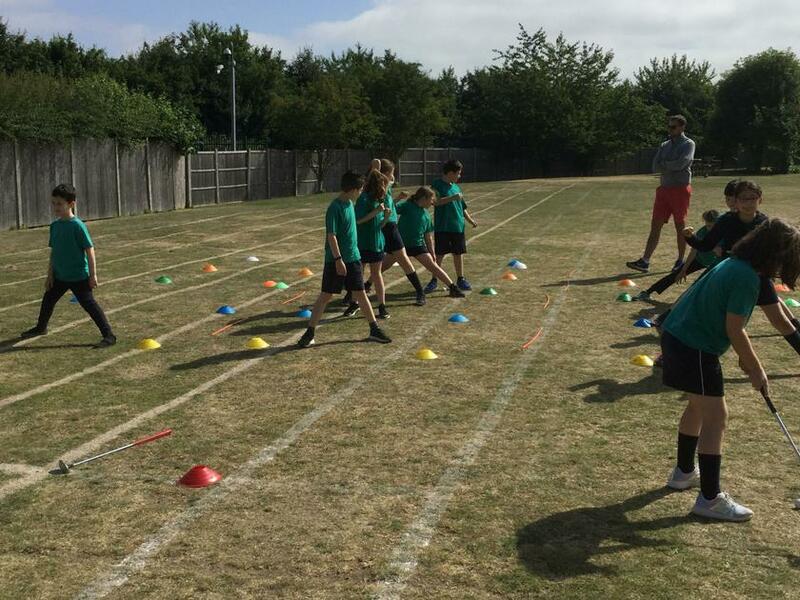 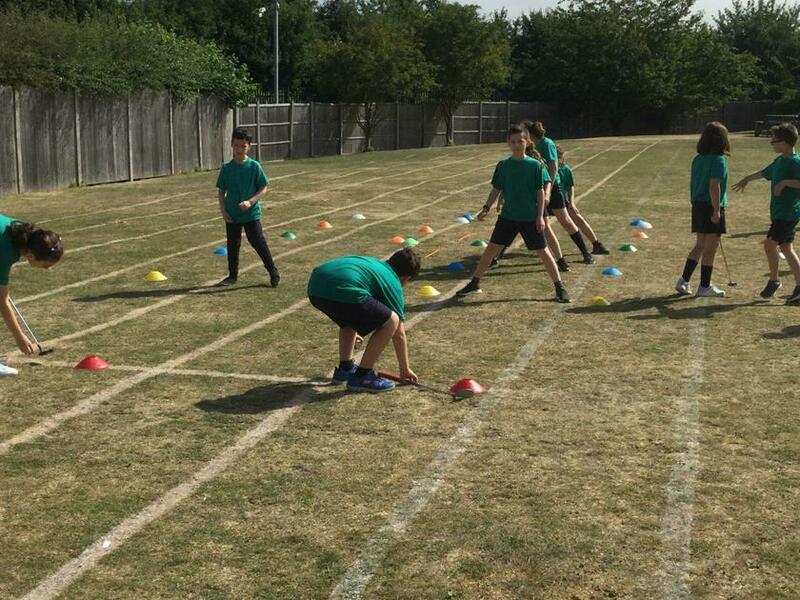 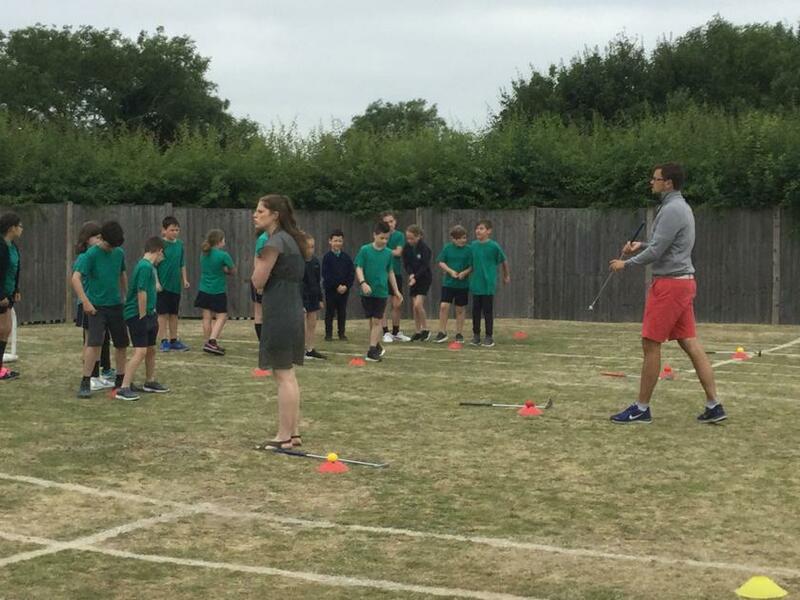 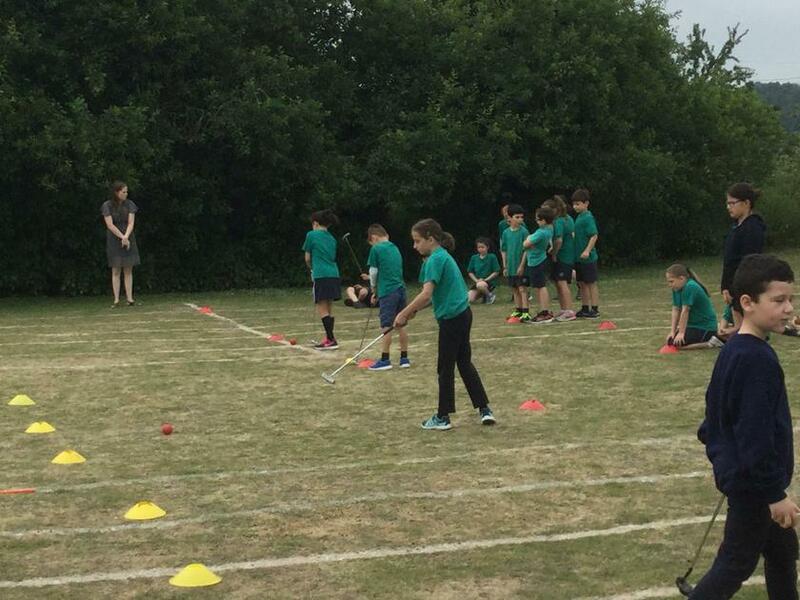 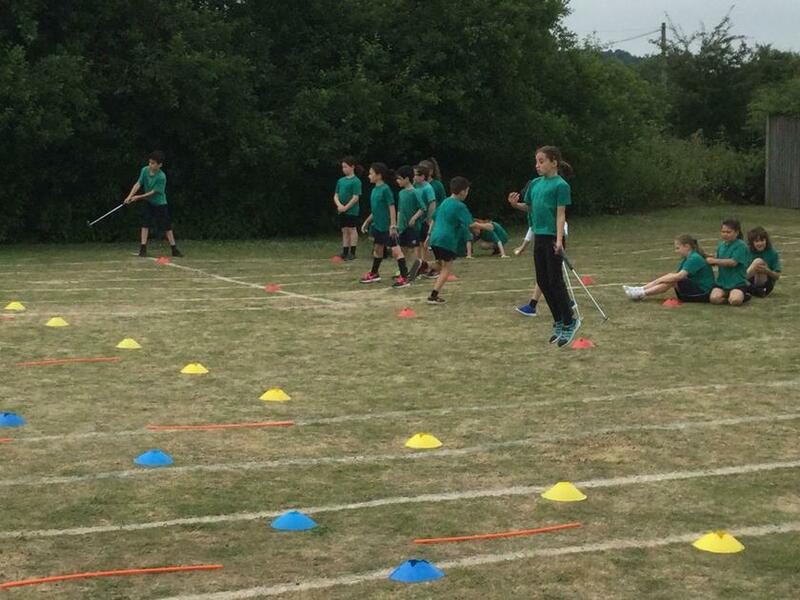 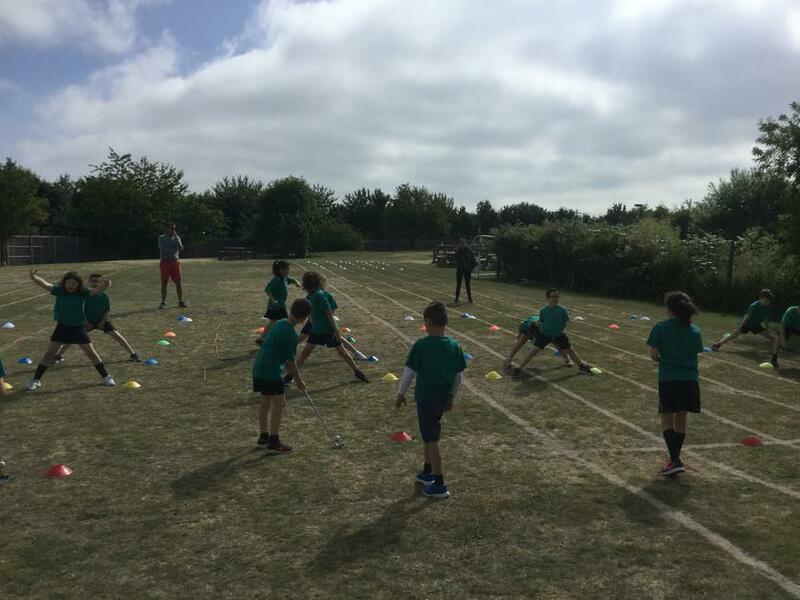 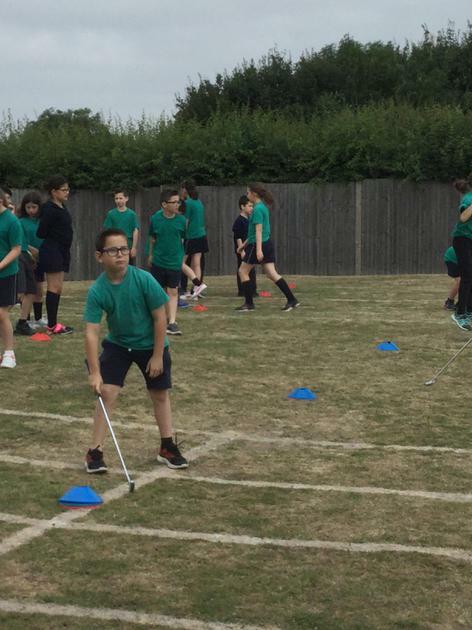 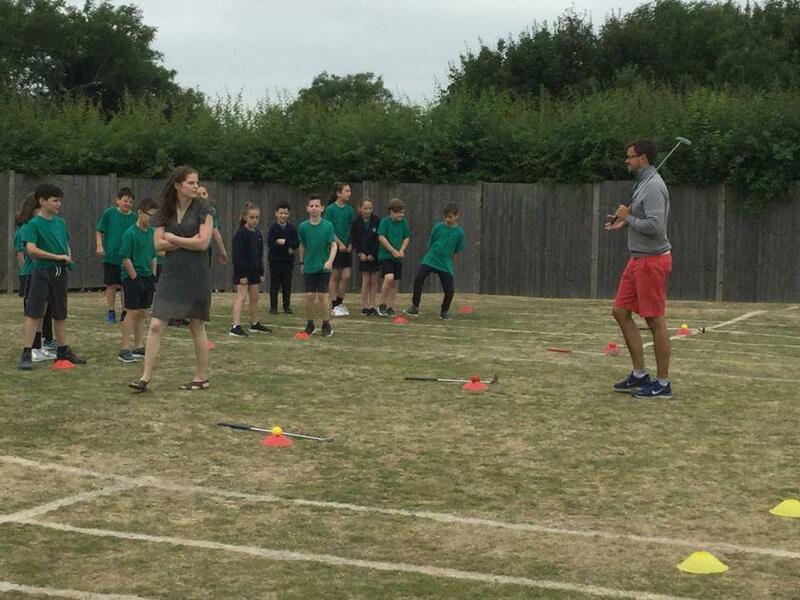 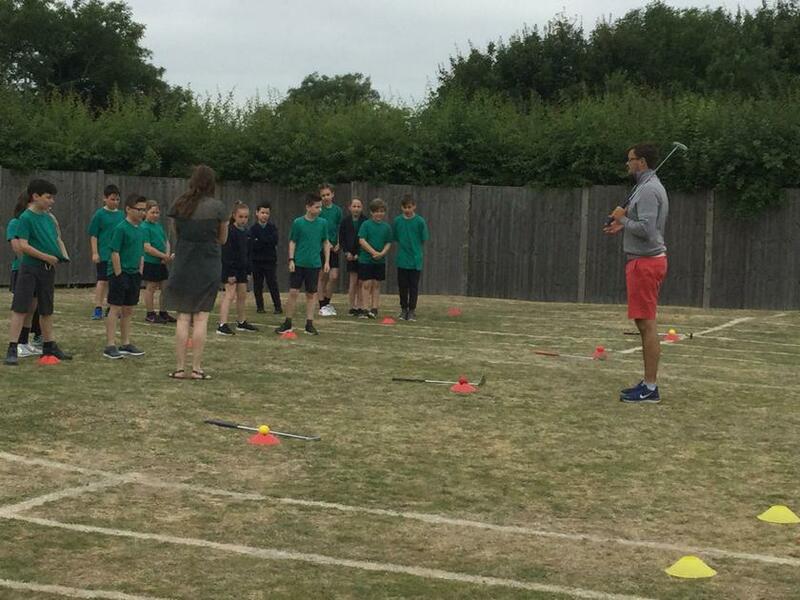 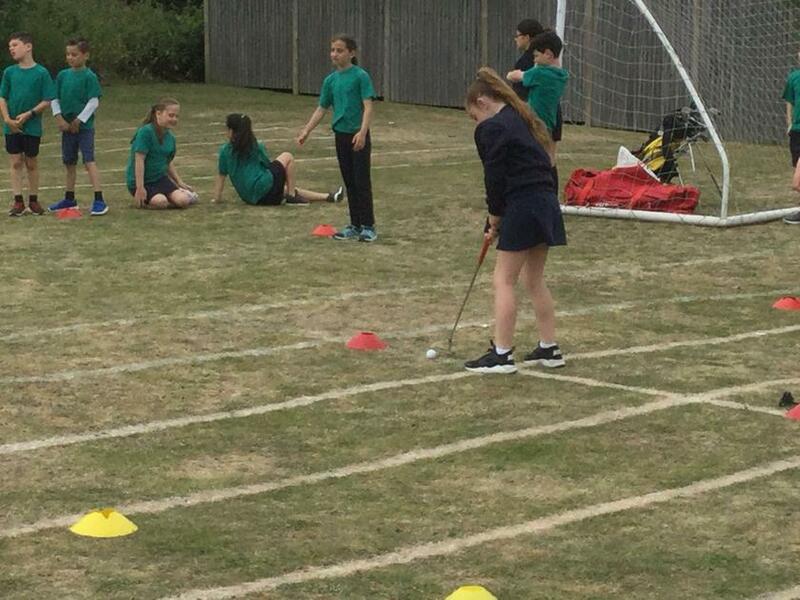 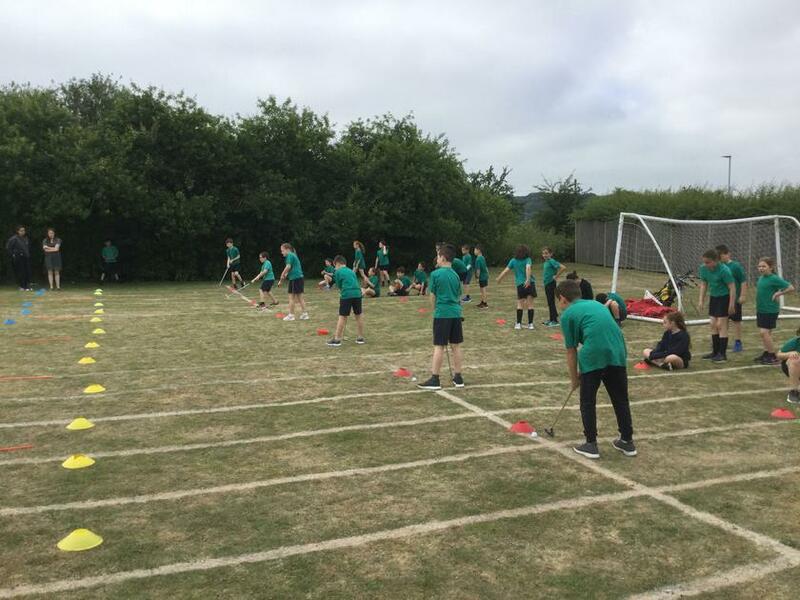 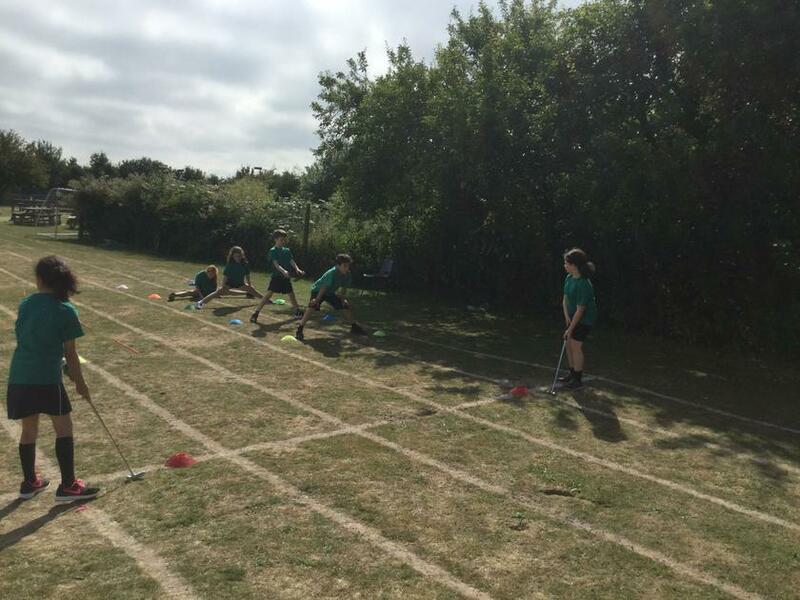 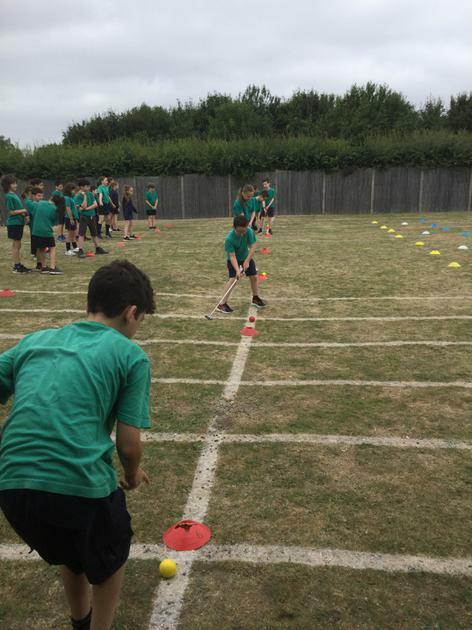 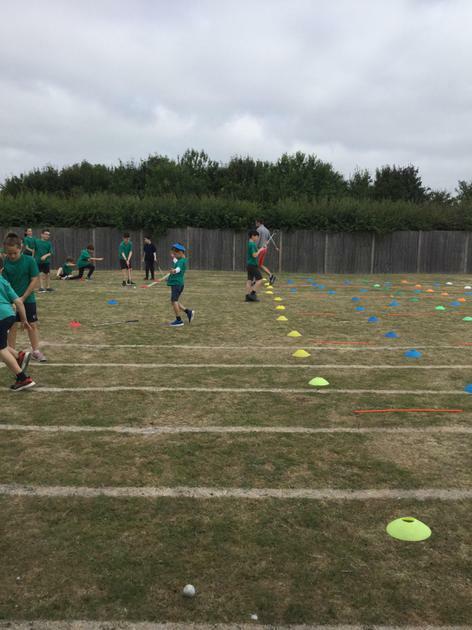 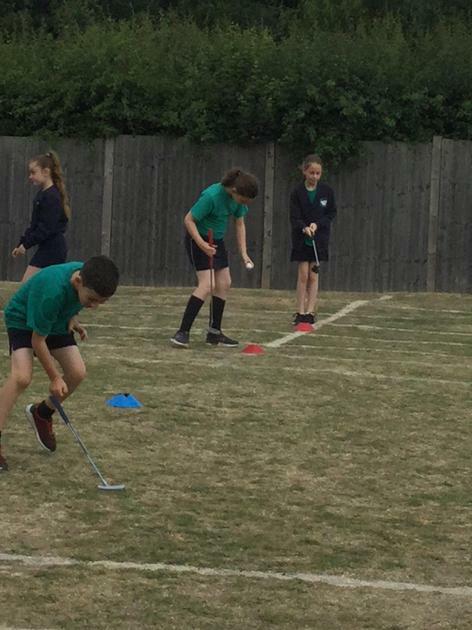 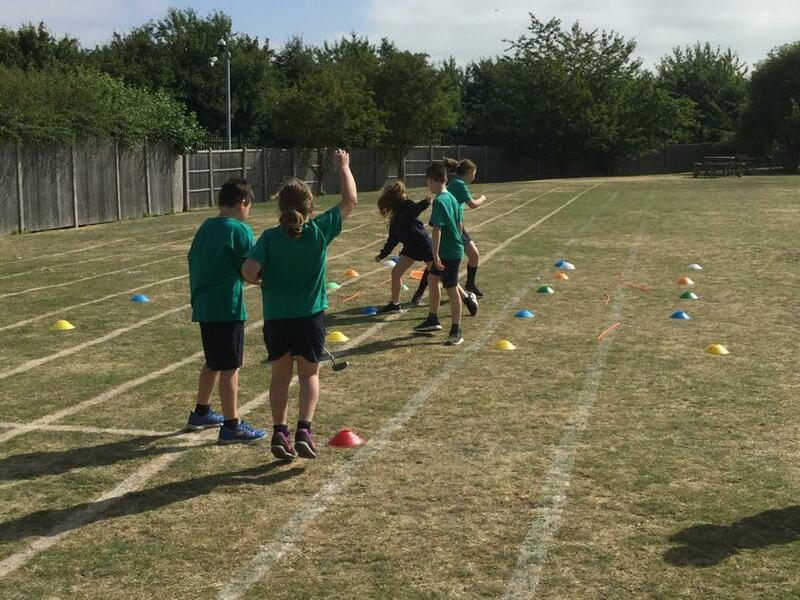 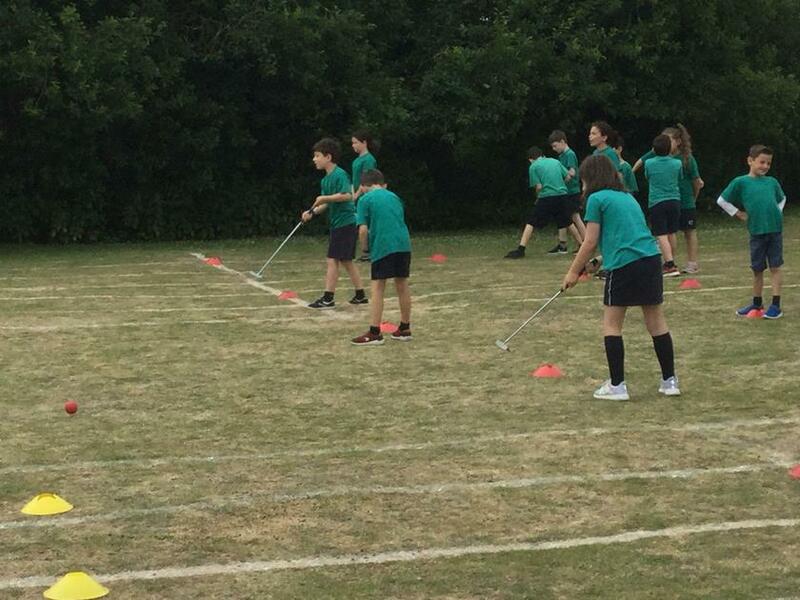 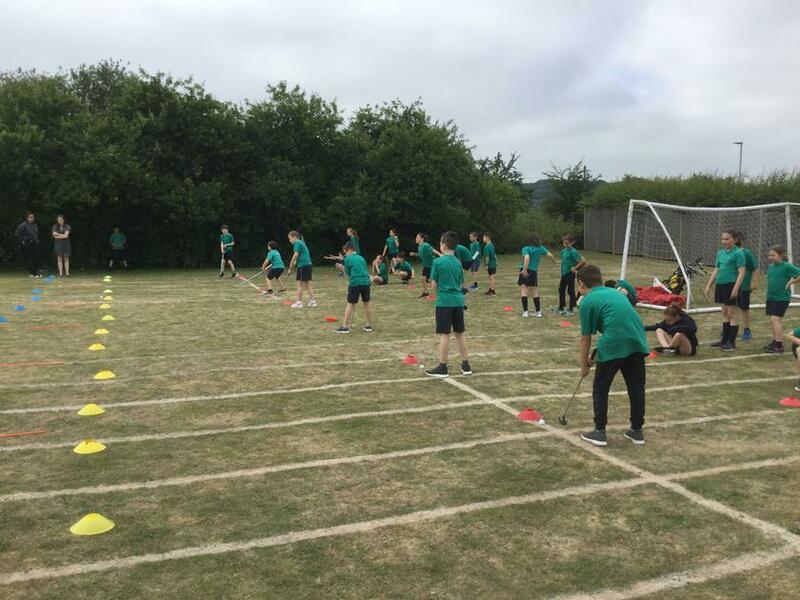 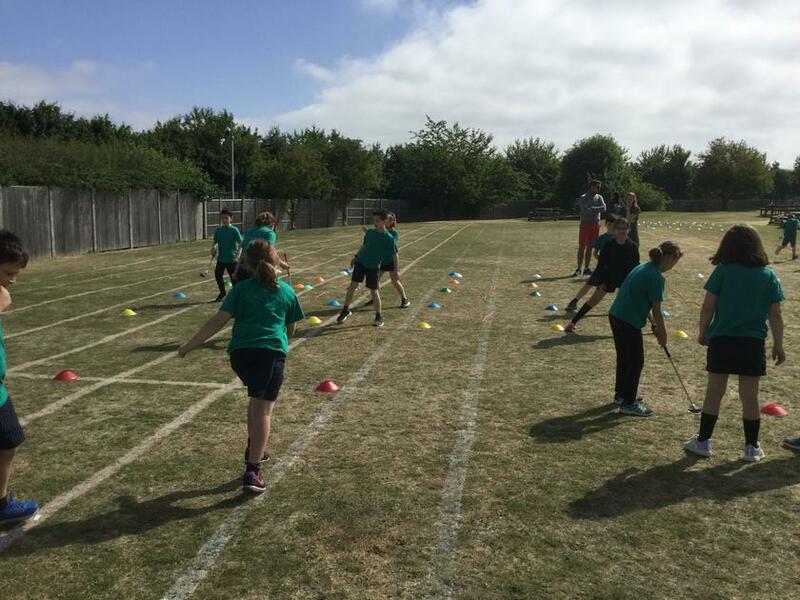 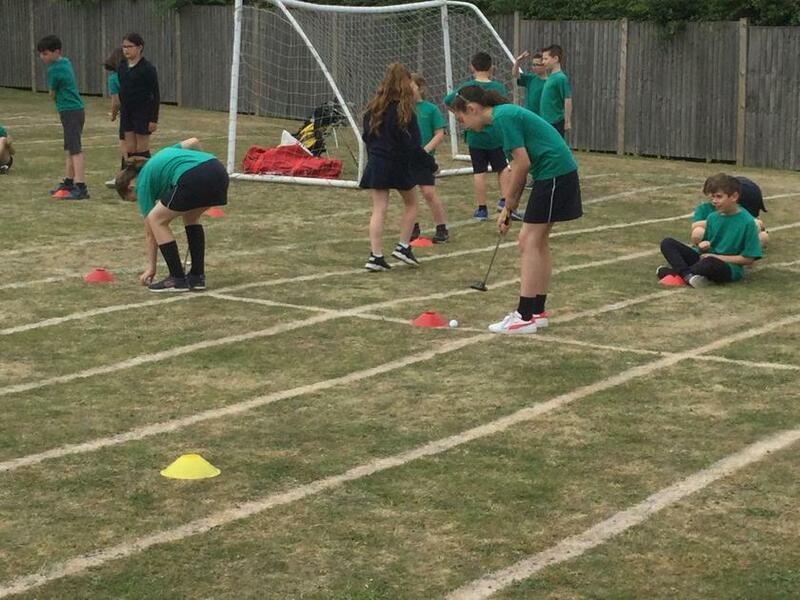 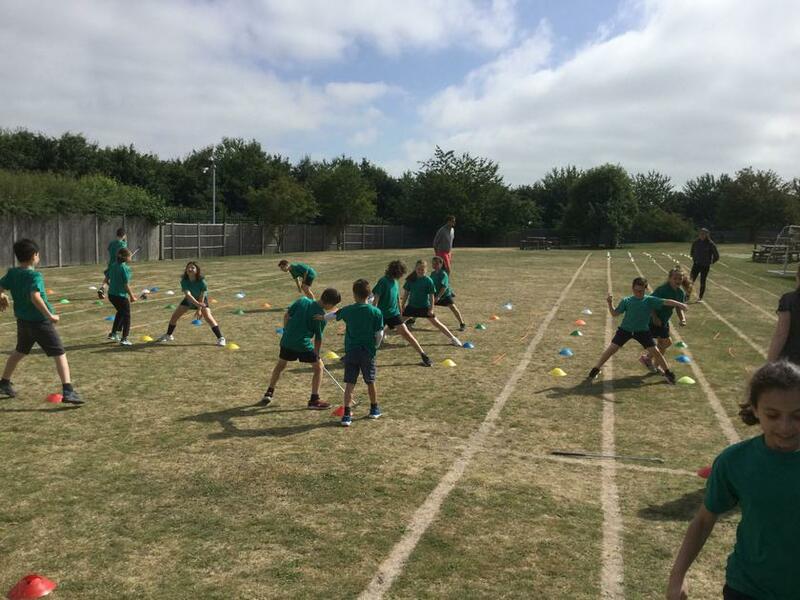 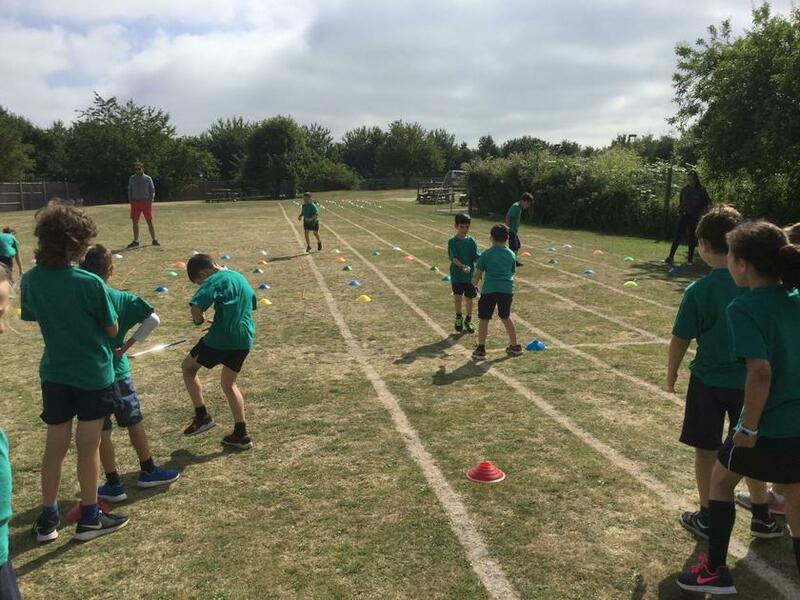 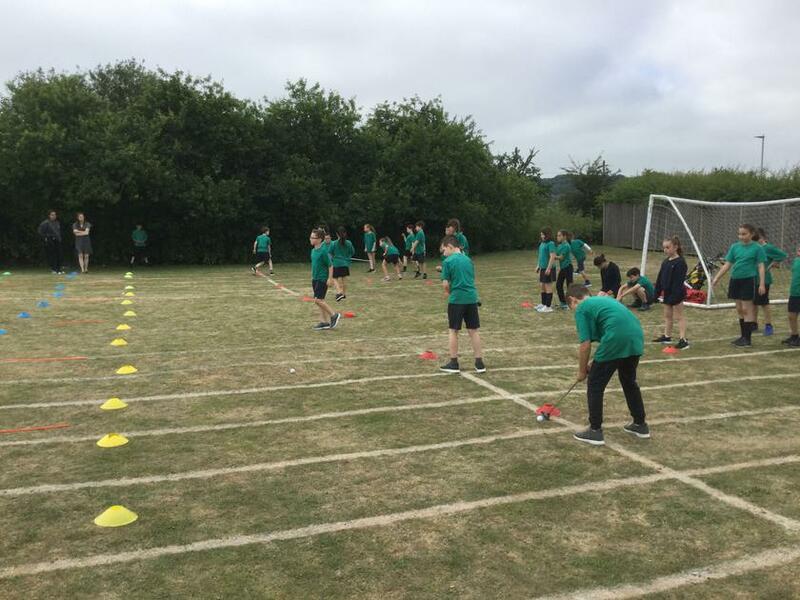 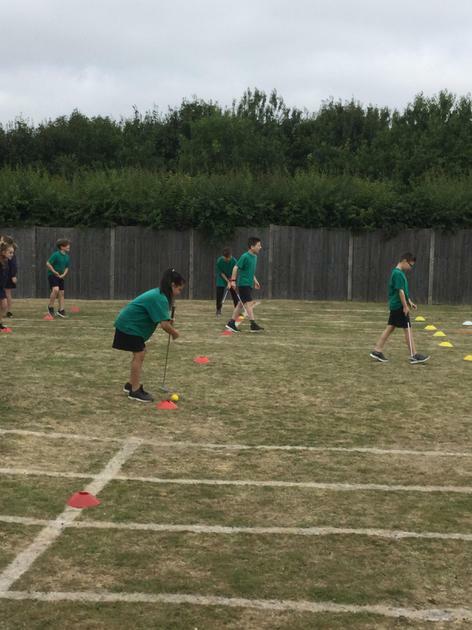 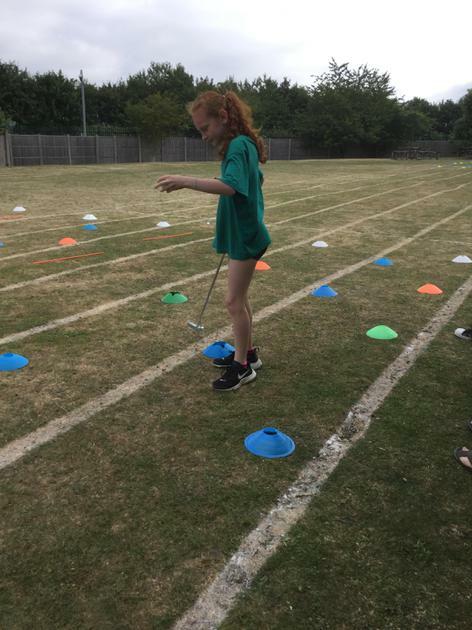 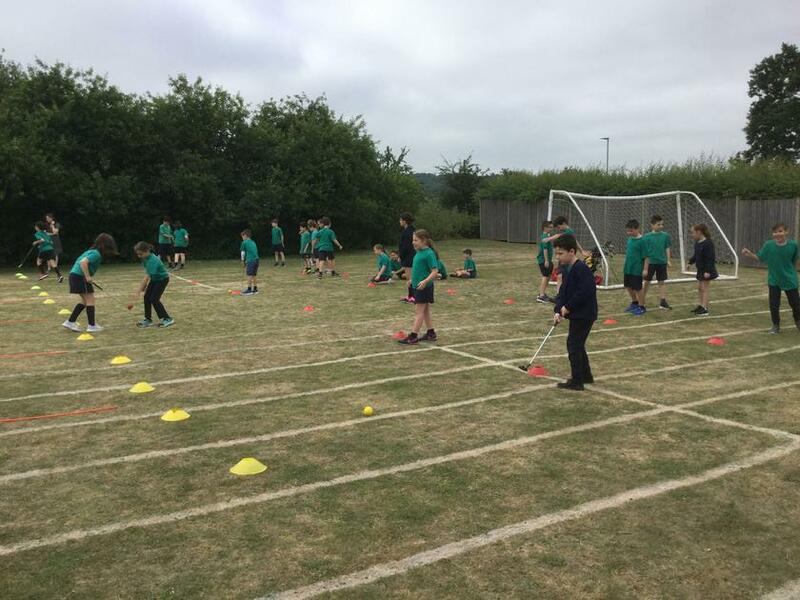 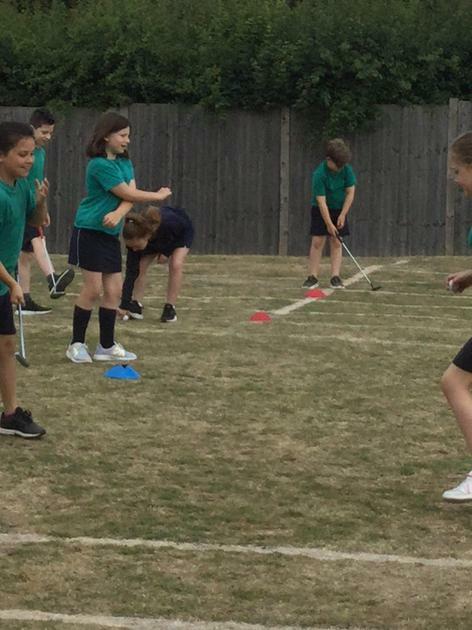 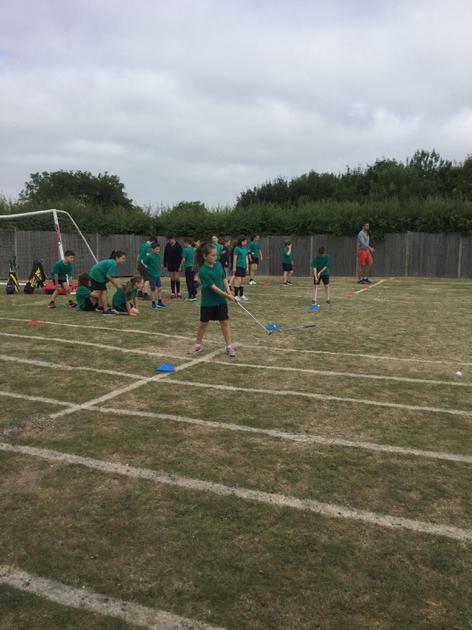 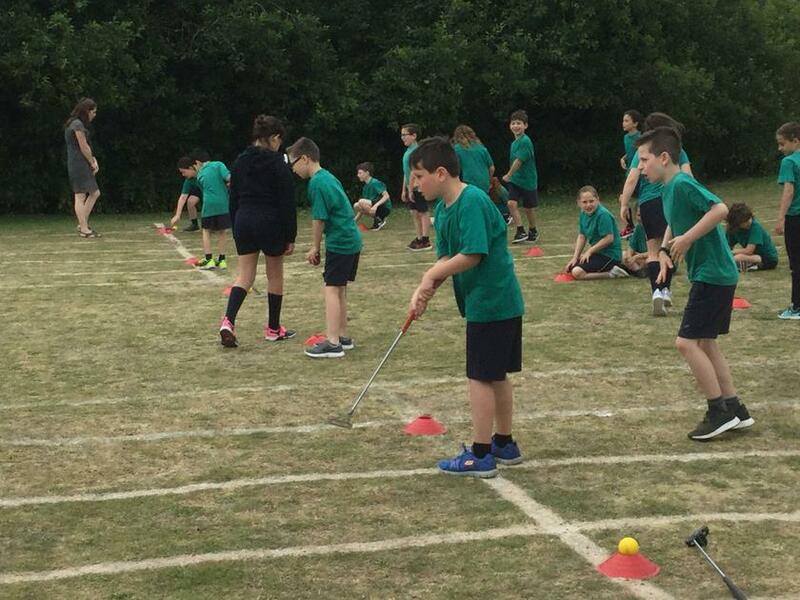 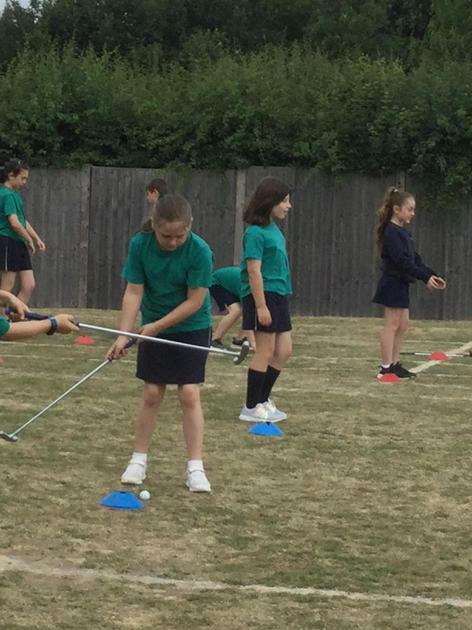 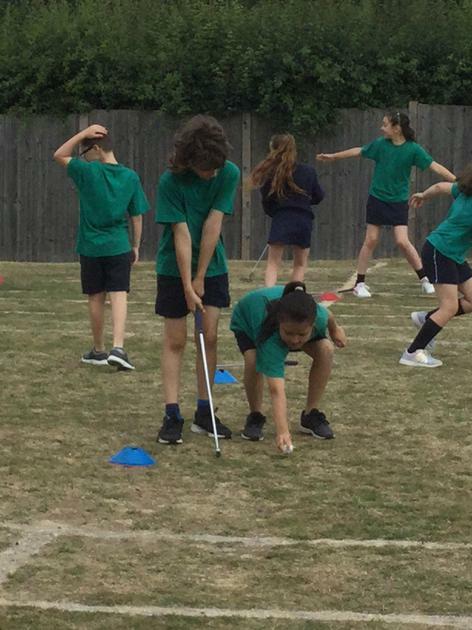 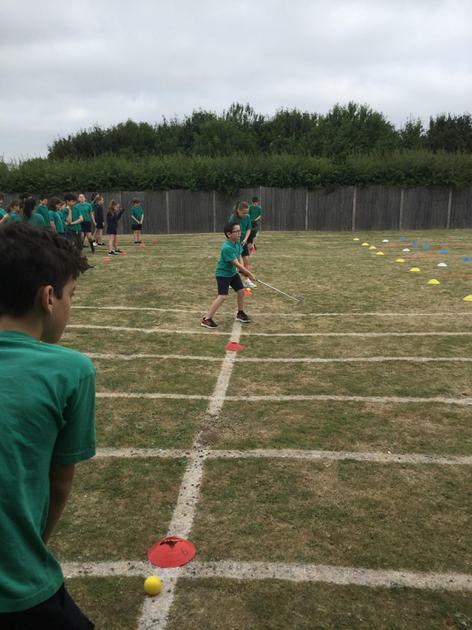 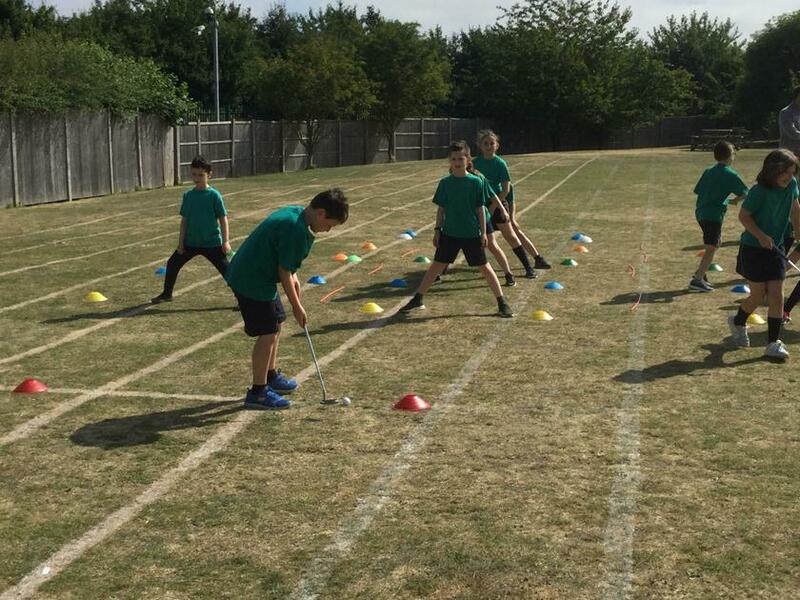 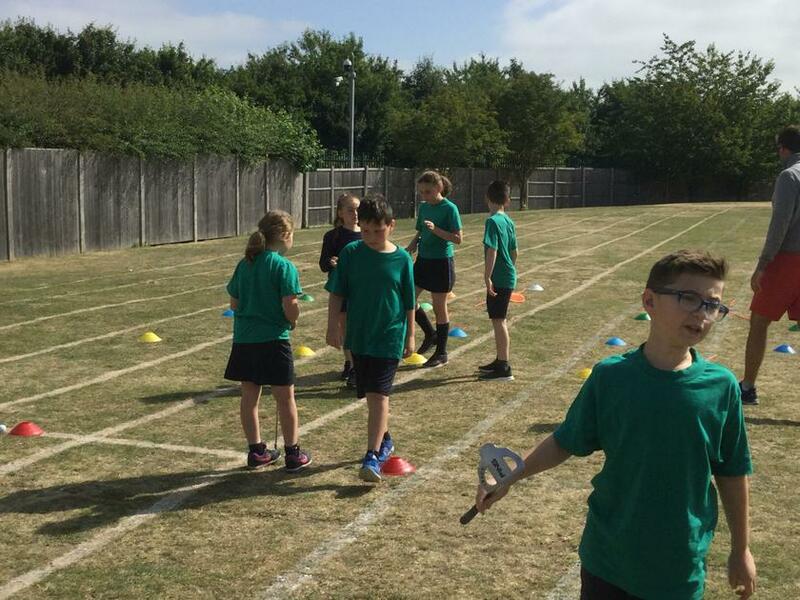 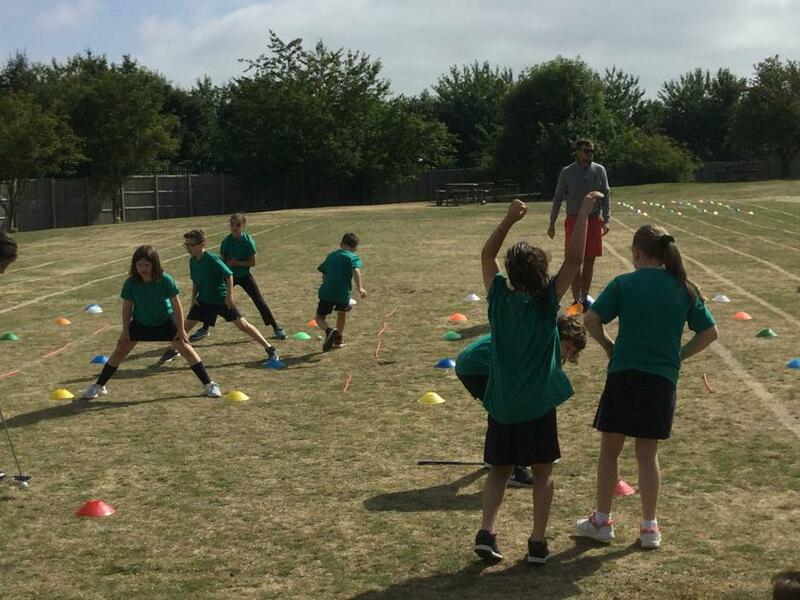 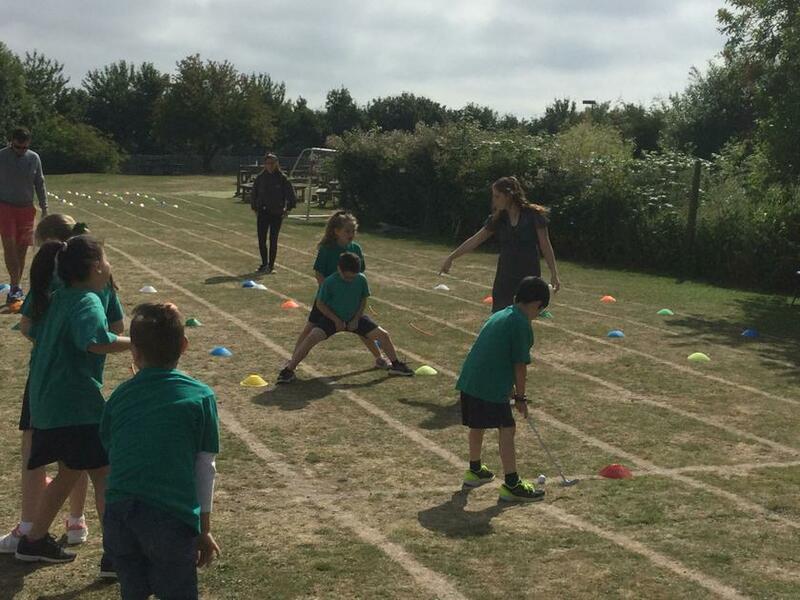 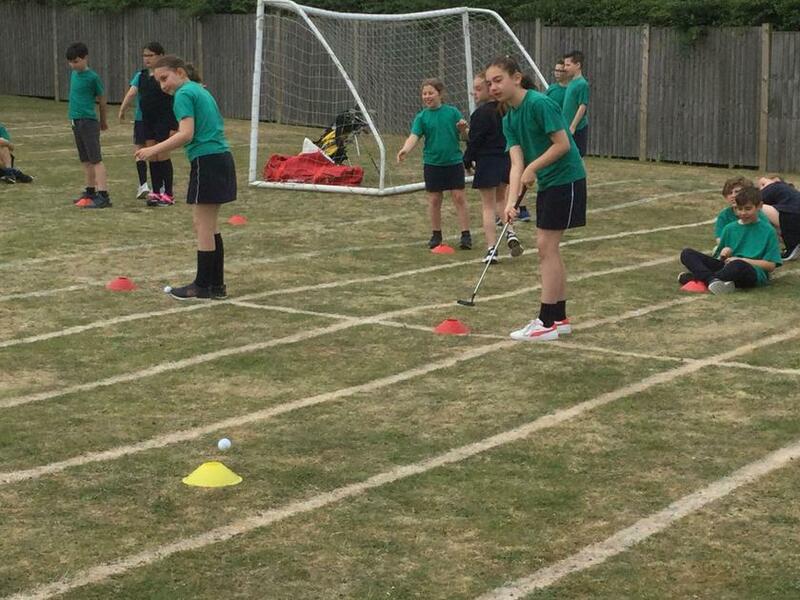 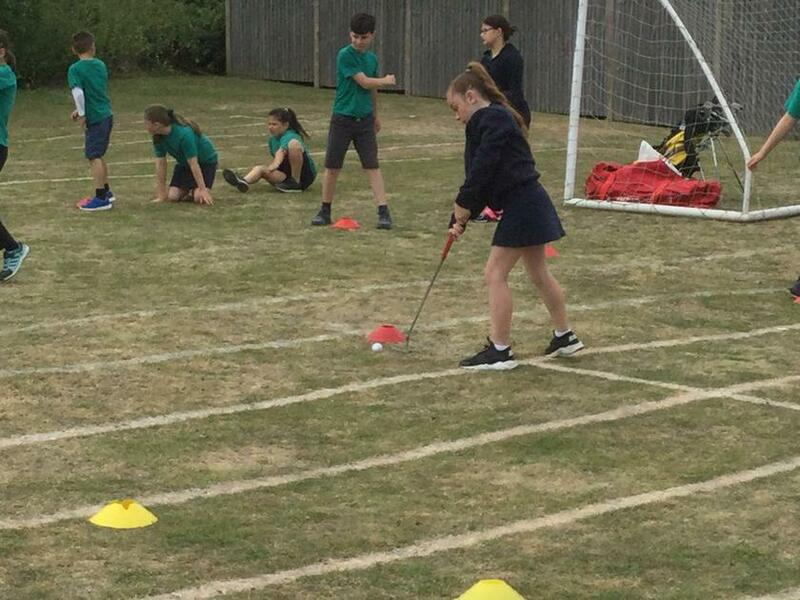 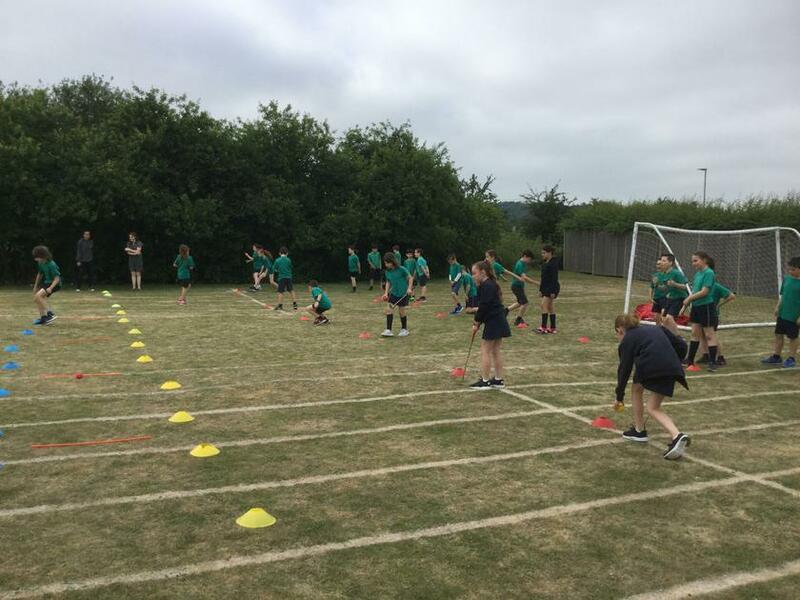 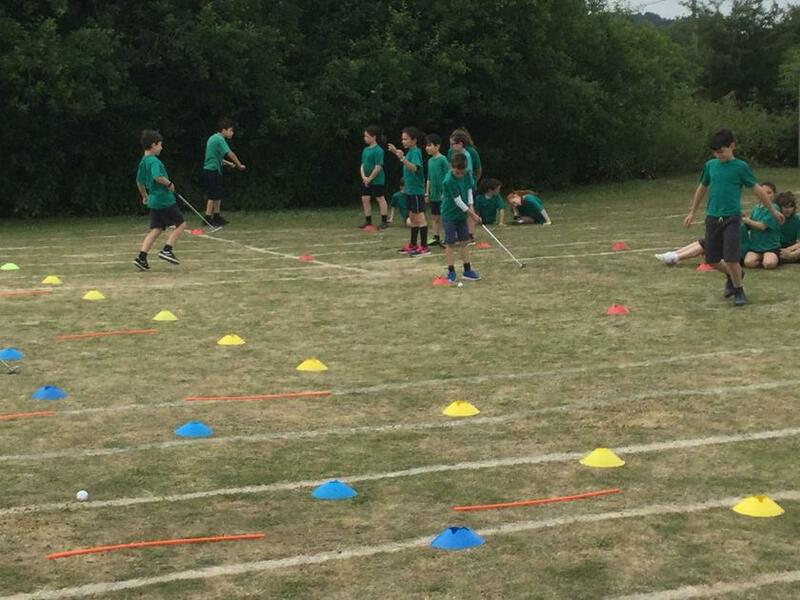 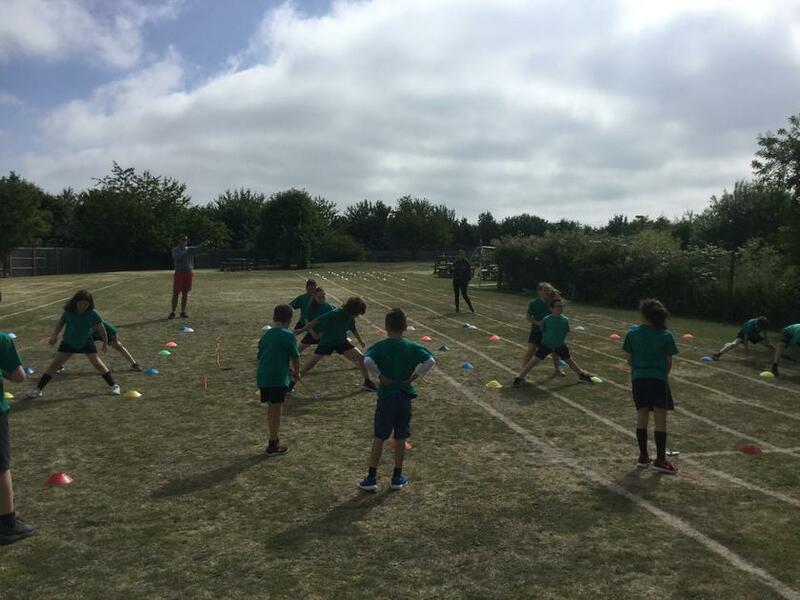 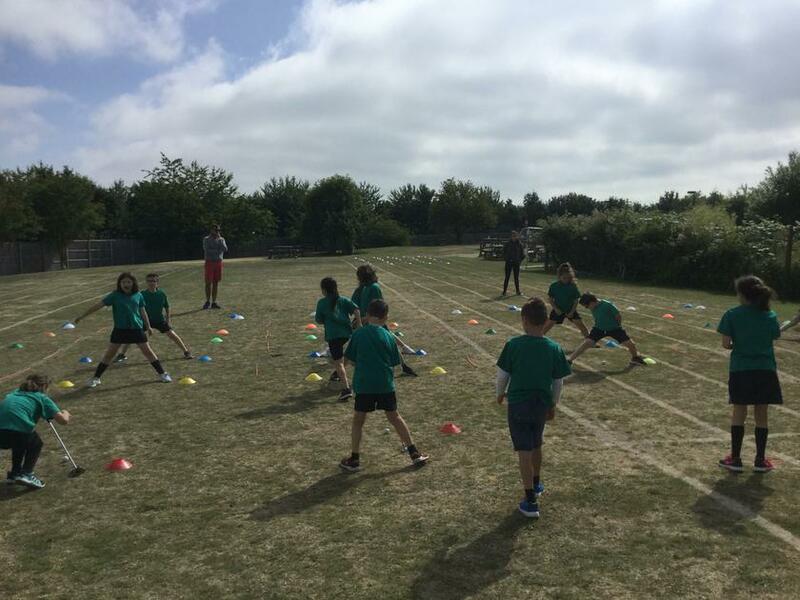 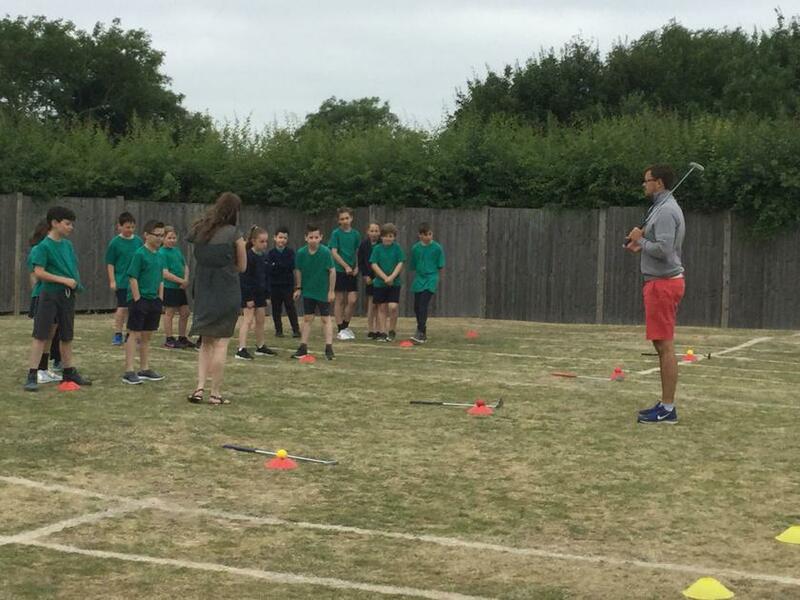 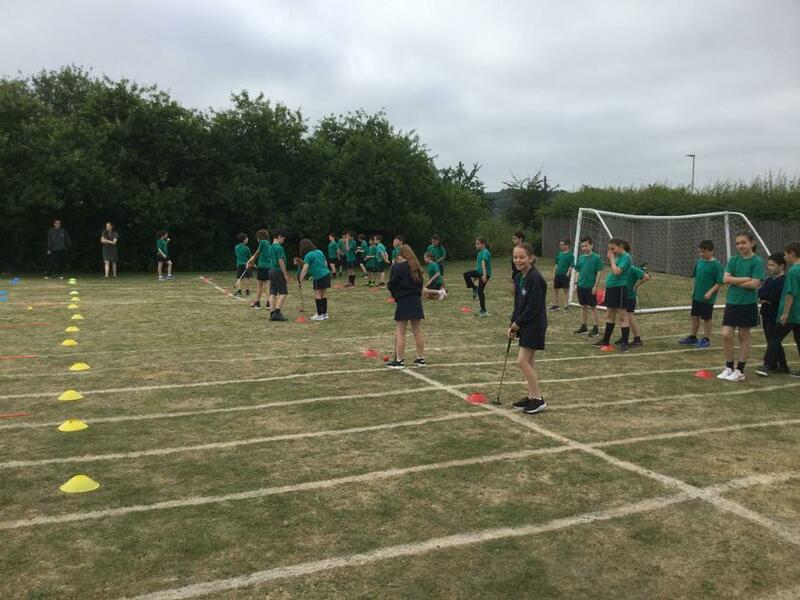 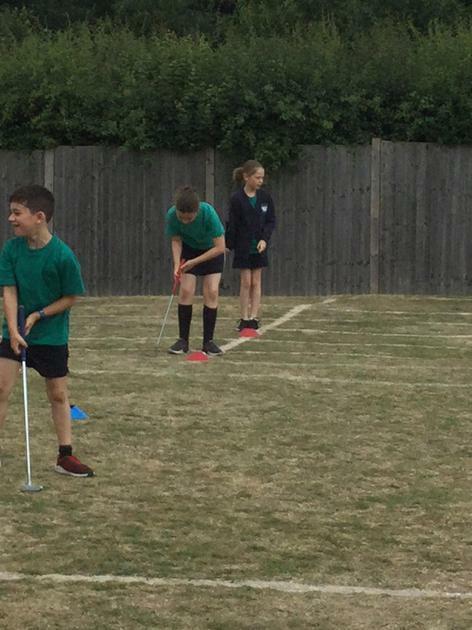 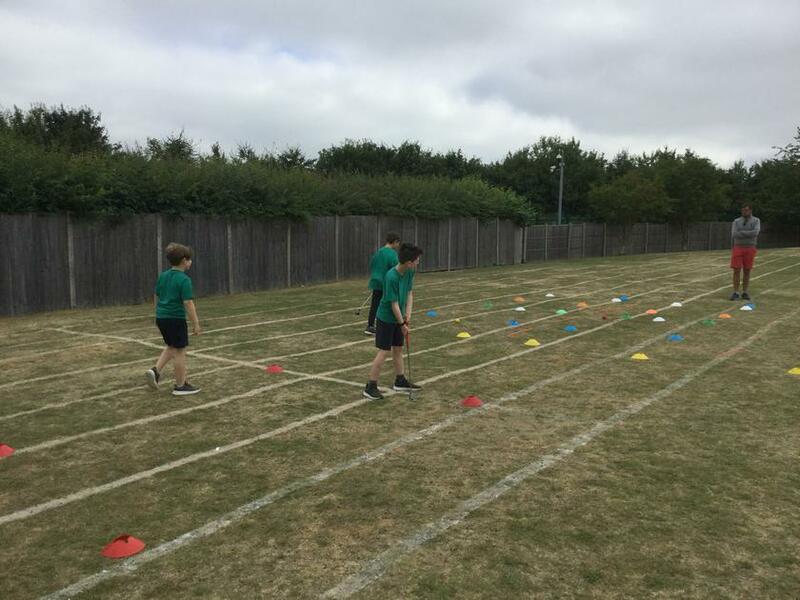 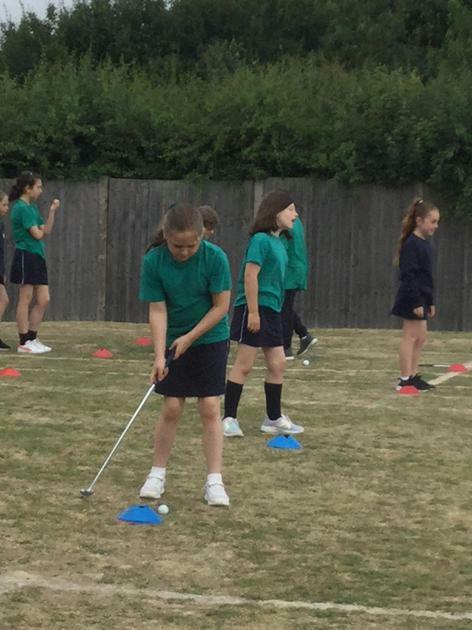 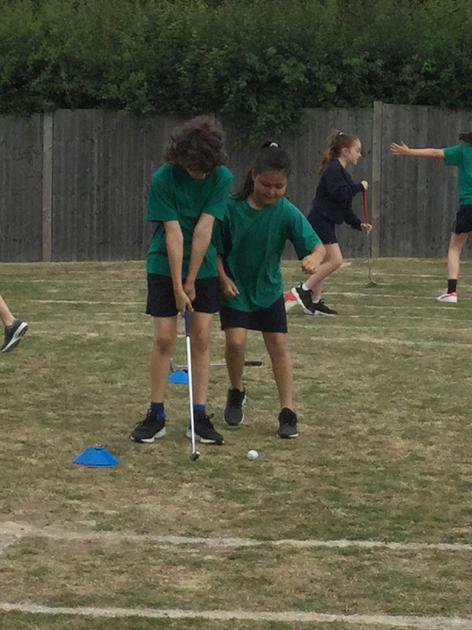 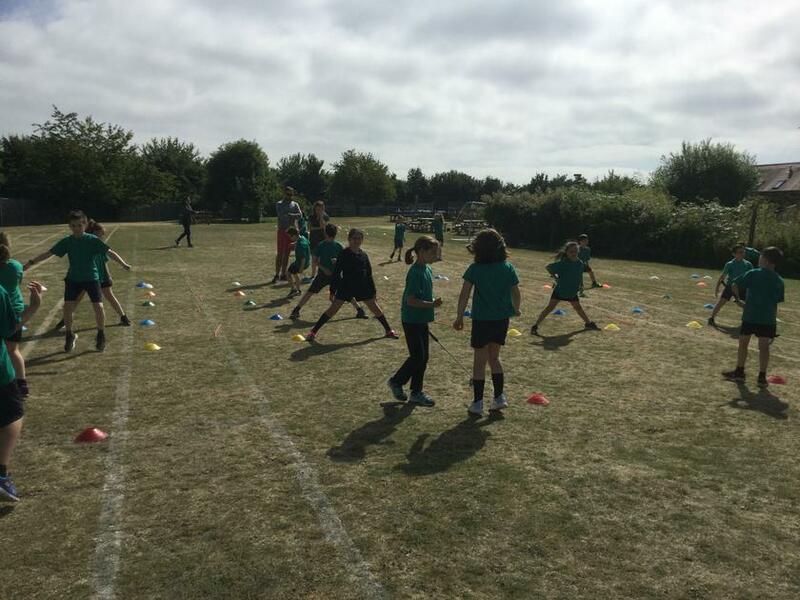 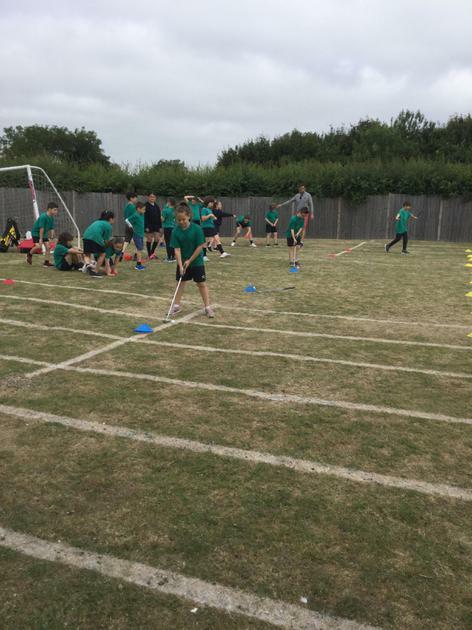 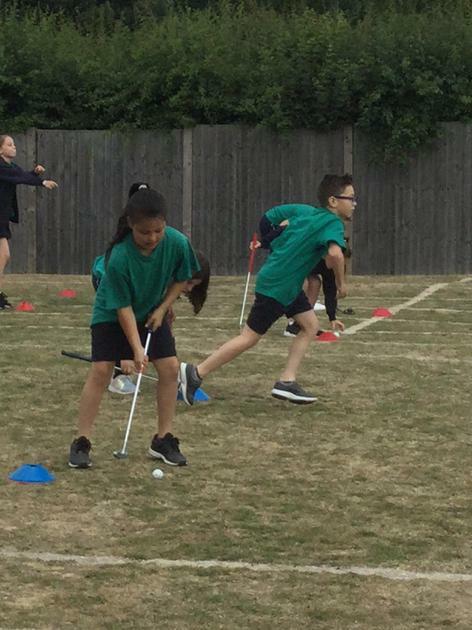 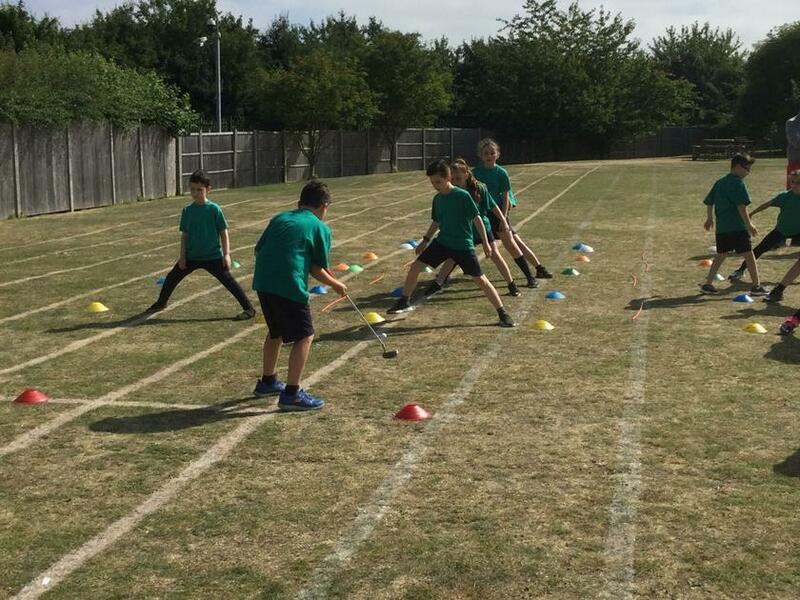 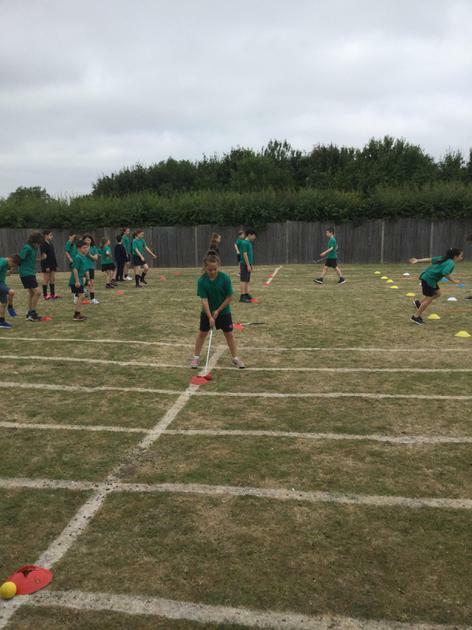 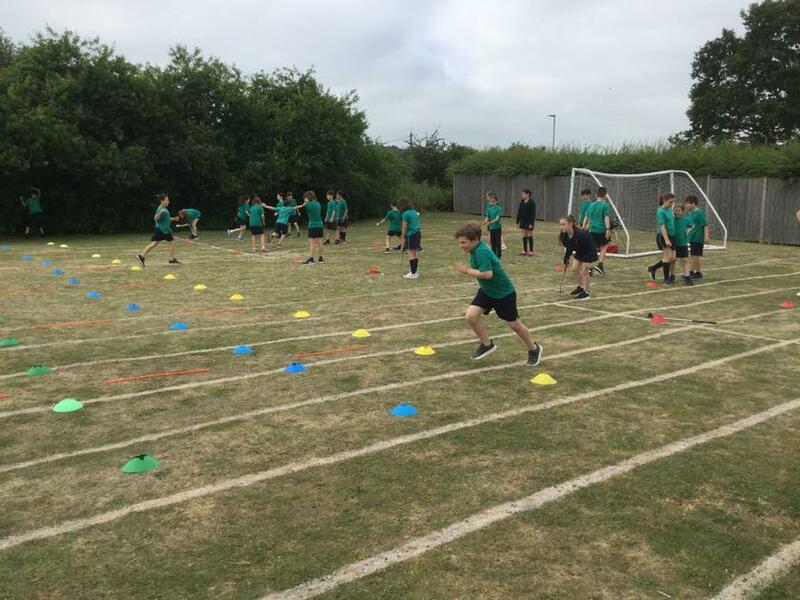 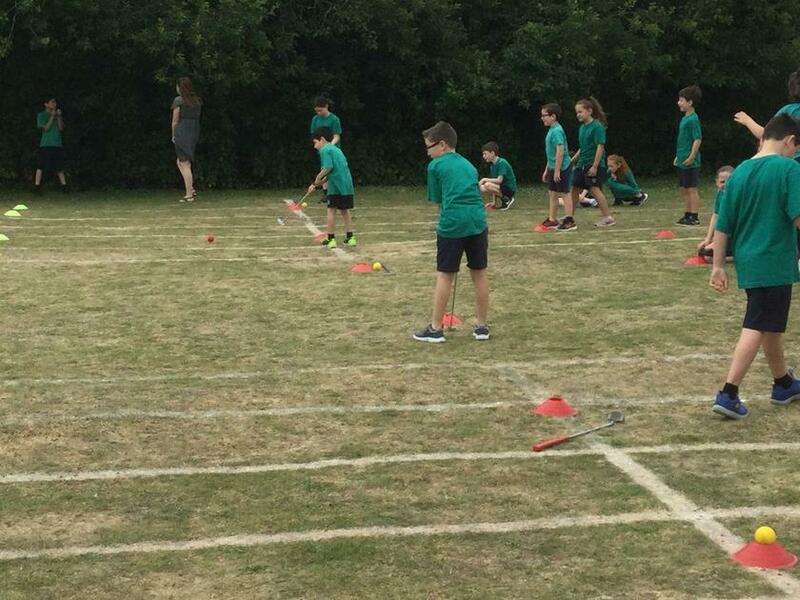 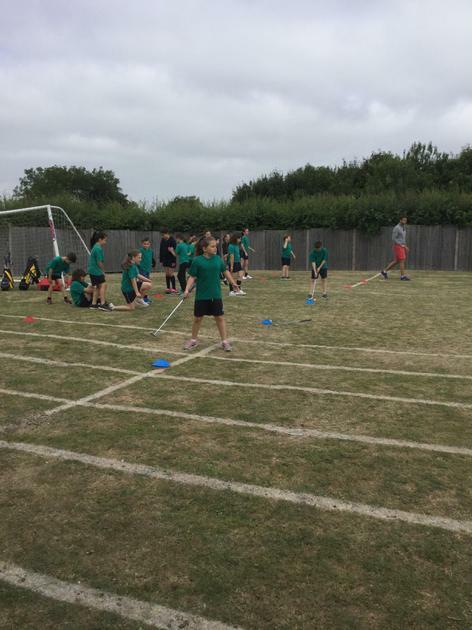 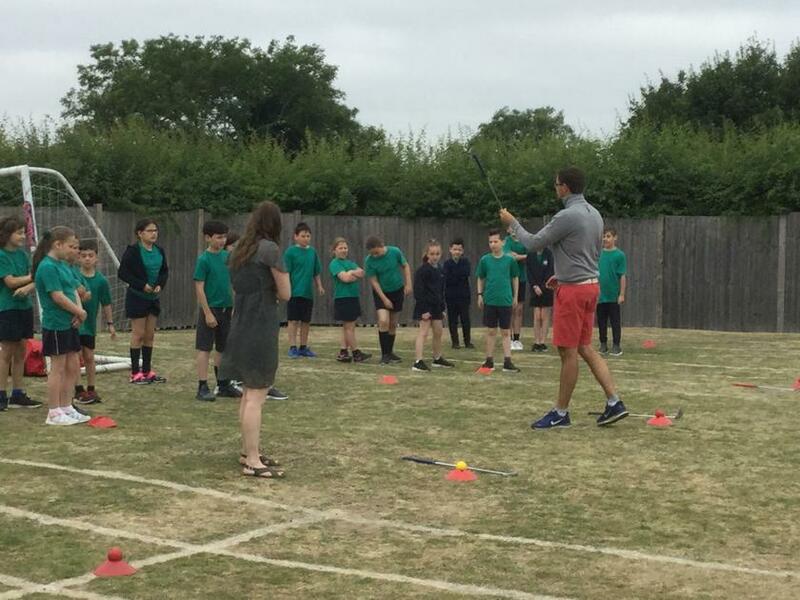 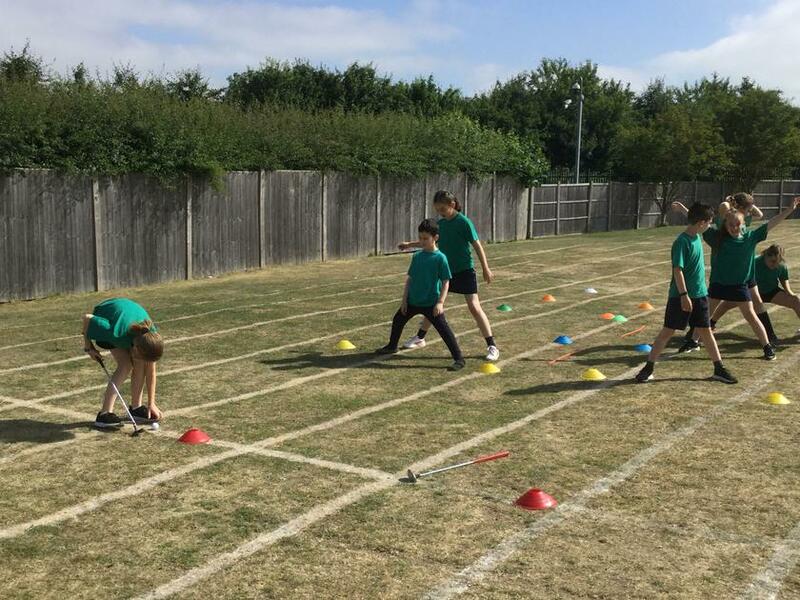 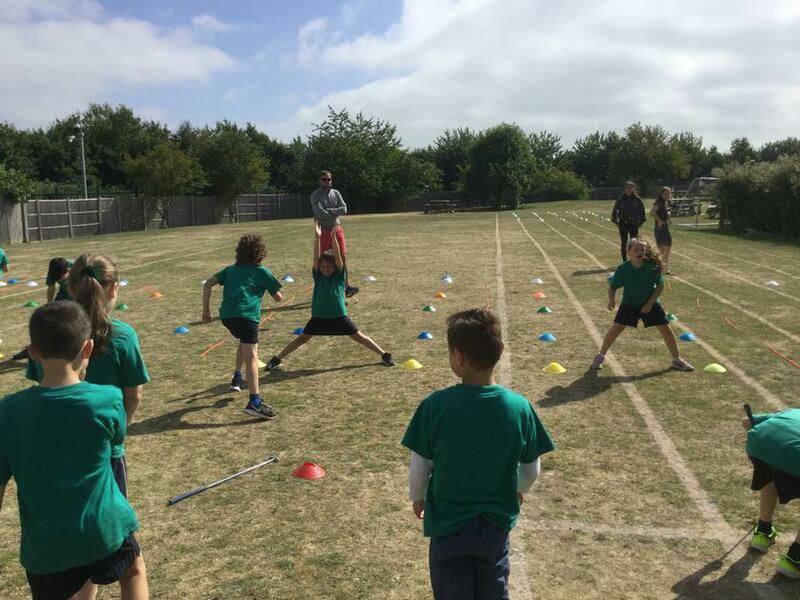 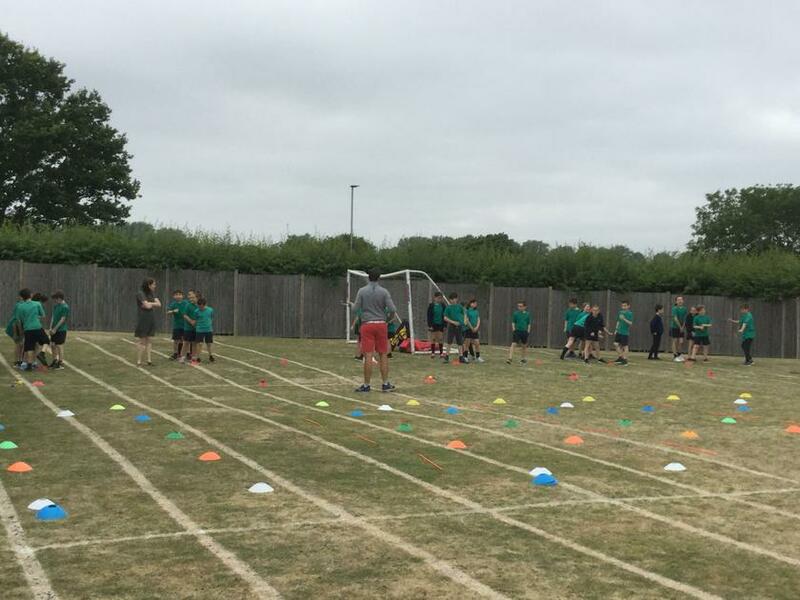 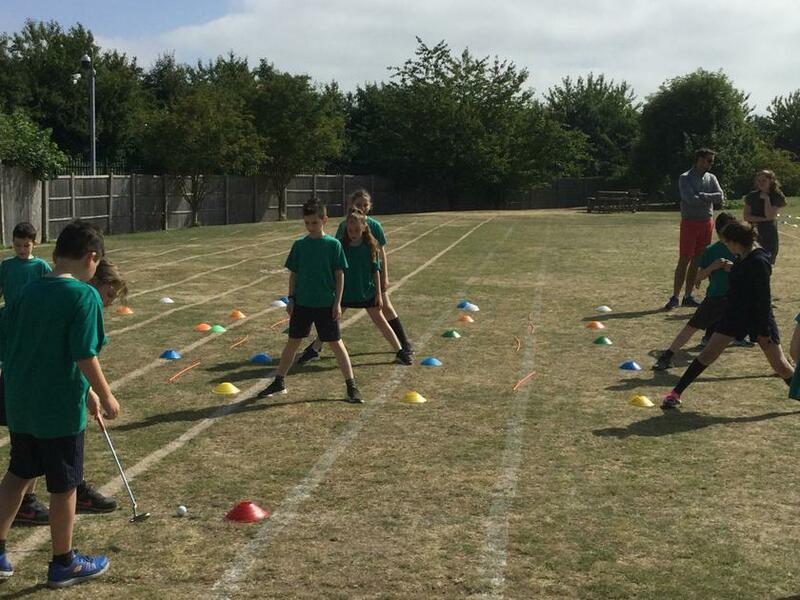 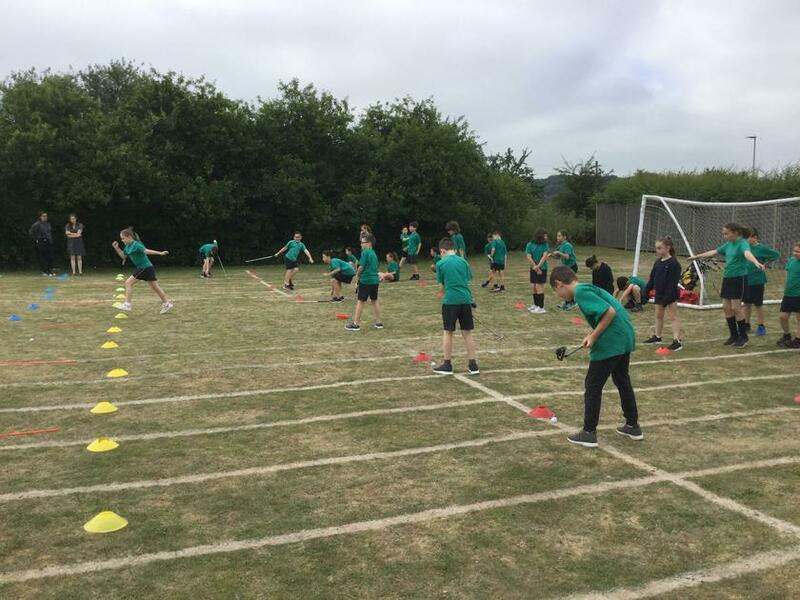 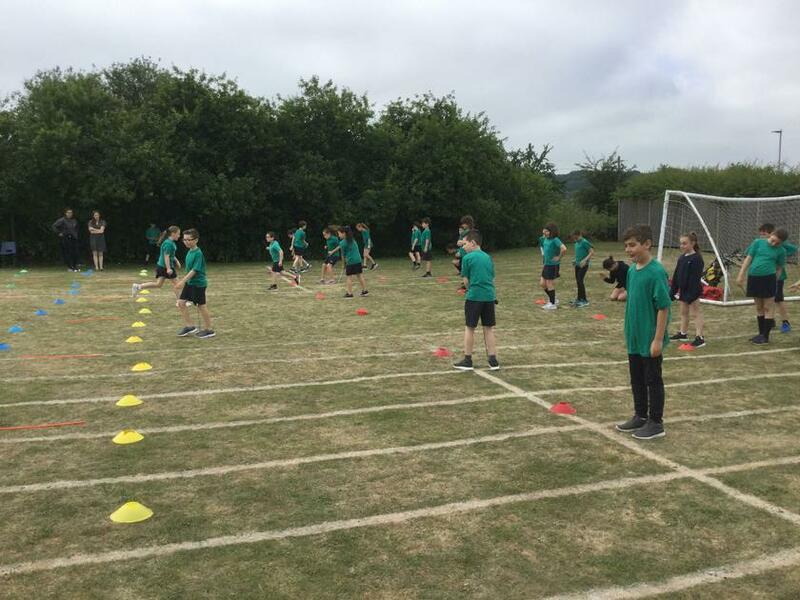 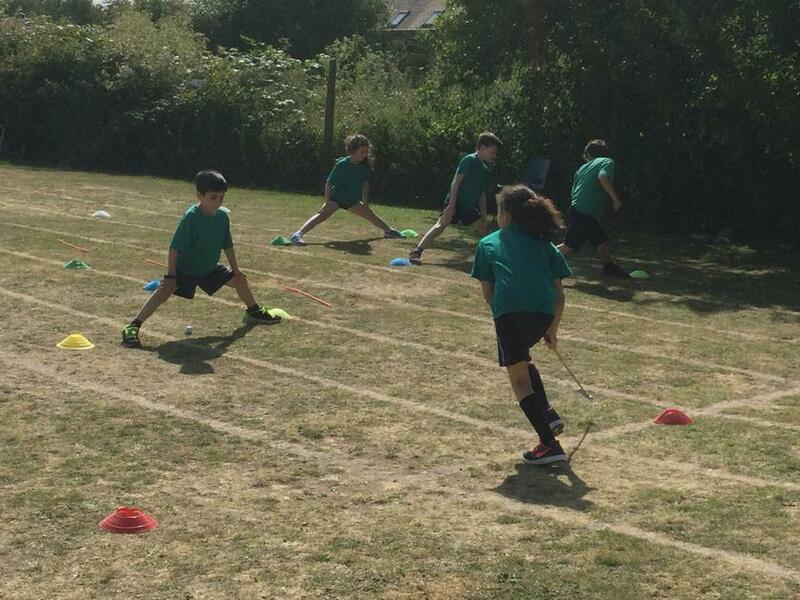 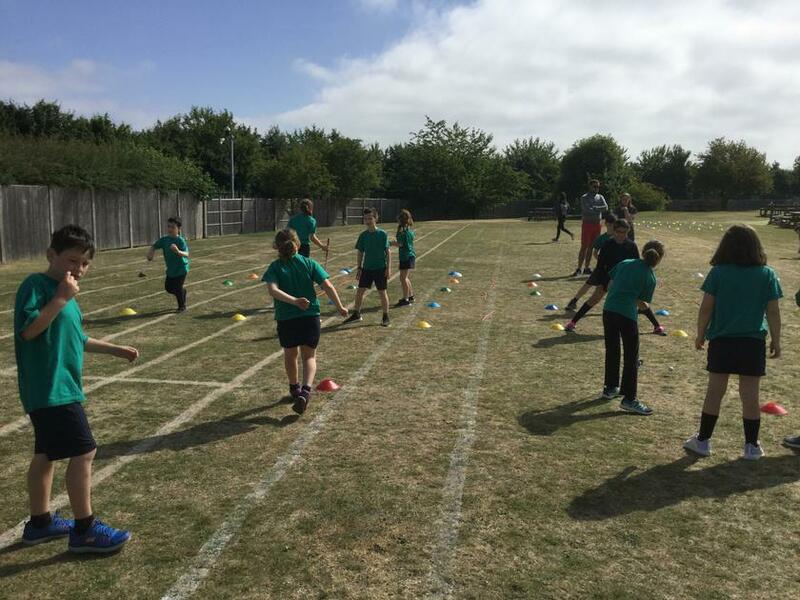 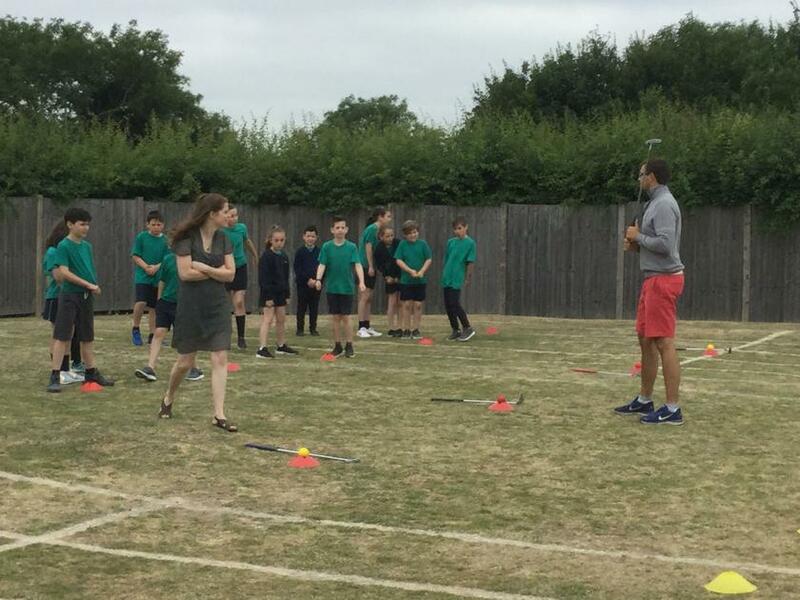 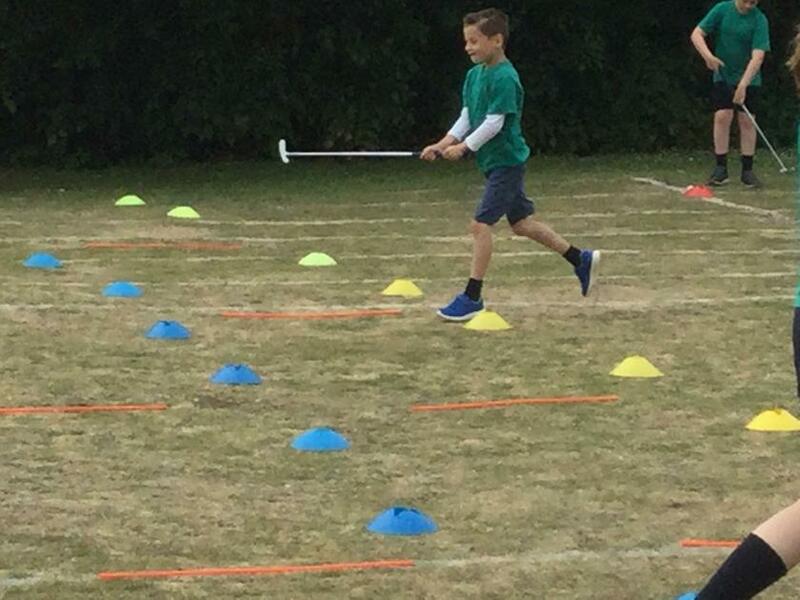 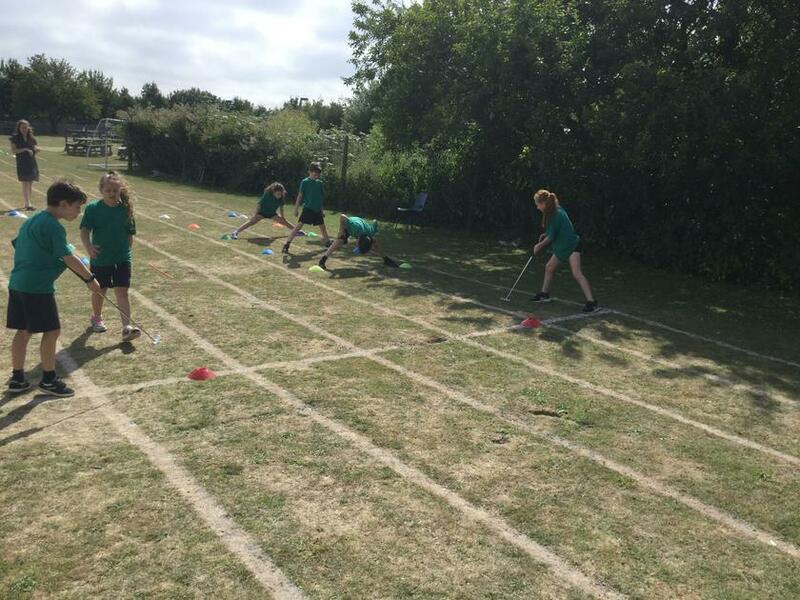 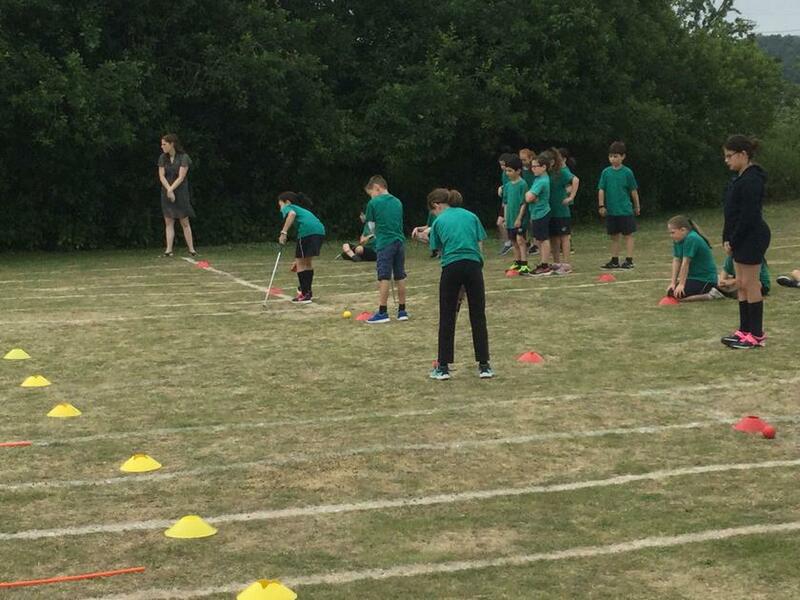 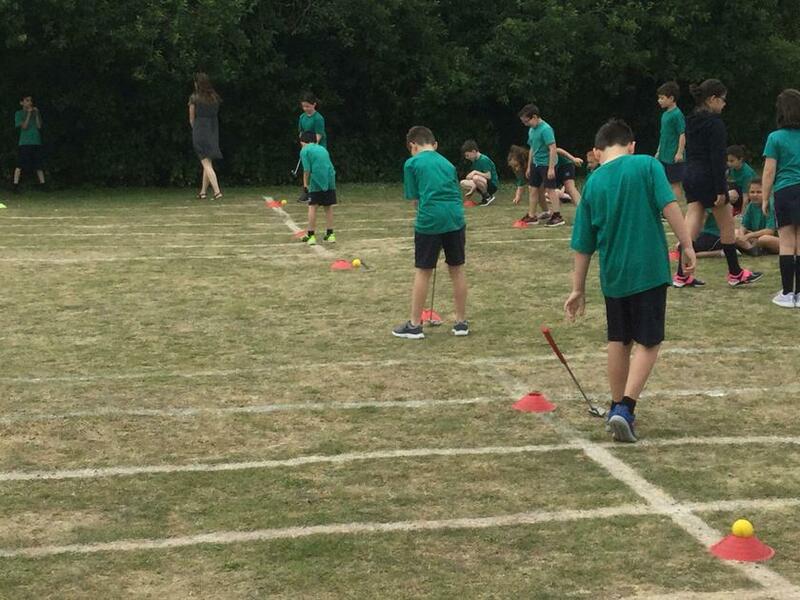 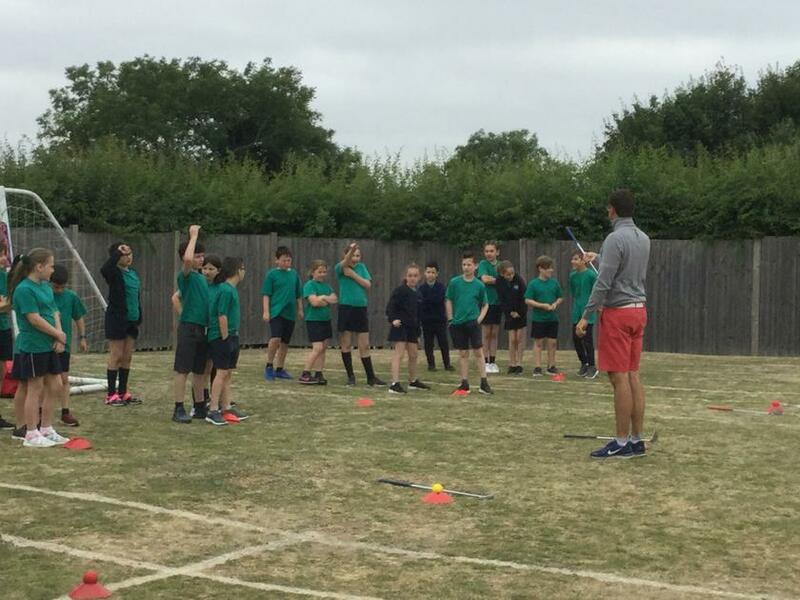 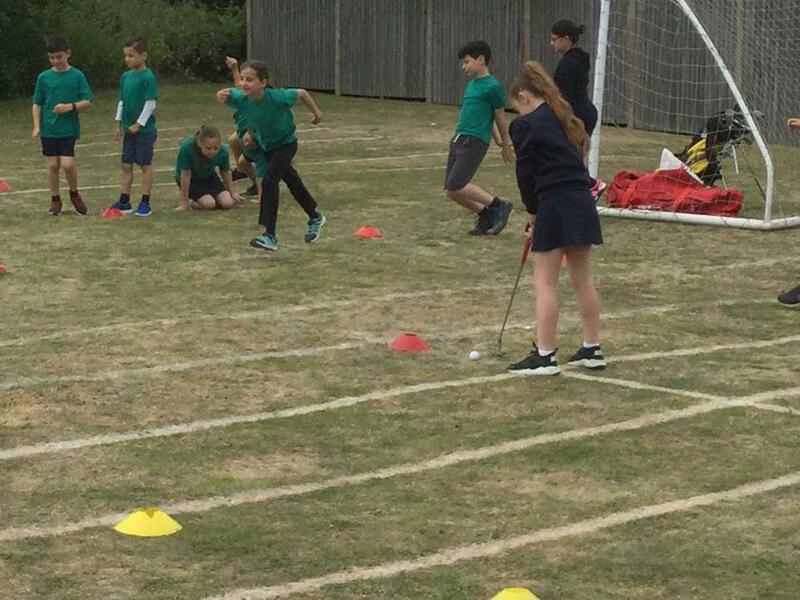 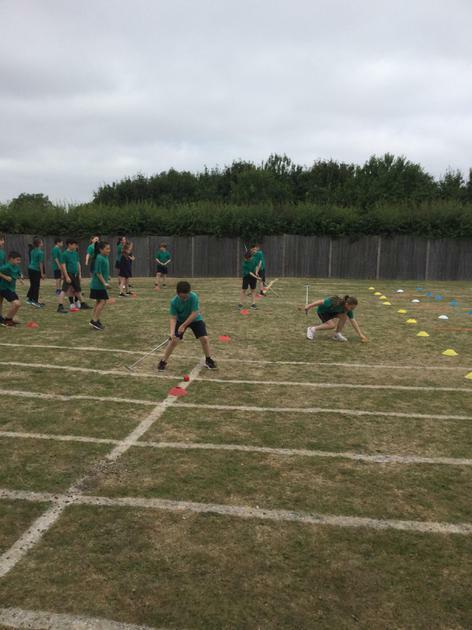 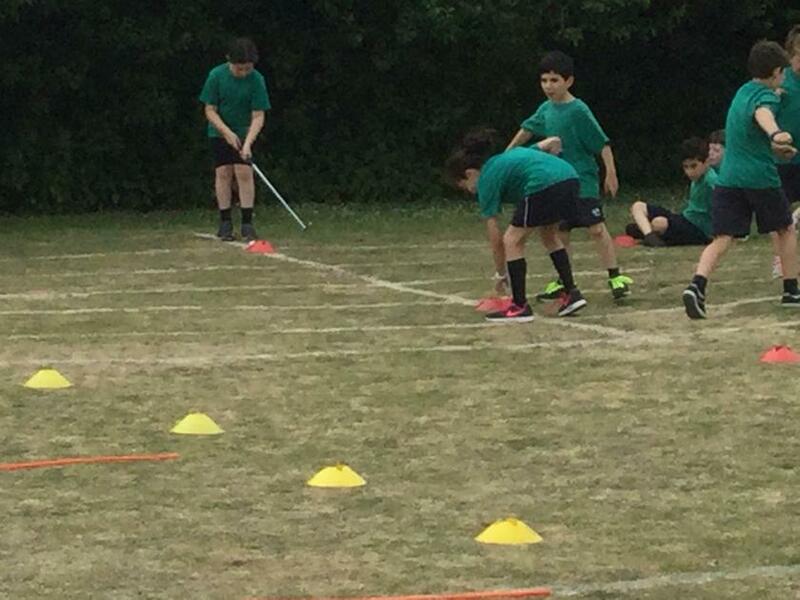 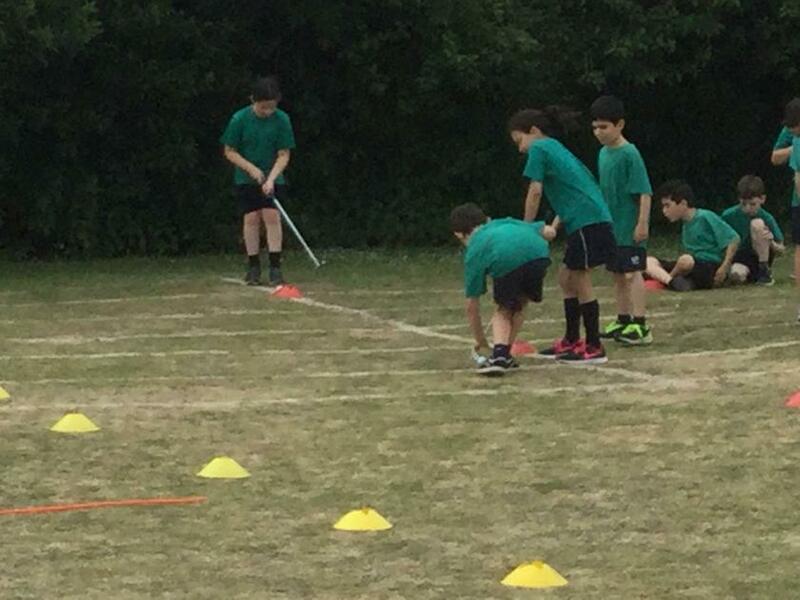 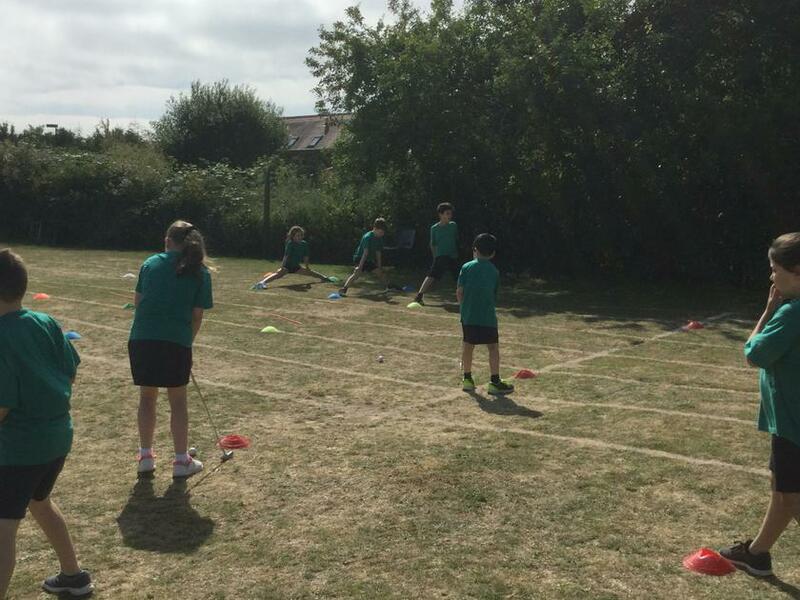 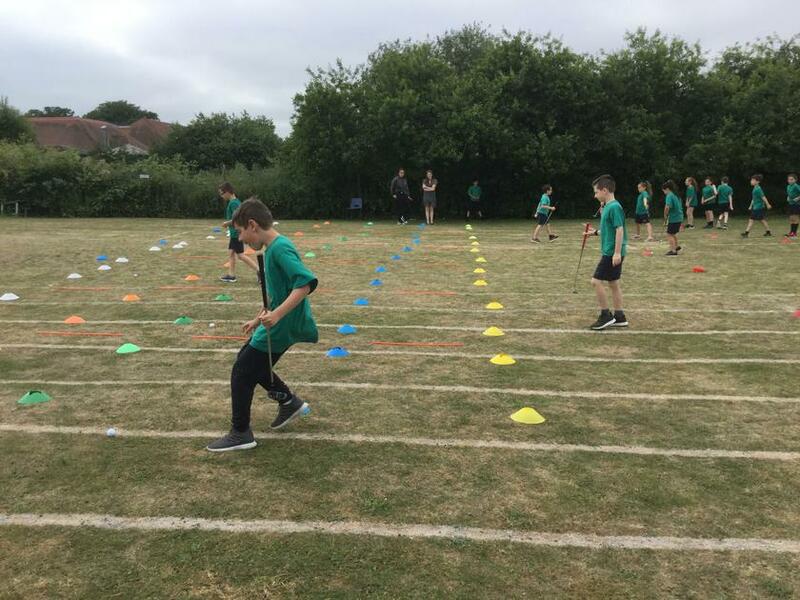 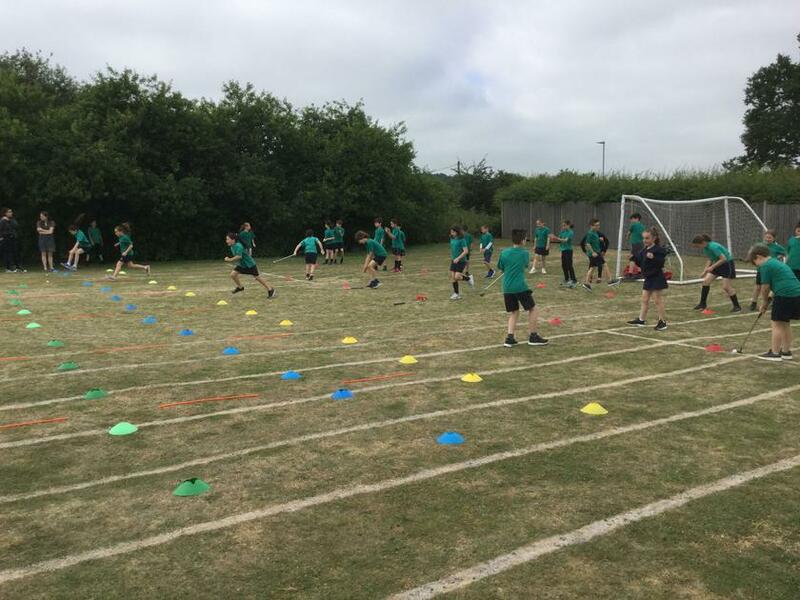 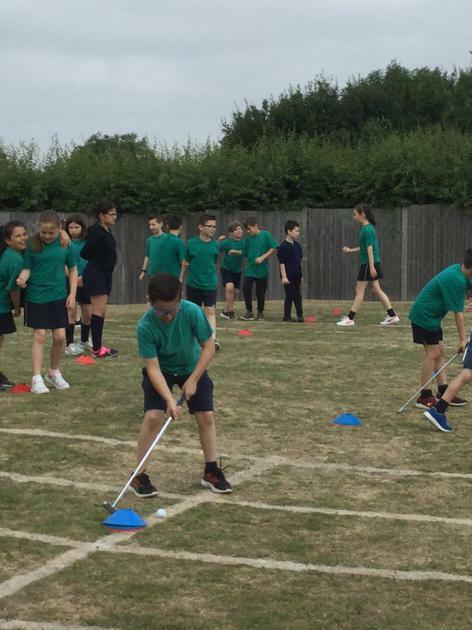 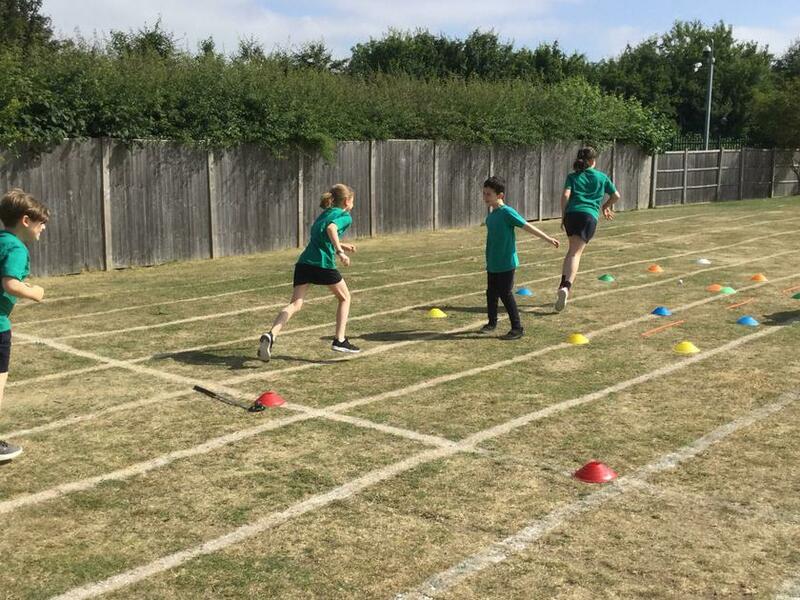 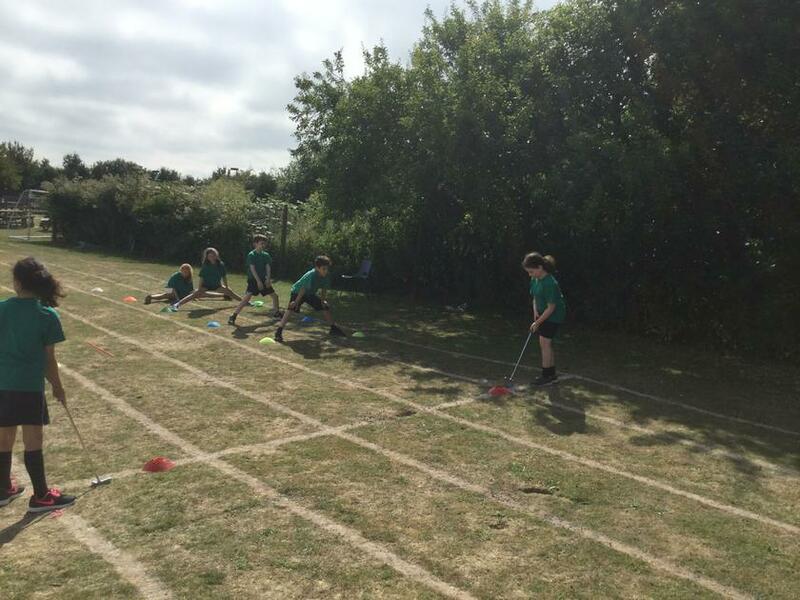 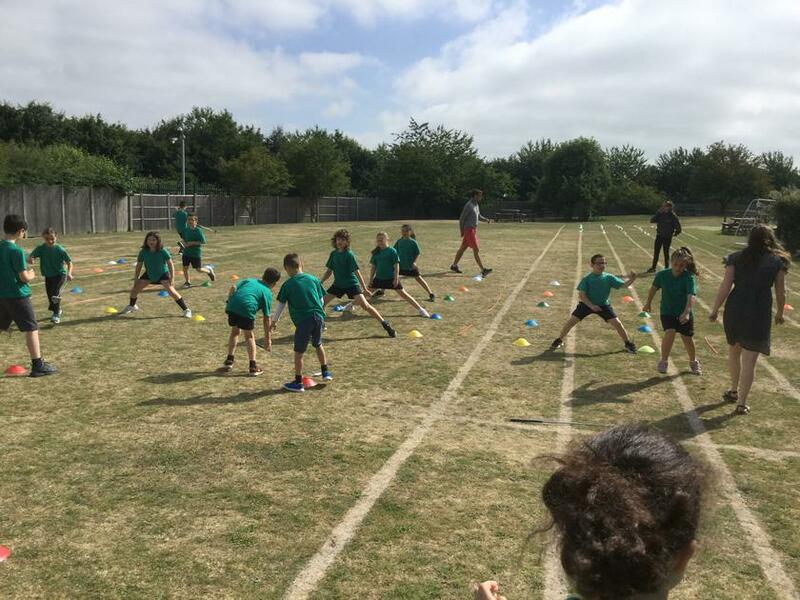 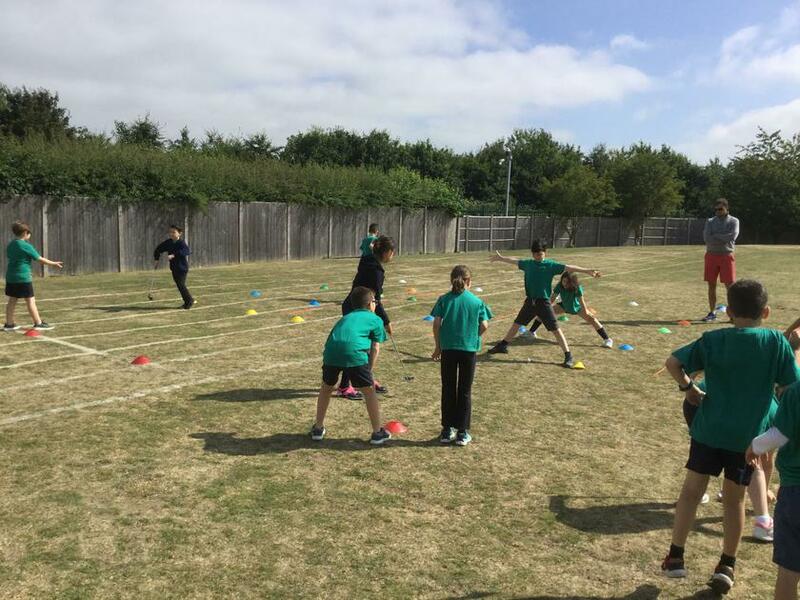 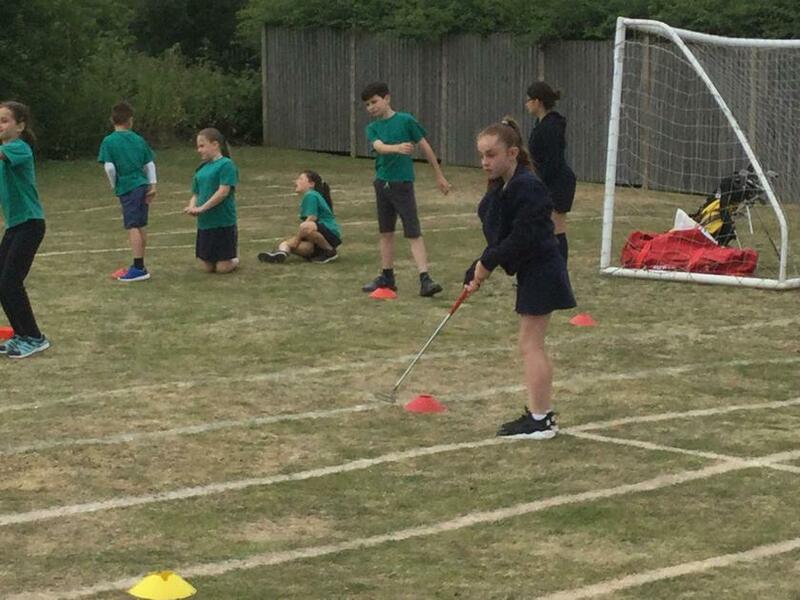 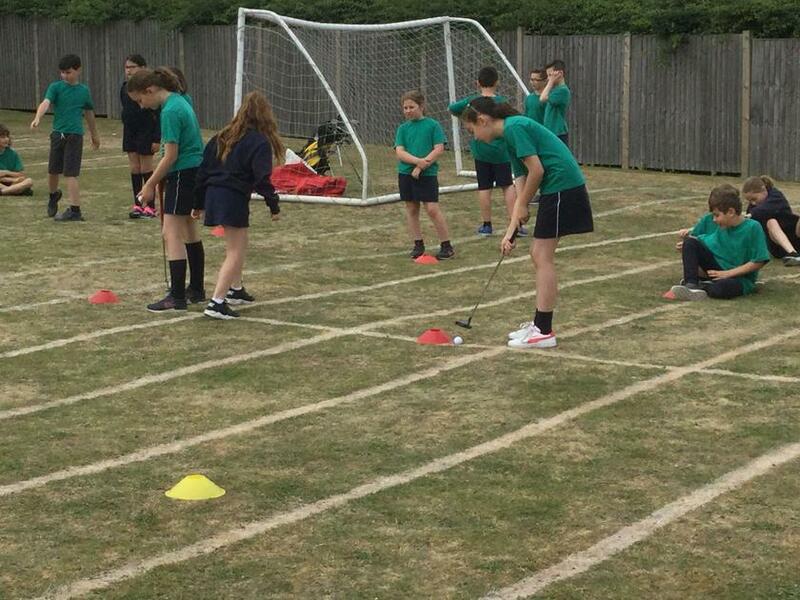 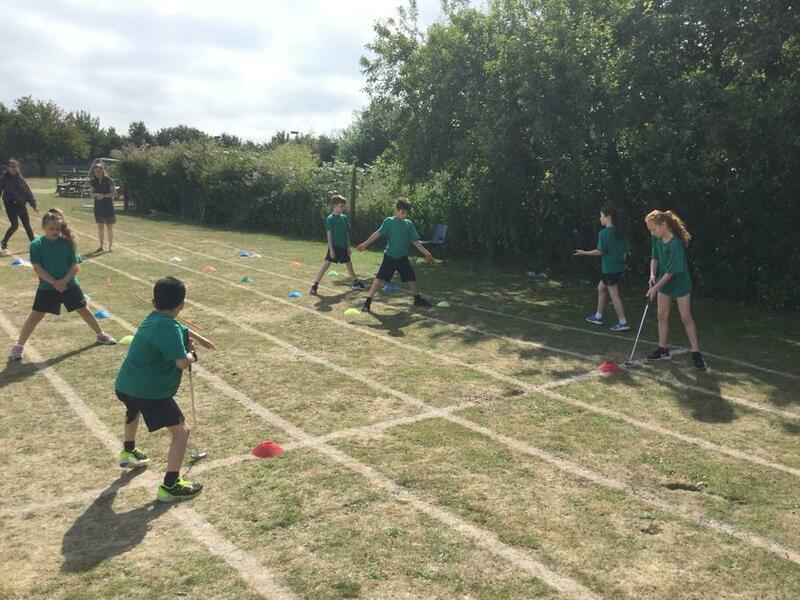 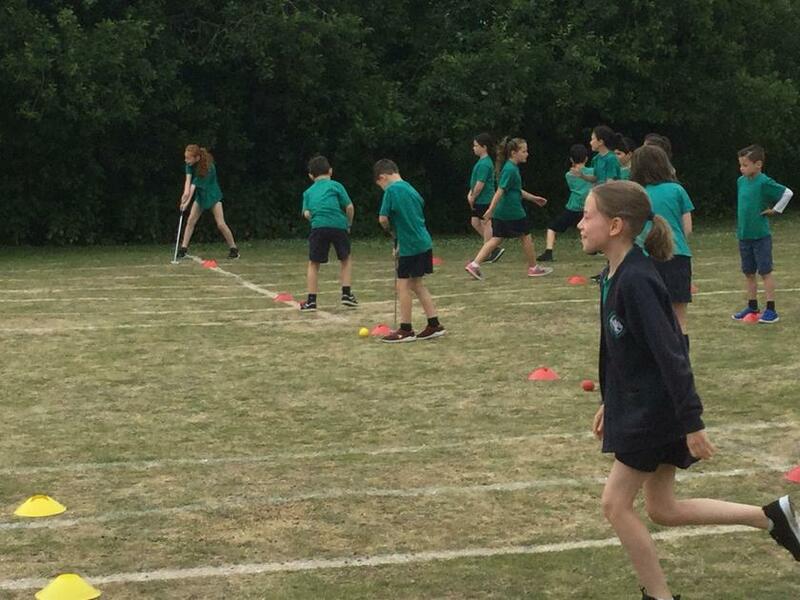 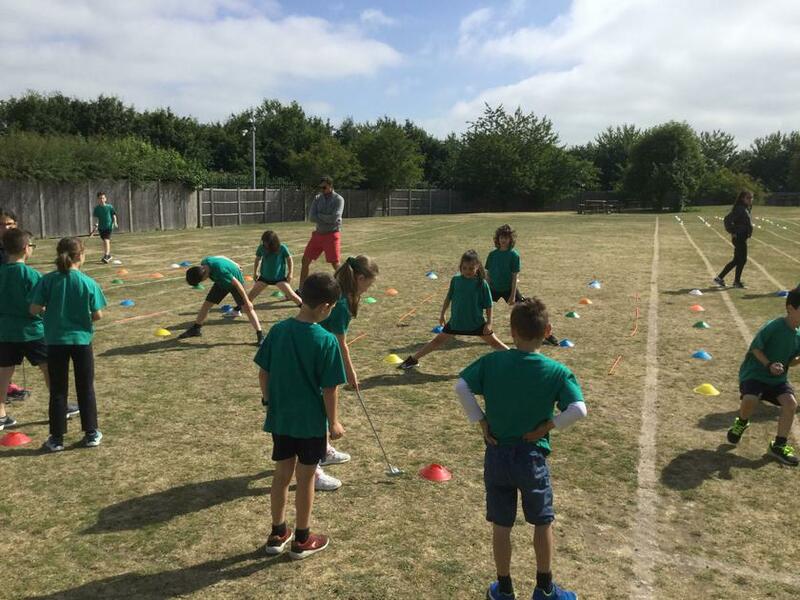 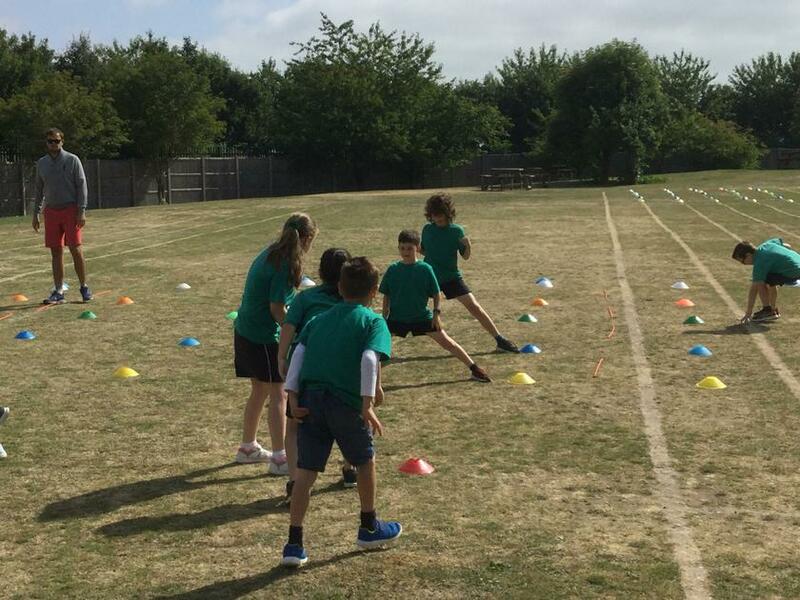 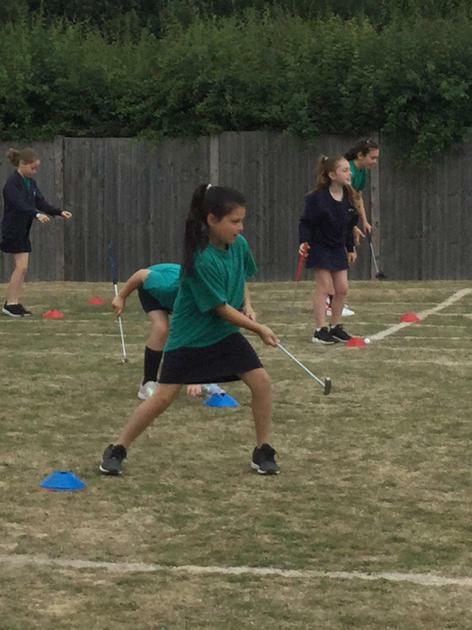 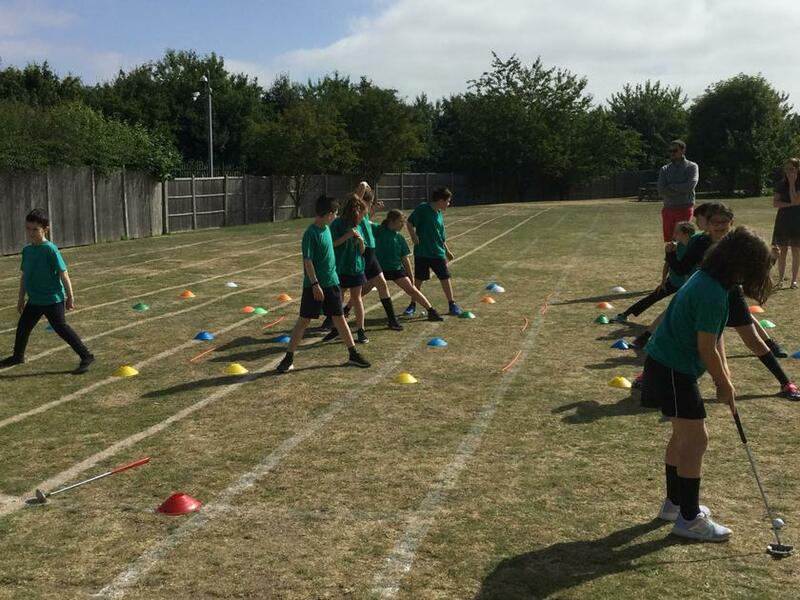 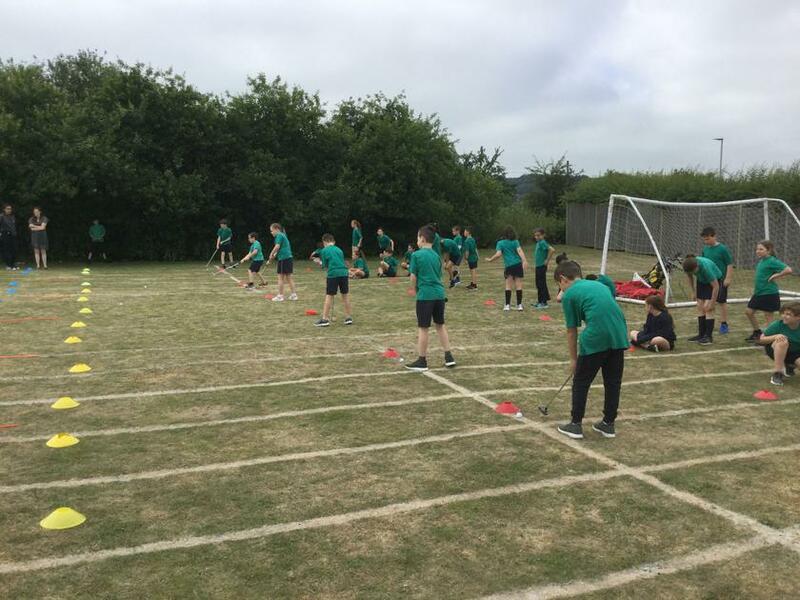 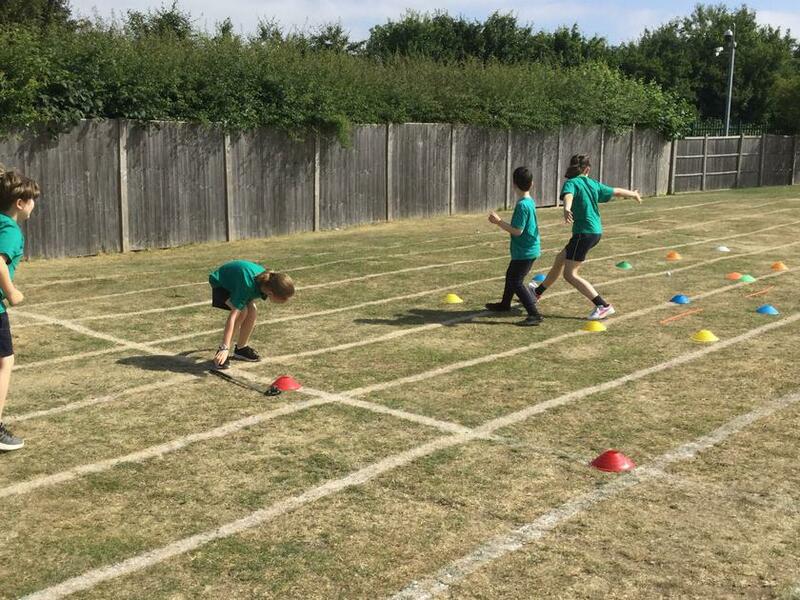 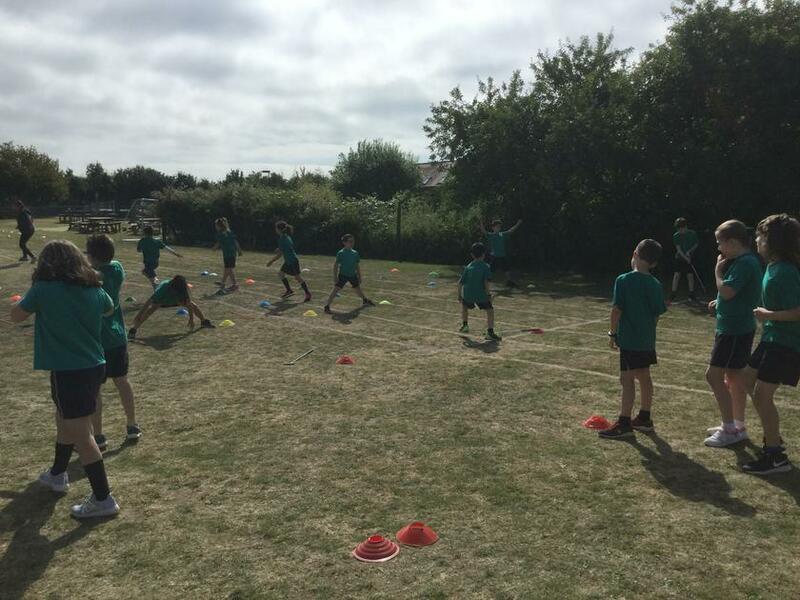 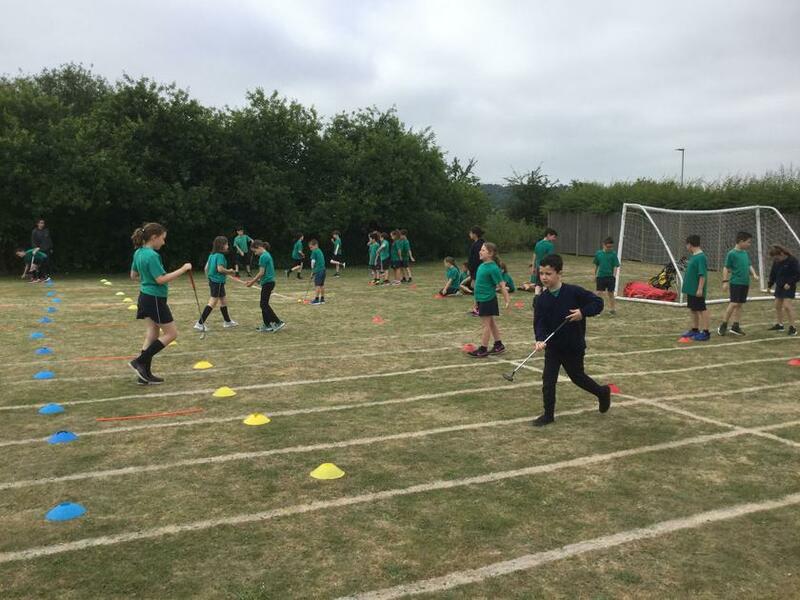 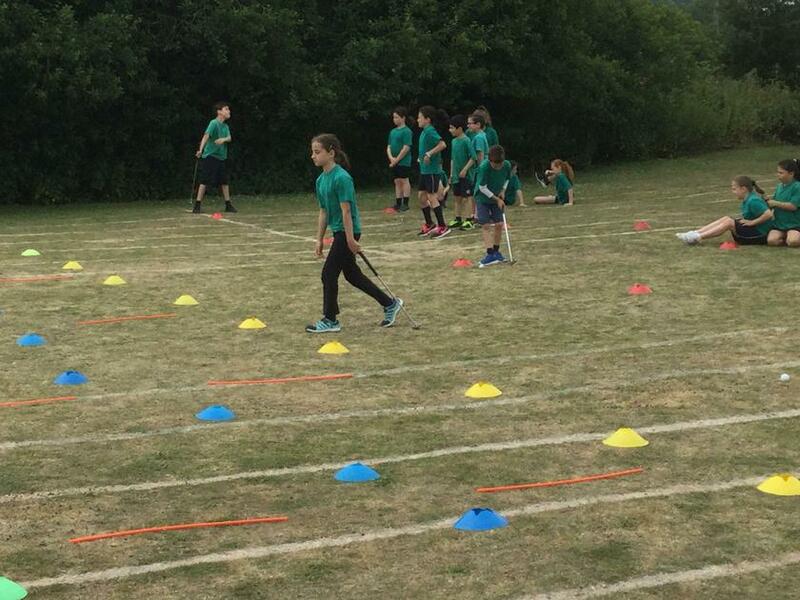 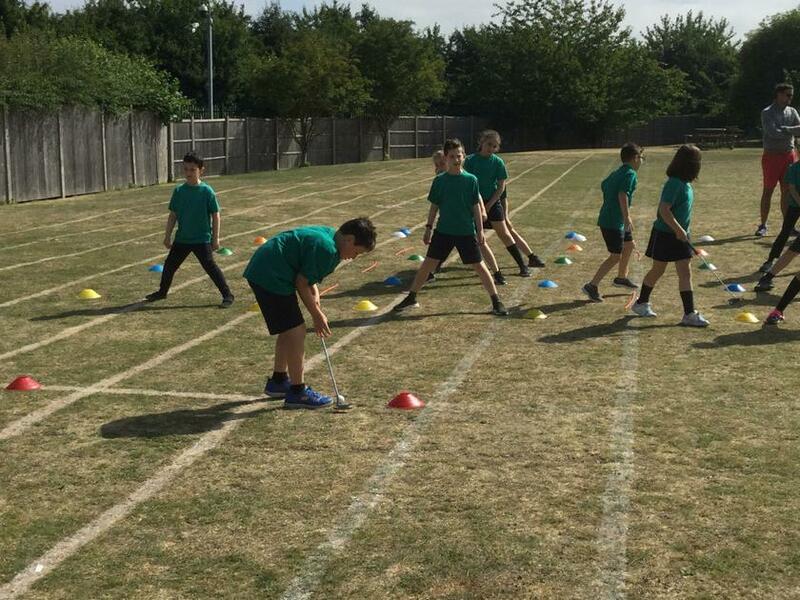 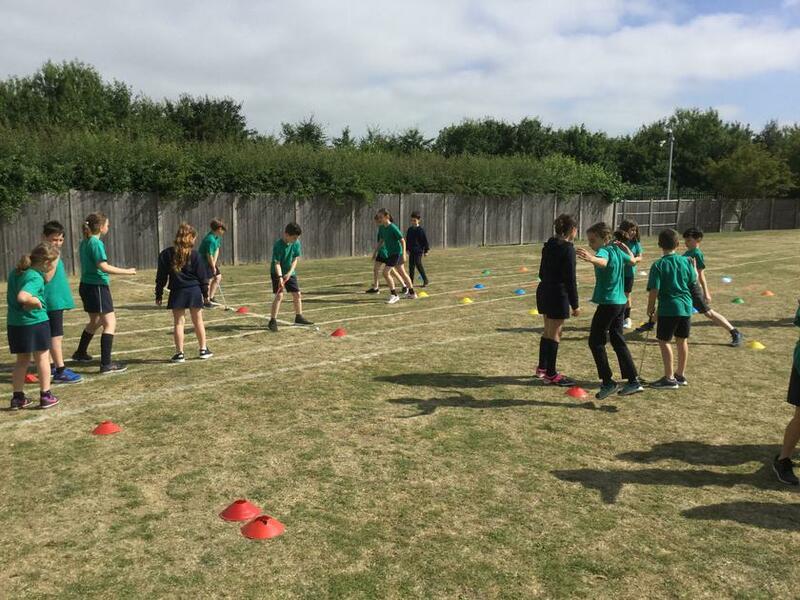 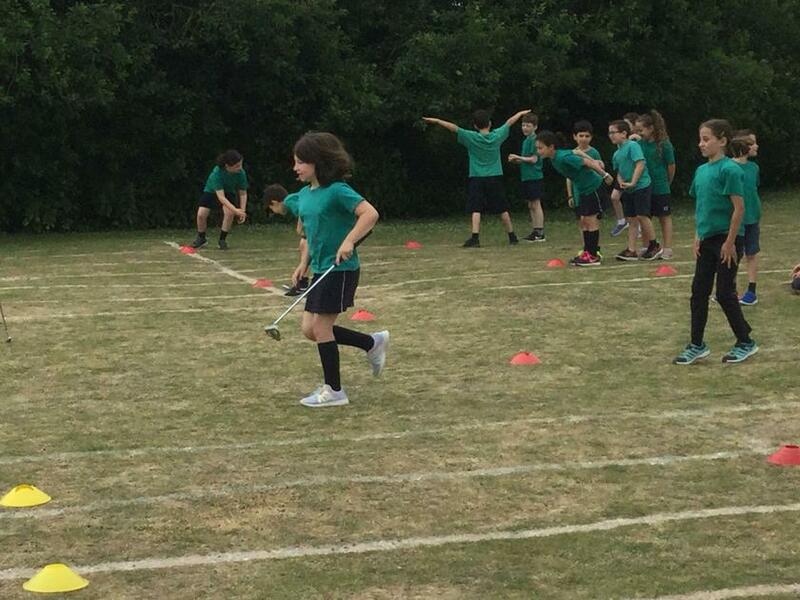 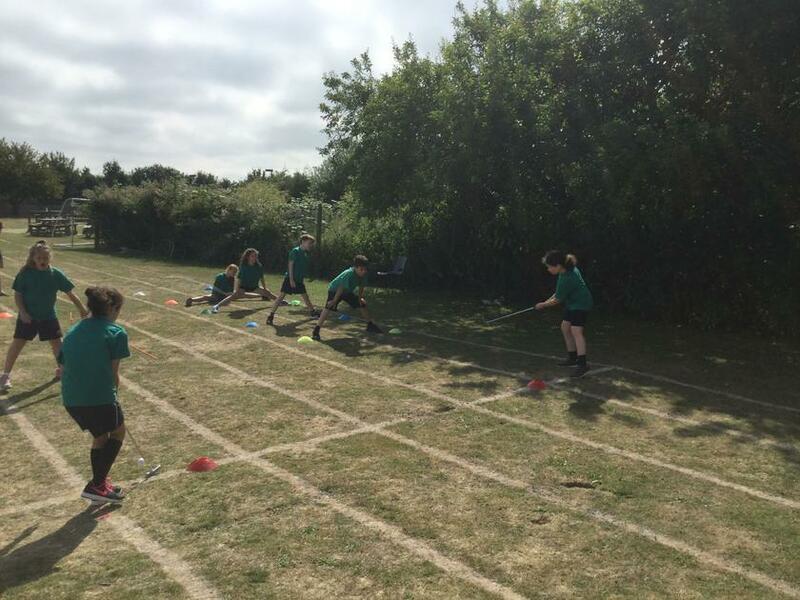 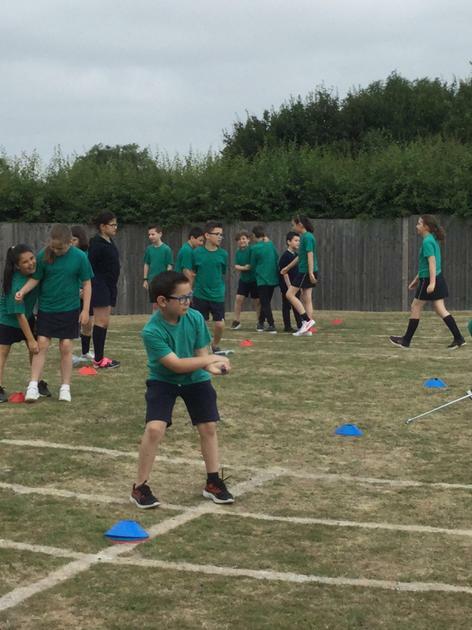 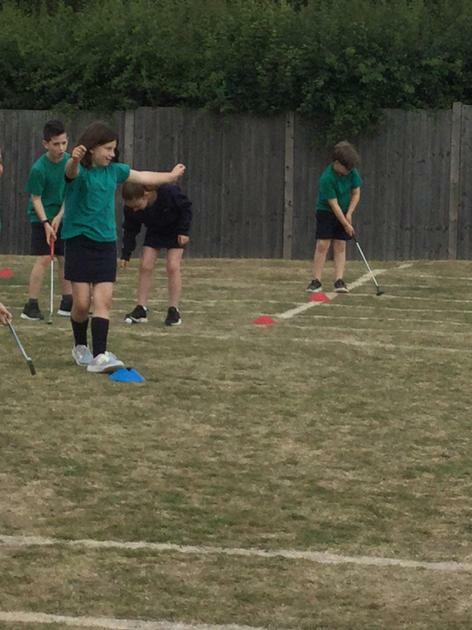 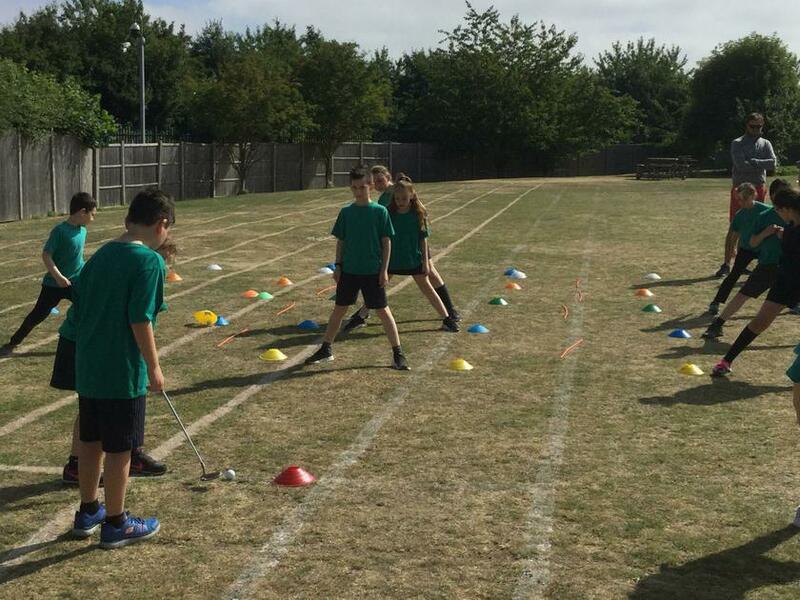 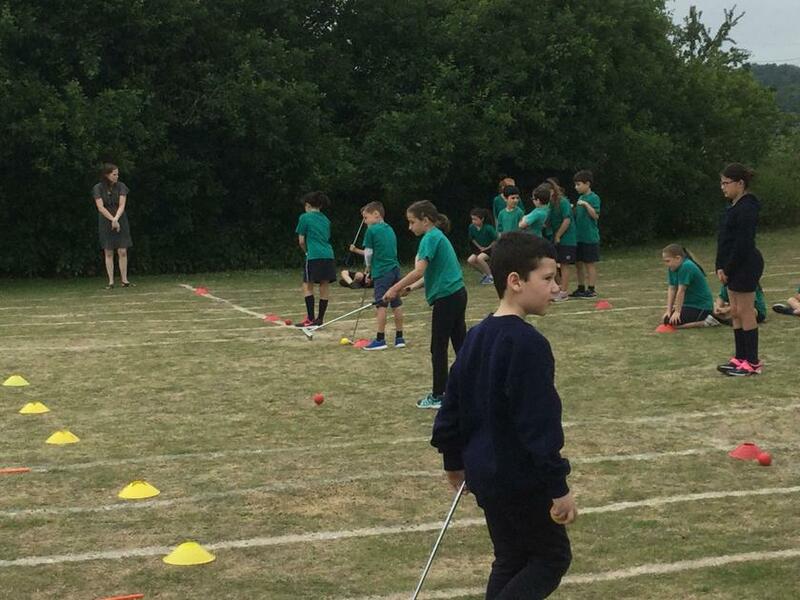 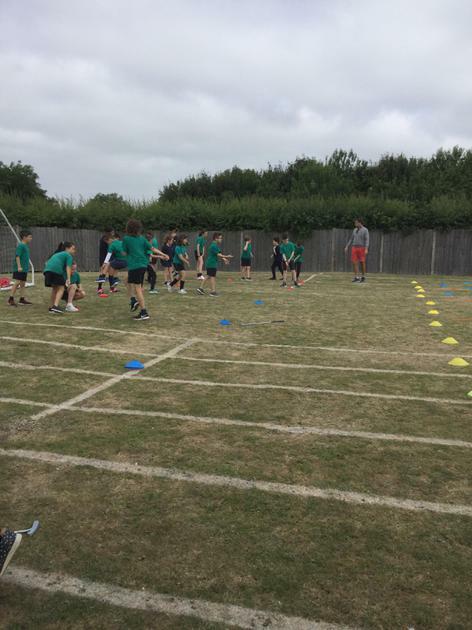 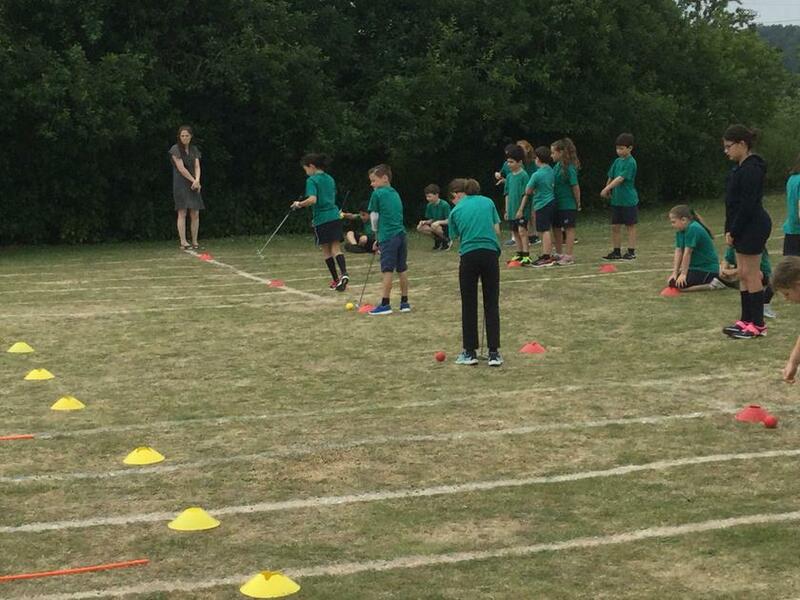 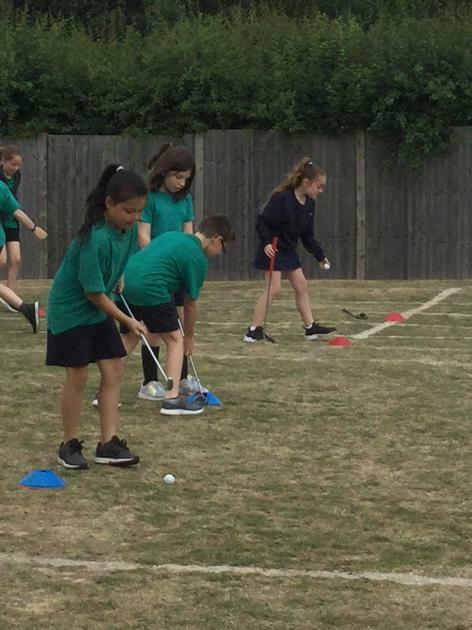 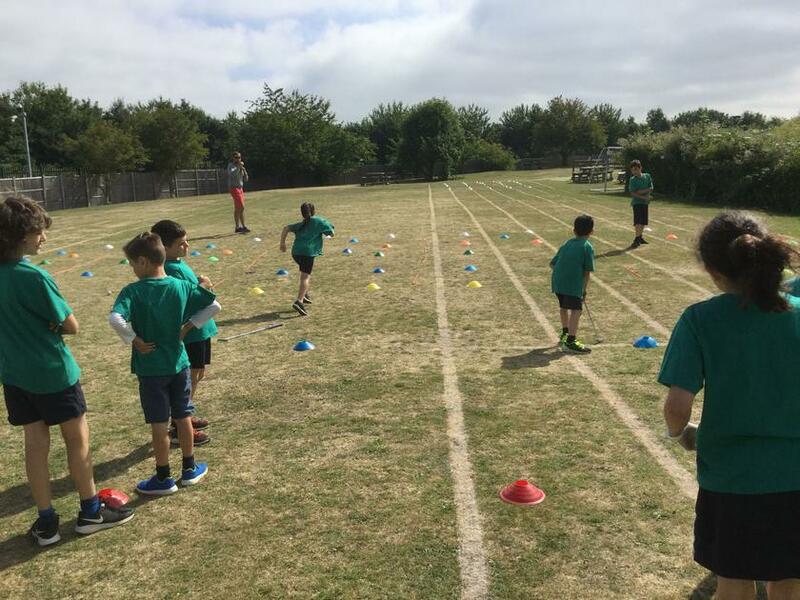 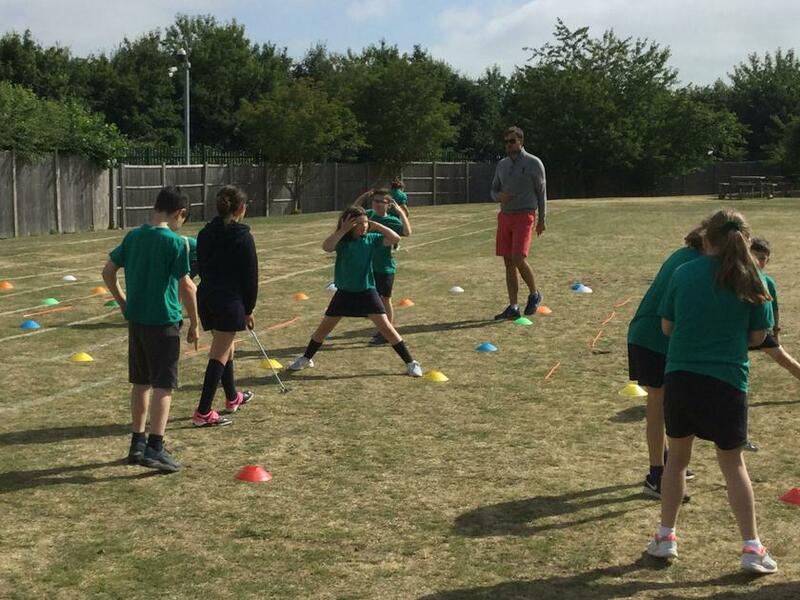 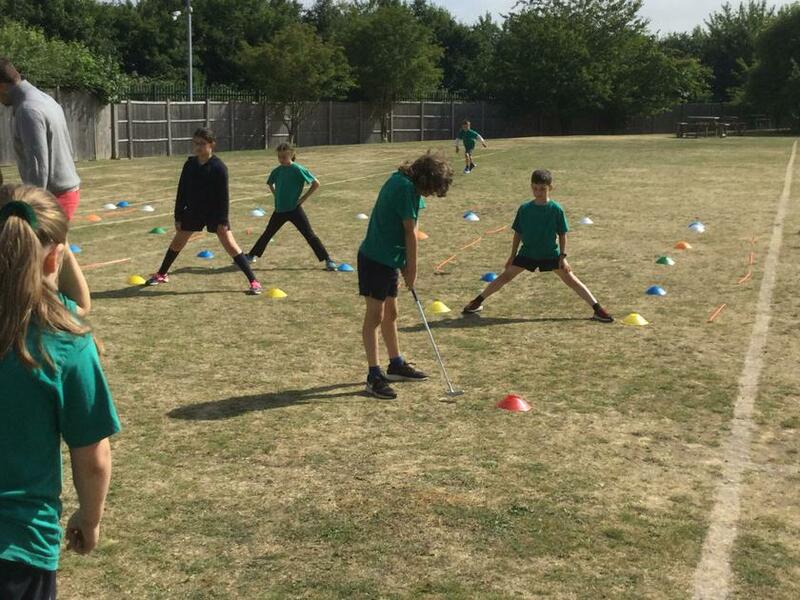 Year 4 had an amazing time during this year's Sports Week. 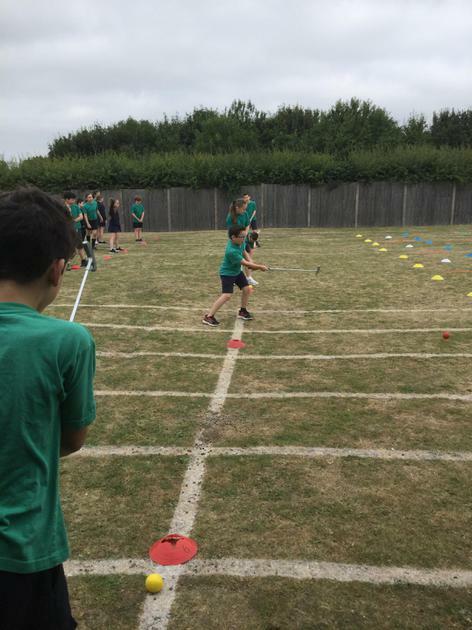 All of the Houses worked together to complete loads of fun activities and the school had quite a positive buzz all week long. 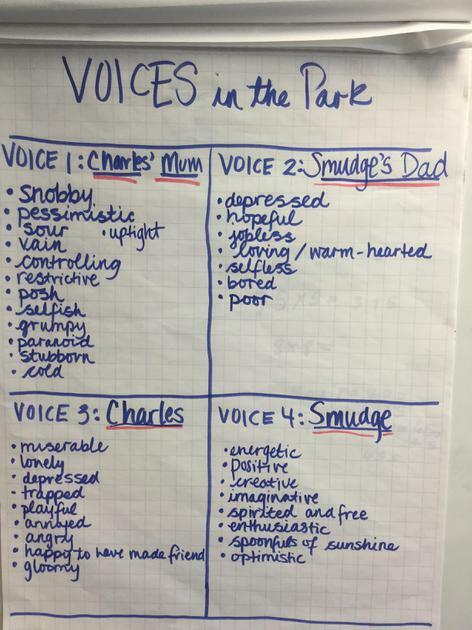 To start off the final term of this academic year, every class at Clore is learning about the same text--Voices in the Park by Anthony Browne. 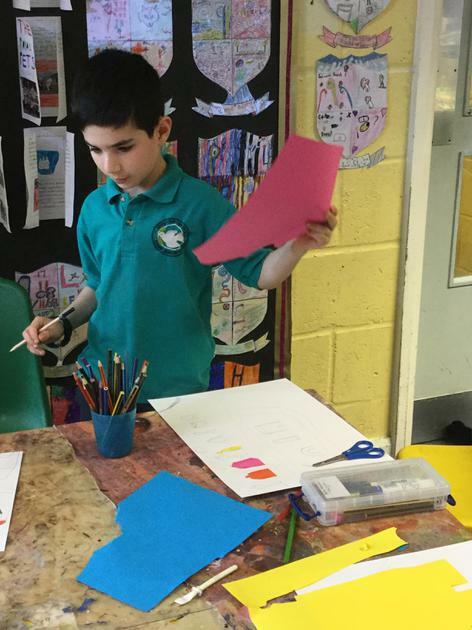 We've started the week by exploring the artwork and language used in the book and closely studying the differences in the 4 main characters. 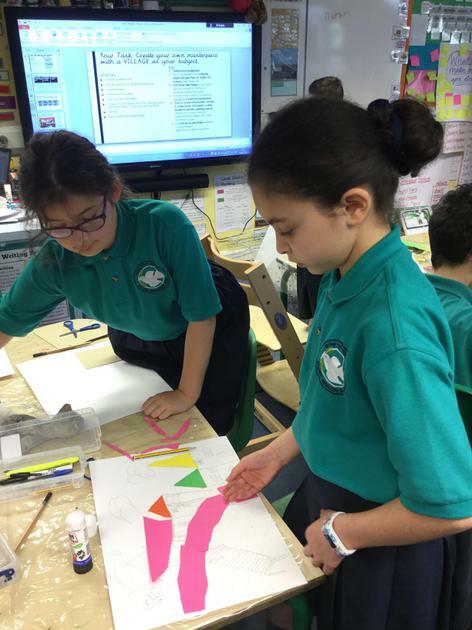 The class studied this illustration and found that it is loaded with symbolism! 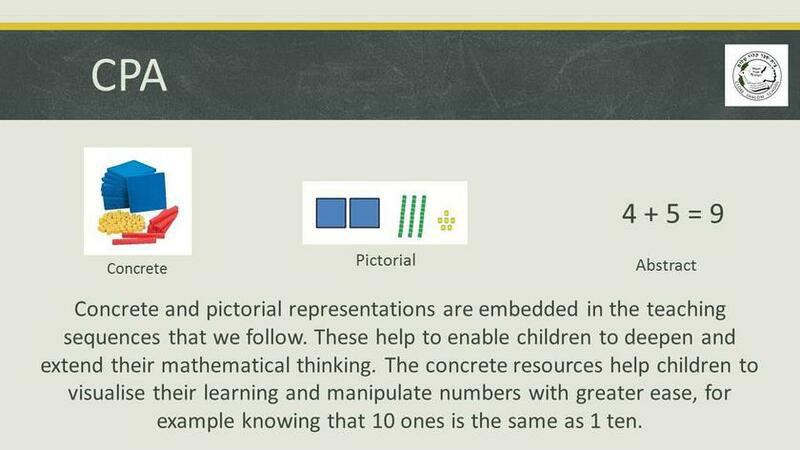 Ask your child(ren) what they can tell you about this picture. 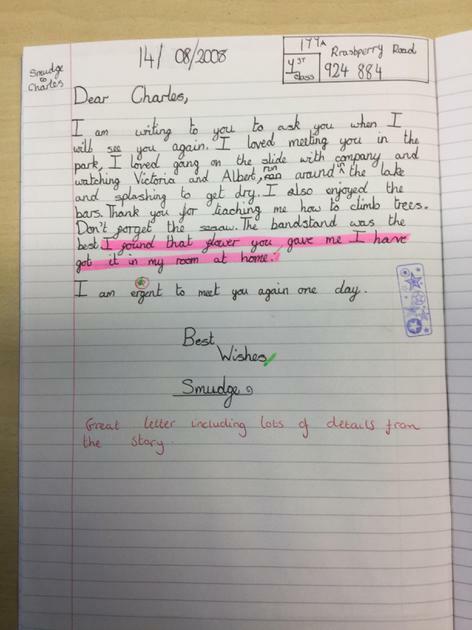 Letter from character Charles to character Smudge, written by Barney P.
Letter from character Smudge to character Charles, written by Maya S.
This week, each Year 4 student has planned and written a story based on the novel The Butterfly Lion by Michael Morpurgo. 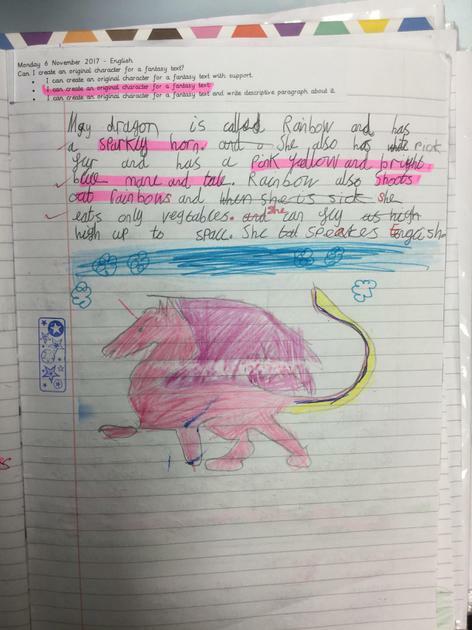 The 5 paragraph stories are told from the lion's perspective after he'd been chased away from the safety of his caretakers and left to roam the African veld on his own. 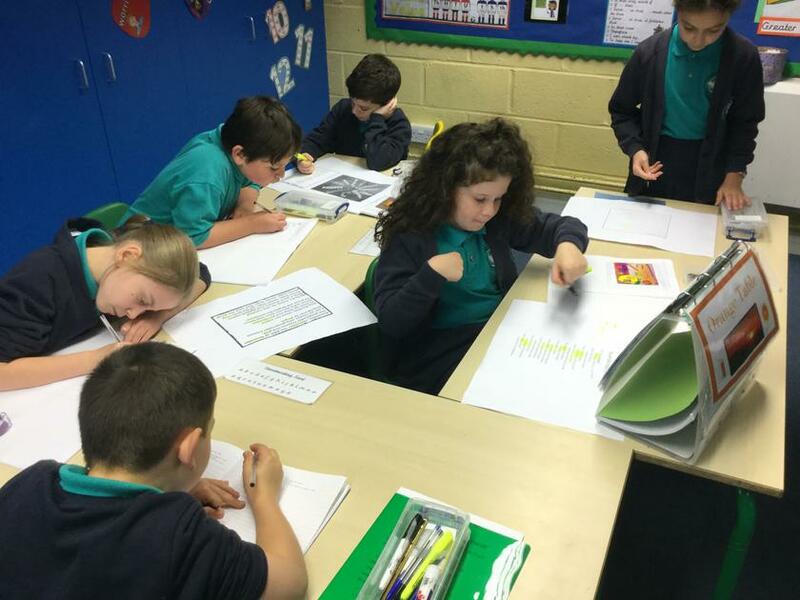 The class focused their attention on using emotive language to create an emotional response on the part of the reader. 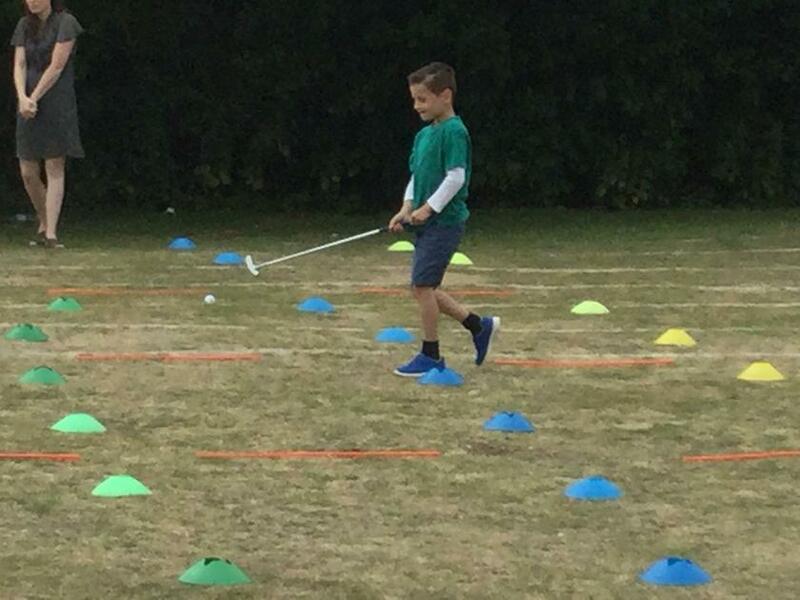 "I couldn't see because of the pitch darkness that was covering Africa like a blanket. 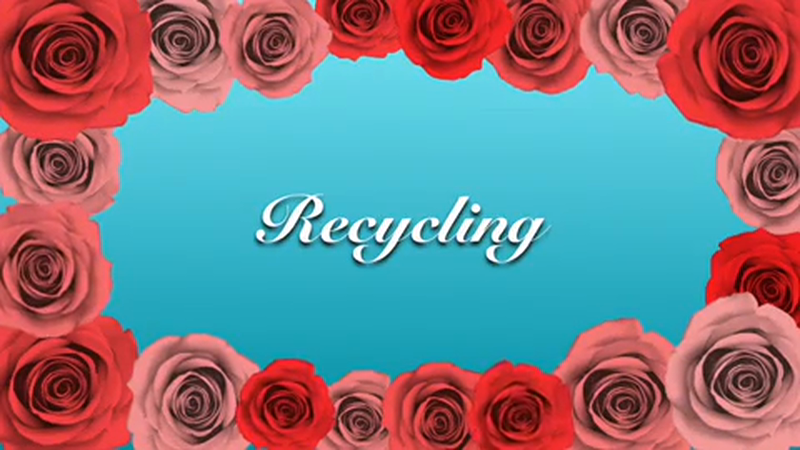 Tear were streaming down my face, soaking into my fur." 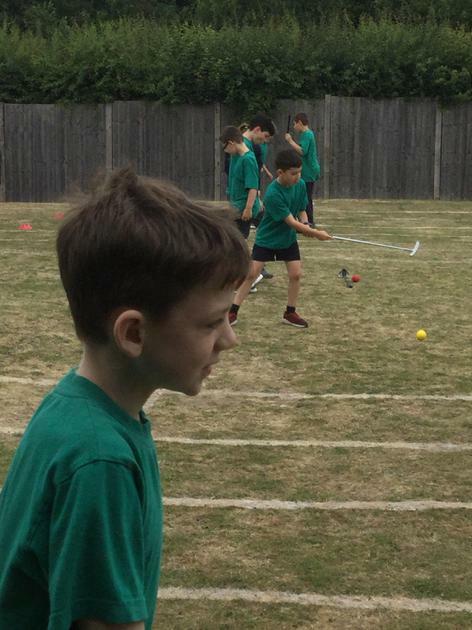 -Poppy S.
"...Bertie pulled out a shotgun, faced it towards me and BANG BANG! 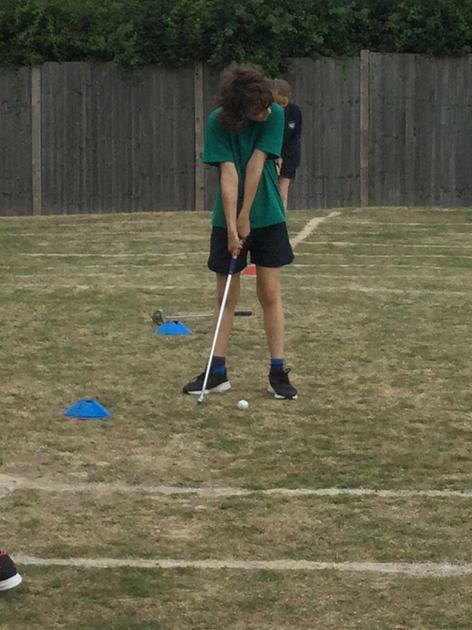 I had to dodge the bullets so I ran into pitch dark night." 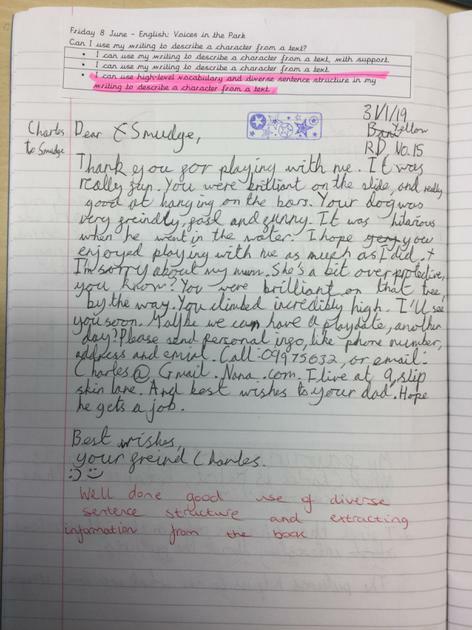 -Raphy C.
"It has been a week since Bertie scared me off. 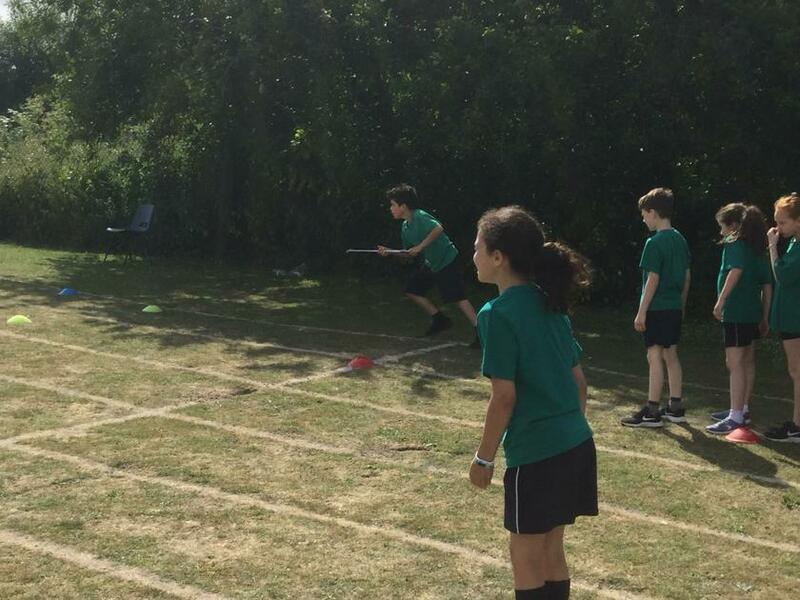 I can still hear that BANG BOOM of the gun running around in my head." 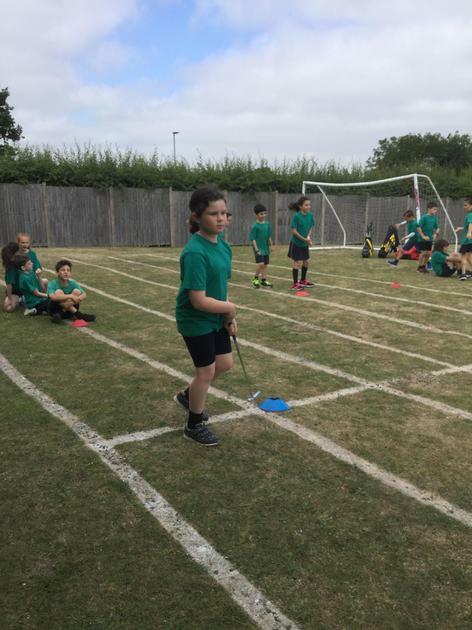 -Isobel Z. 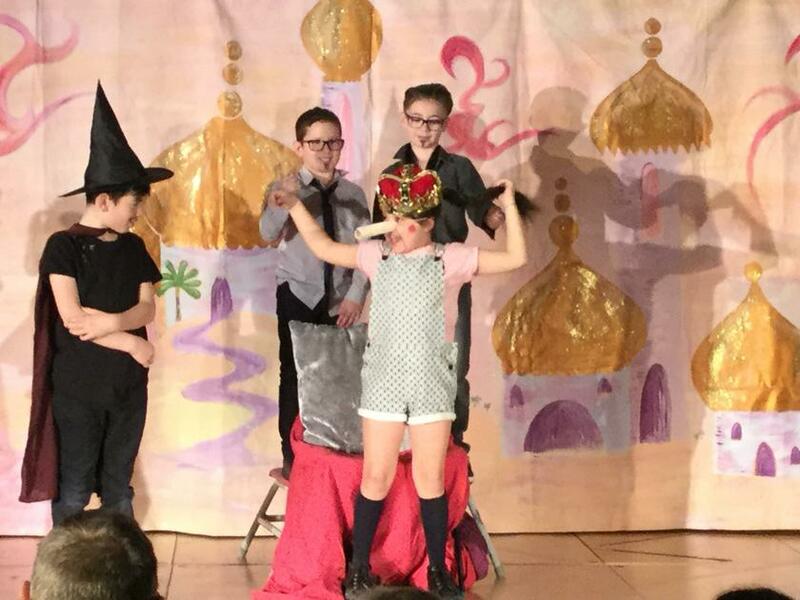 "Just then, I saw the compund. 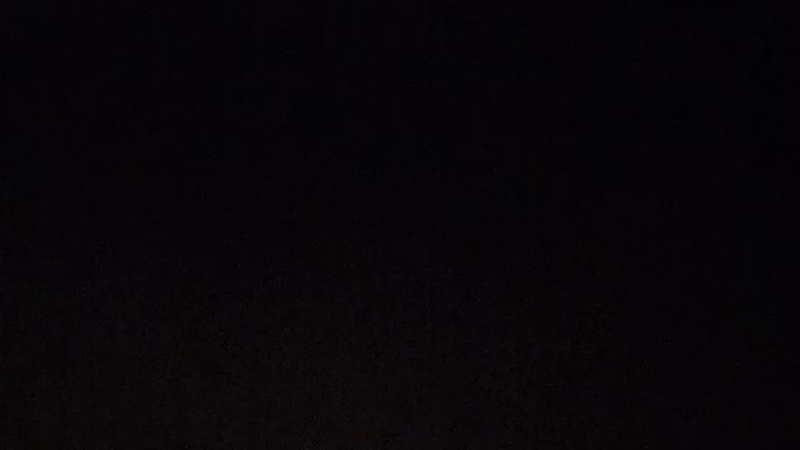 I ran to it as fast as I could. 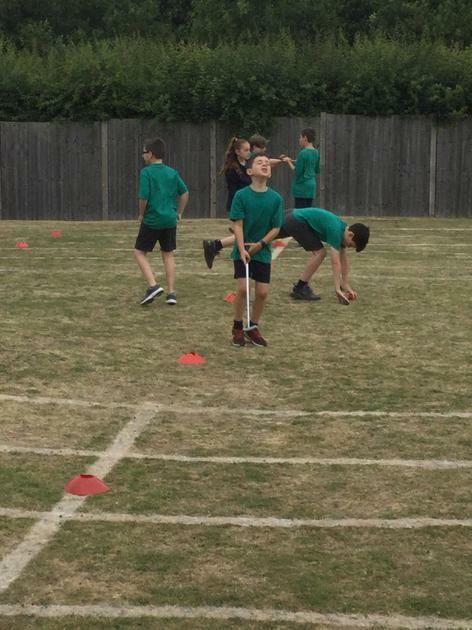 When Bertie saw me, he fell to his knees. 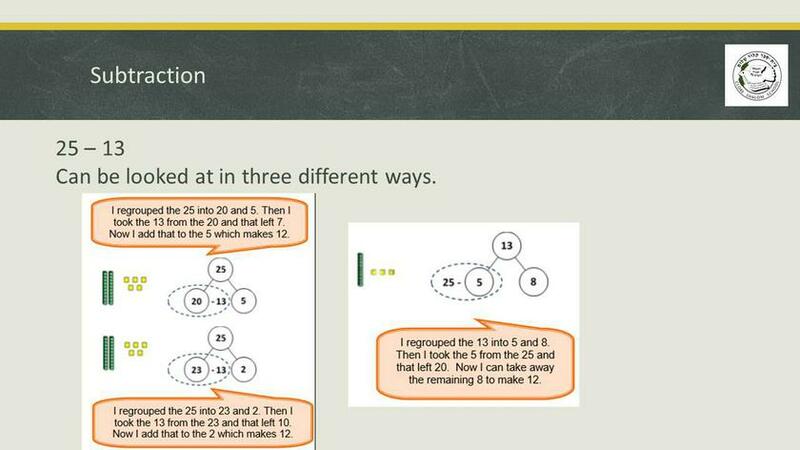 I was yowling pitifully. 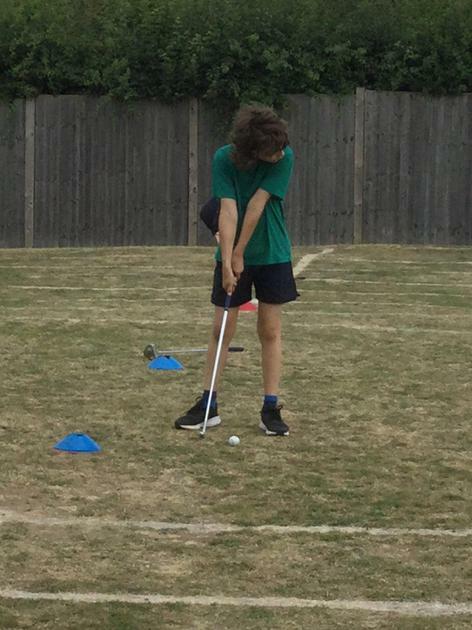 They fed me and dried me off. 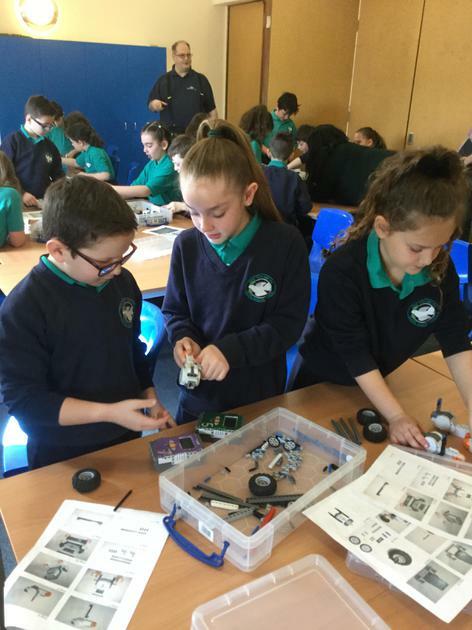 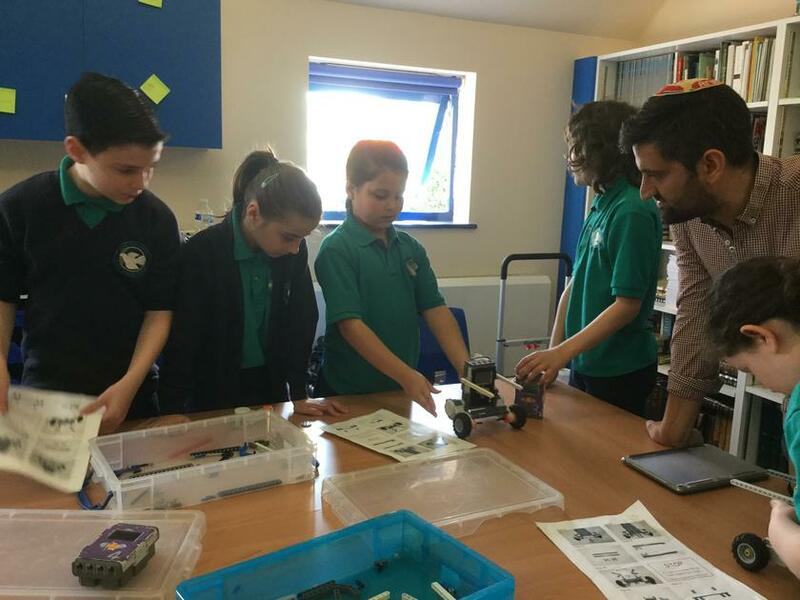 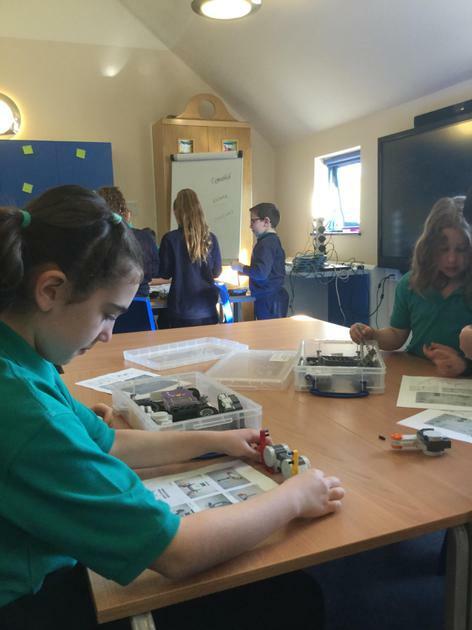 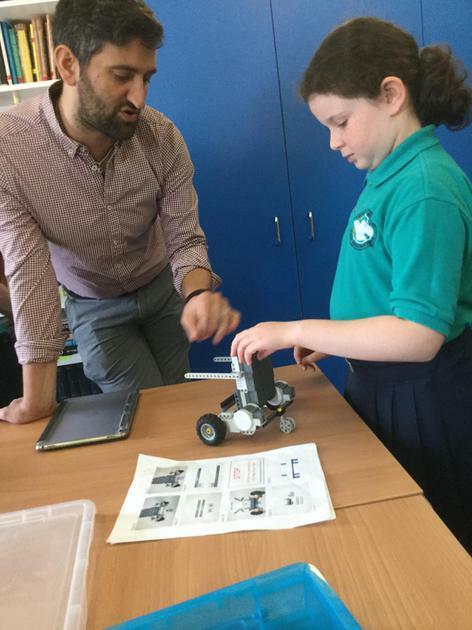 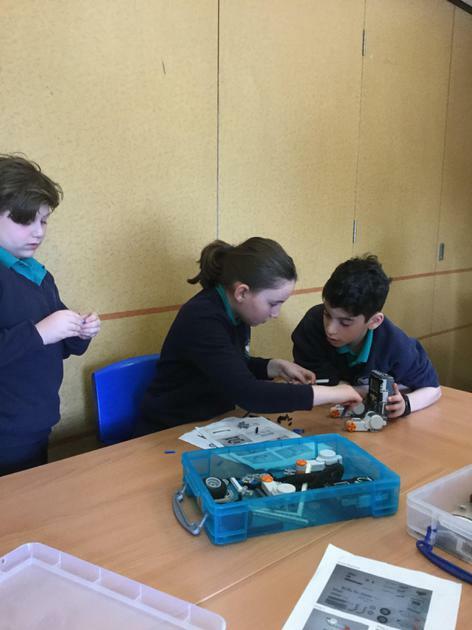 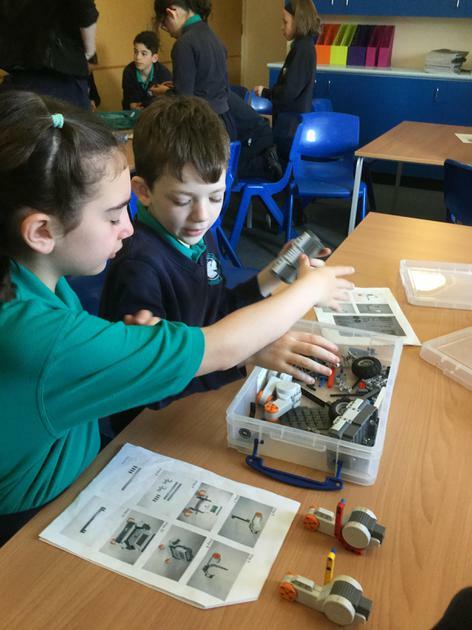 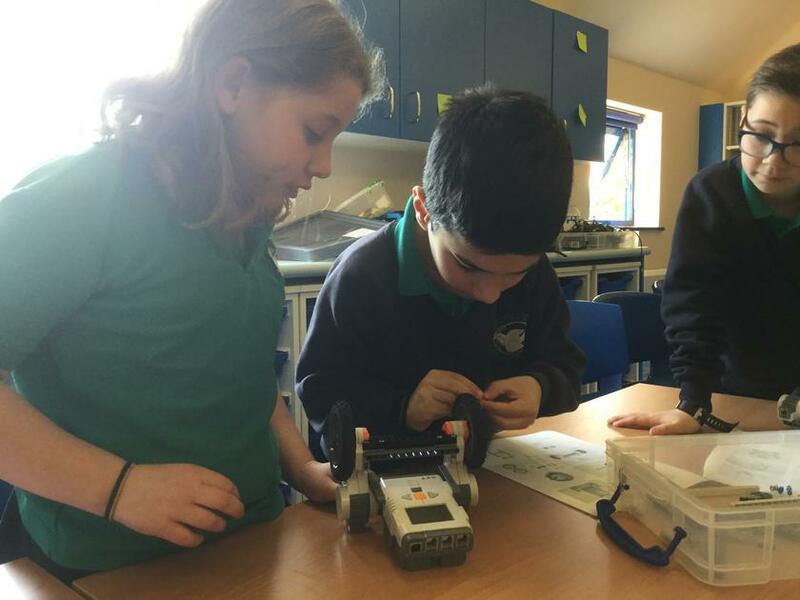 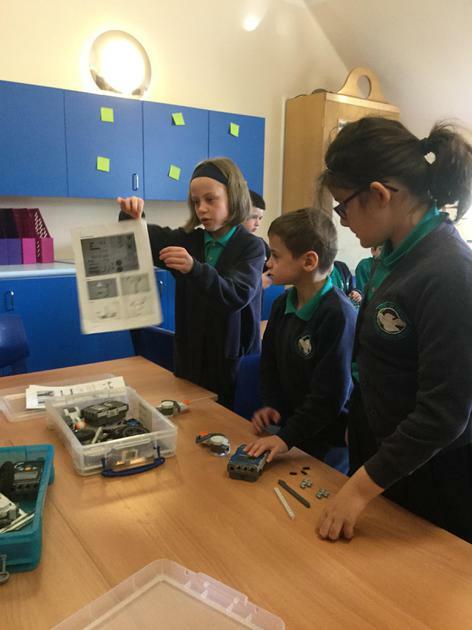 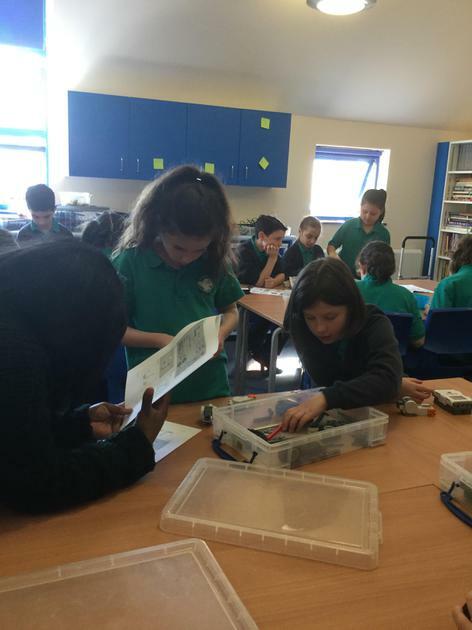 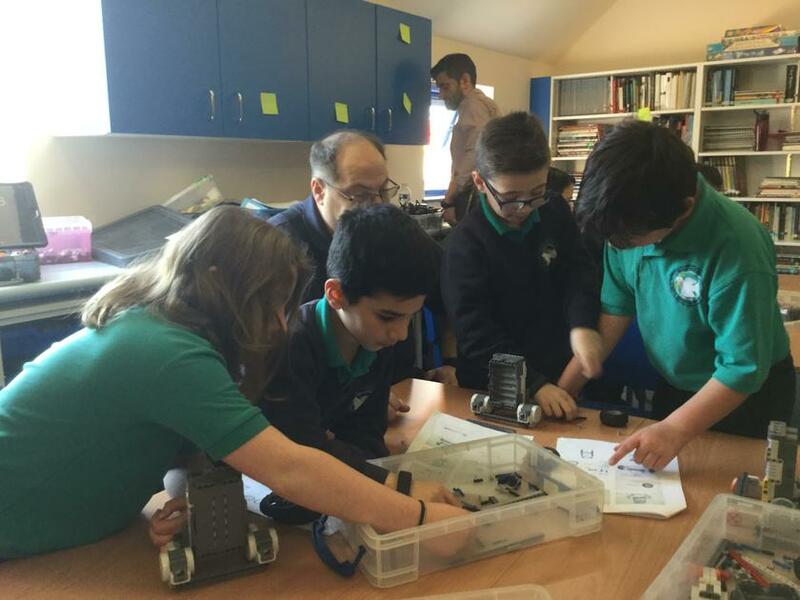 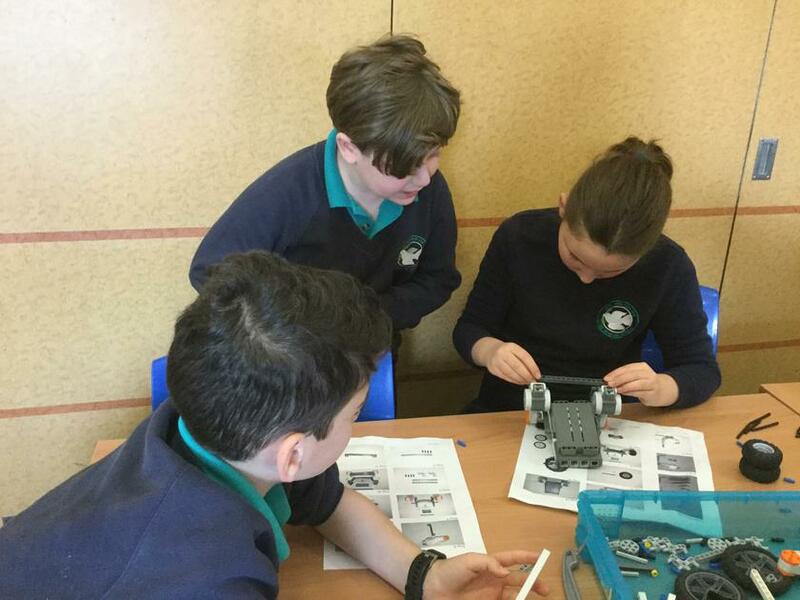 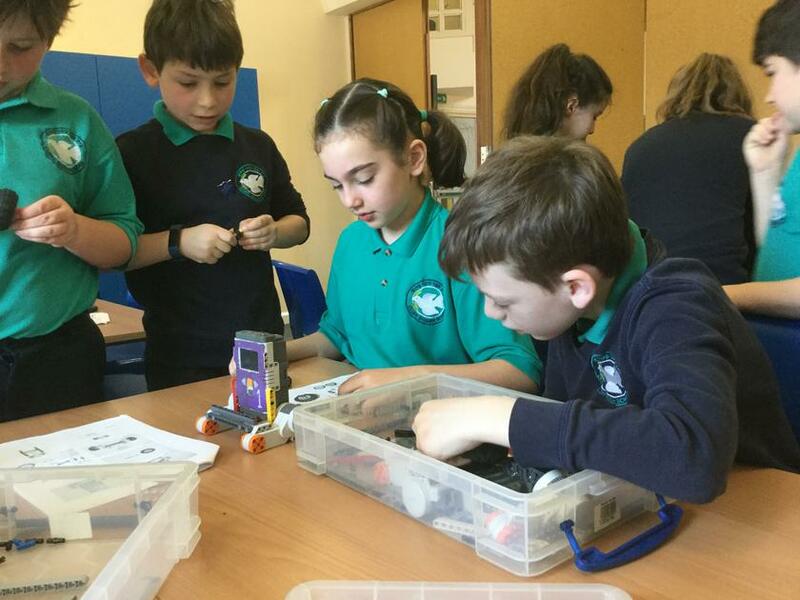 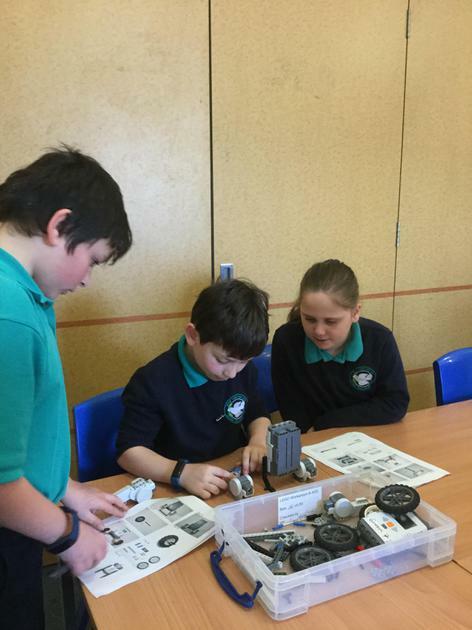 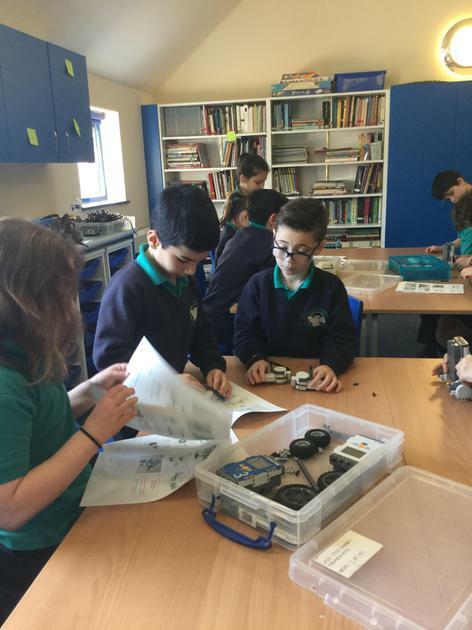 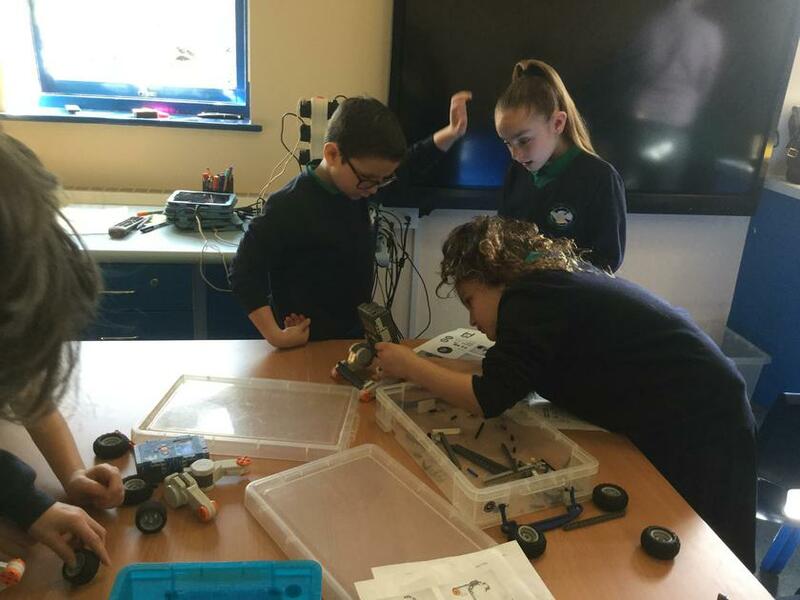 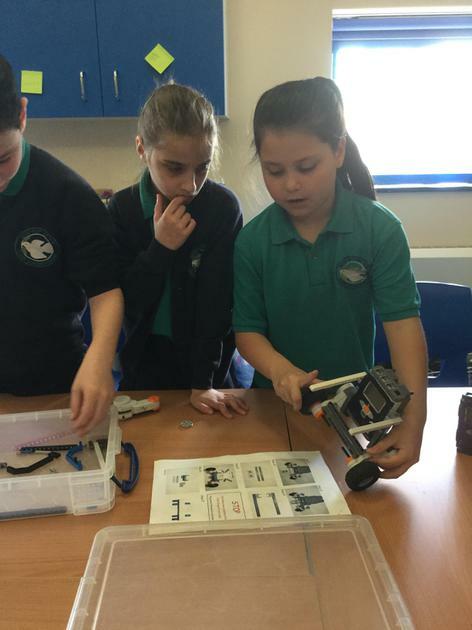 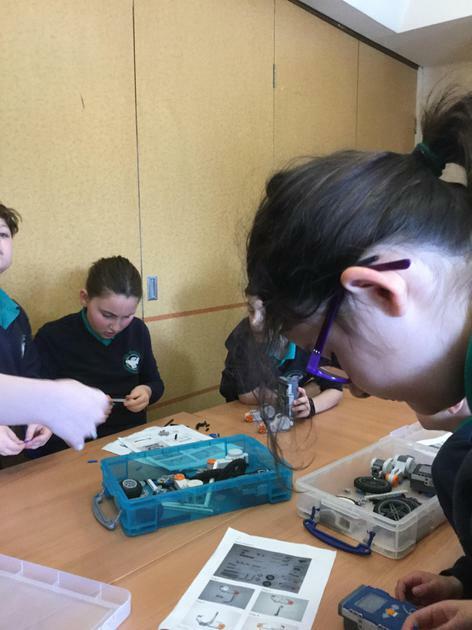 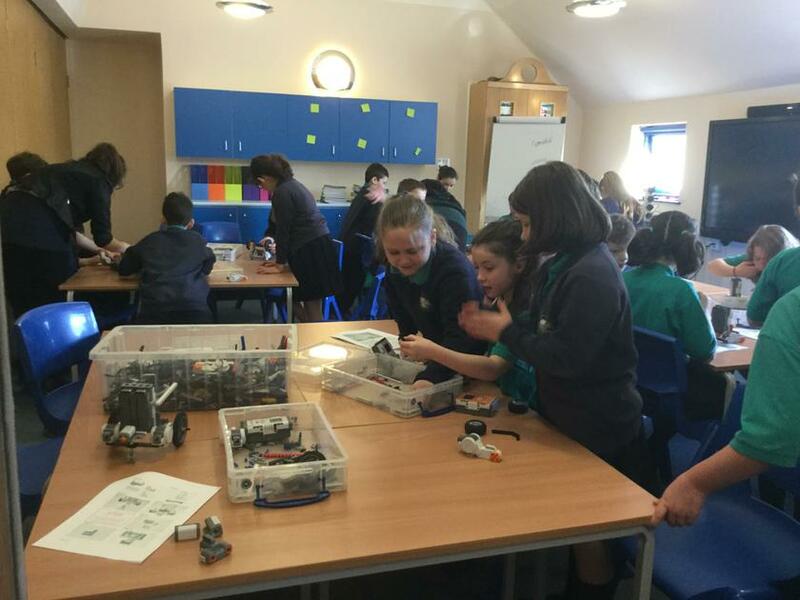 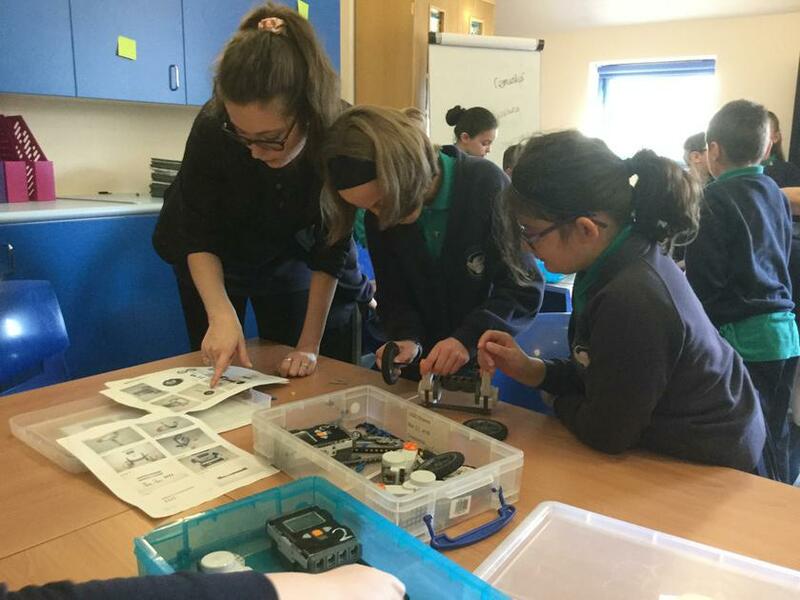 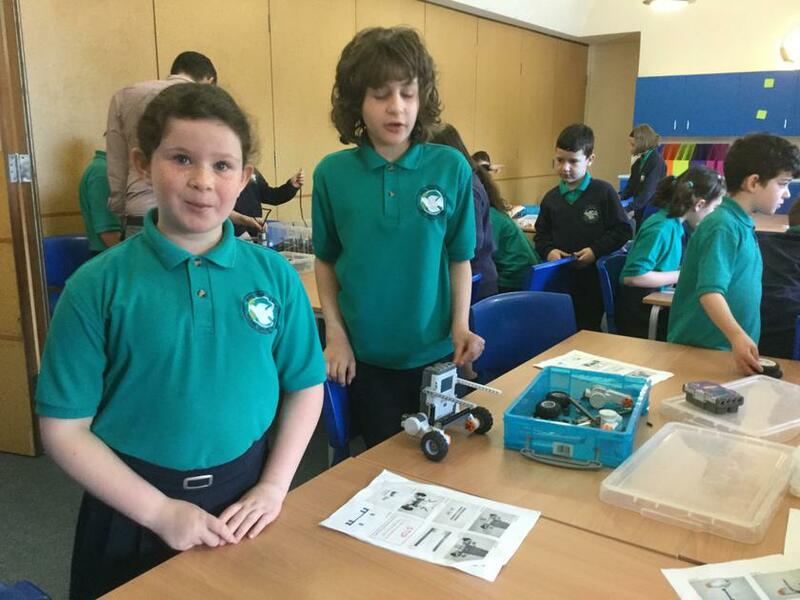 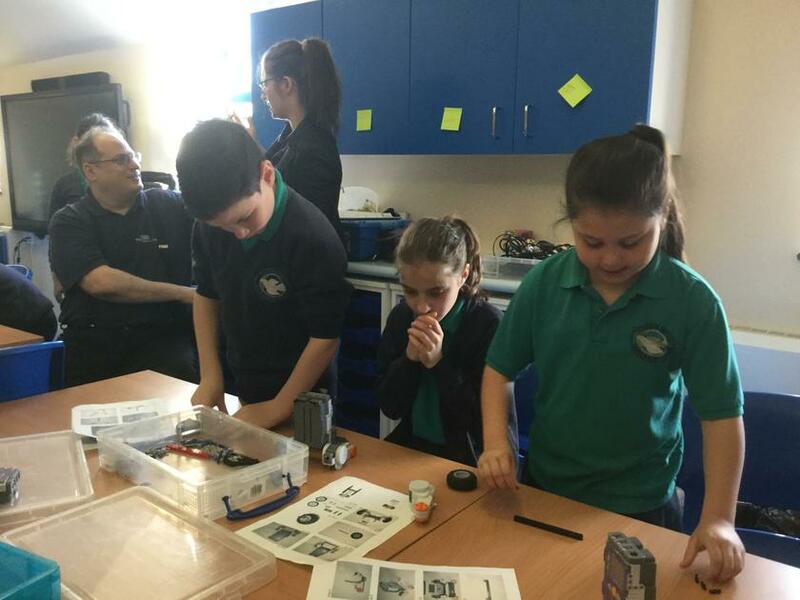 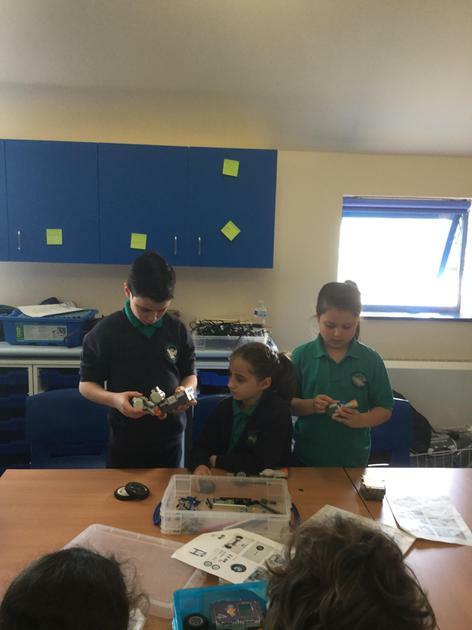 I didn't like the look of the Frenchman who put me in a cart..." -Harley C.
On Friday 4th May, Years 3 & 4 took part in a Robotics Workshop during which the students built small robots and were able to control them via a tablet. 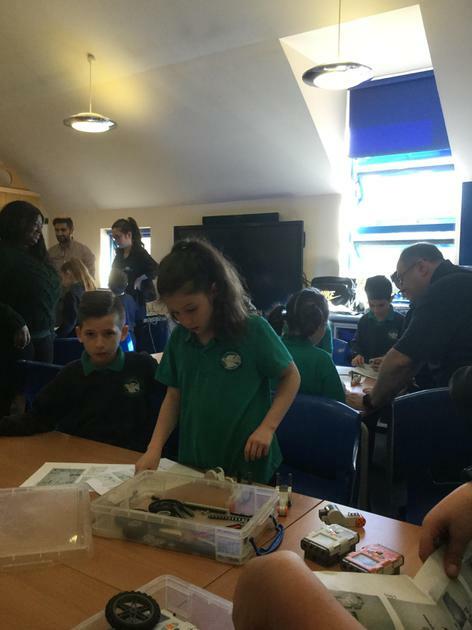 This was an incredible opportunity for Year 4; the class agreed that it was one of their favourite workshops of the year. 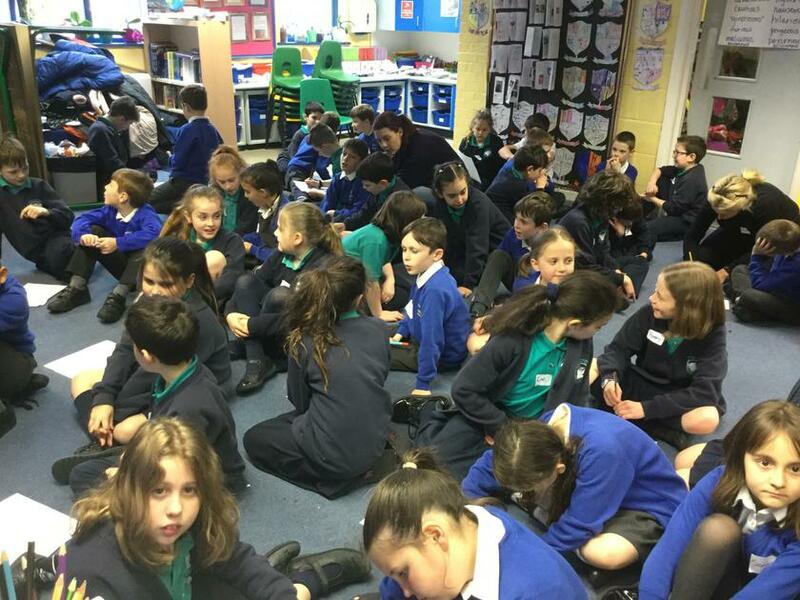 On Monday 30 April, the Year 4 class from Shenley Primary School came to spend the day with our Year 4 class so that we could share our ideas about what it means to be Jewish students with our new friends. 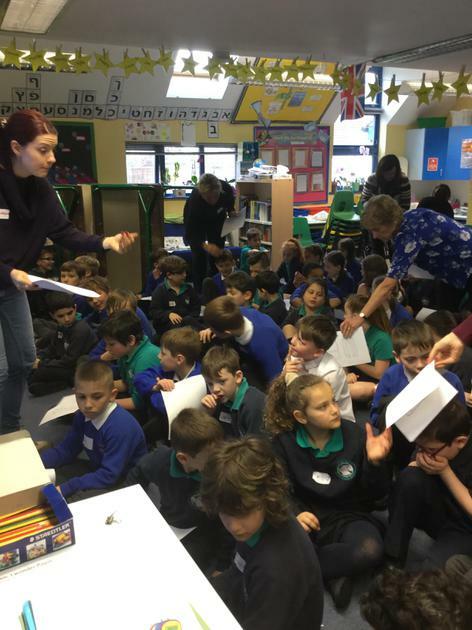 The visiting class arrived at 9:45 am and spent the entire day with us; they were especially keen to take part in our Monday morning Havdalah service and, in the afternoon, Miss Stubbs took out one of the Torah scrolls to show our guests what a Torah looks like (as many had never seen one before). 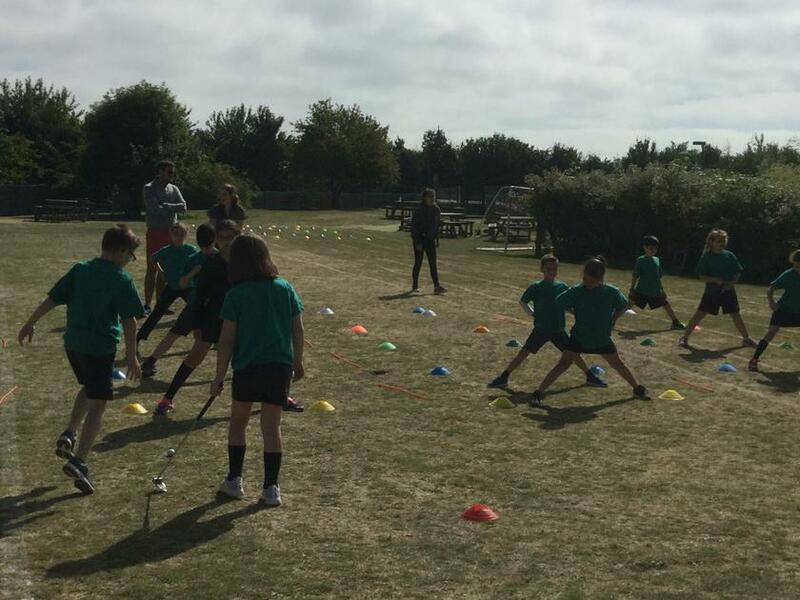 The day began with icebreaker games and there was some time scheduled for free play outside. 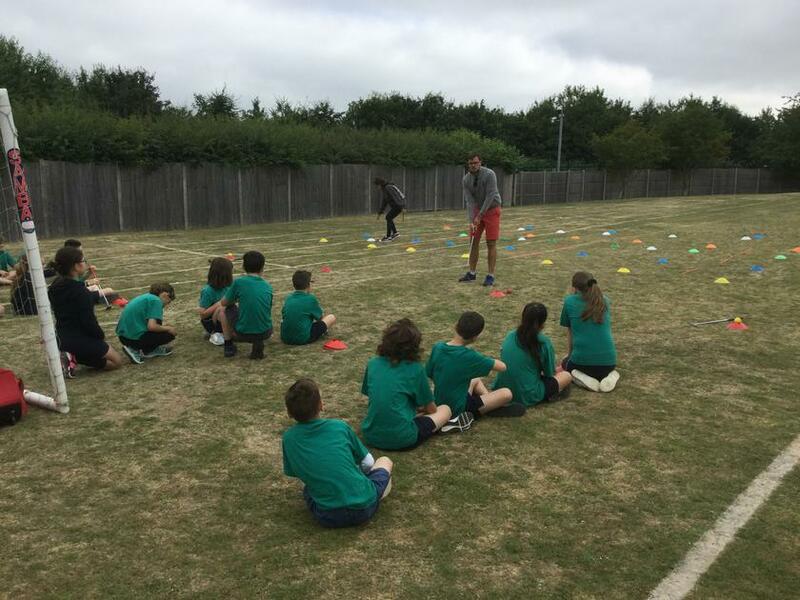 We executed 2 programmes around the subject of personal identity and asked each of the 60 students to distinguish between what people see about us on the outside vs. what aspects of ourselves we carry around "hidden" on the inside. 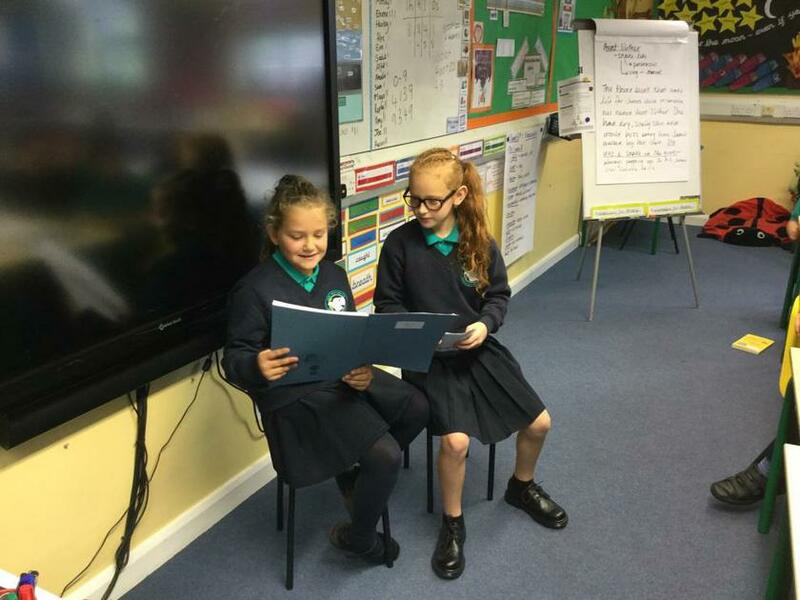 After lunch, the students took part in a shared writing project during which they produced a poem about the differences and similarities they found when getting to know their assigned buddy. 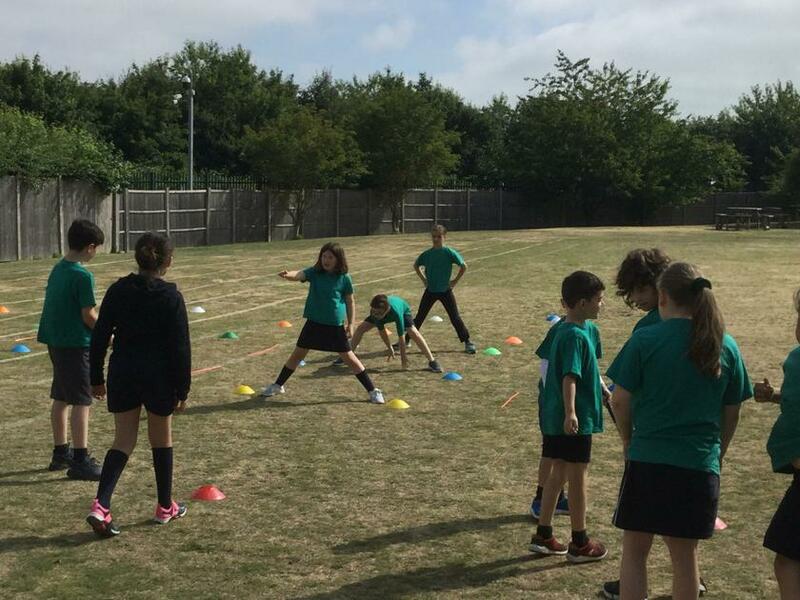 It was a fabulous day for all and we are hoping to take Clore's Year 4 class on a visit to Shenley Primary before the end of the school year. 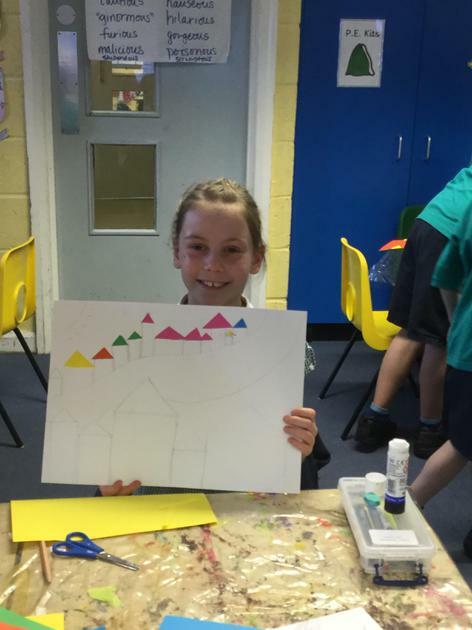 The pupils have been learning about Chagall's use of villages as the subject of many of his paintings. 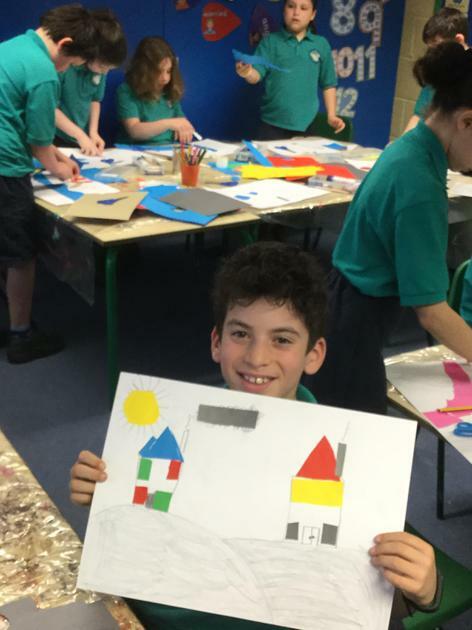 On Friday, each student worked with a variety of media--charcoal pencils, card, tissue paper, glue, paint and felt tips--to create an original piece with a village as the subject. 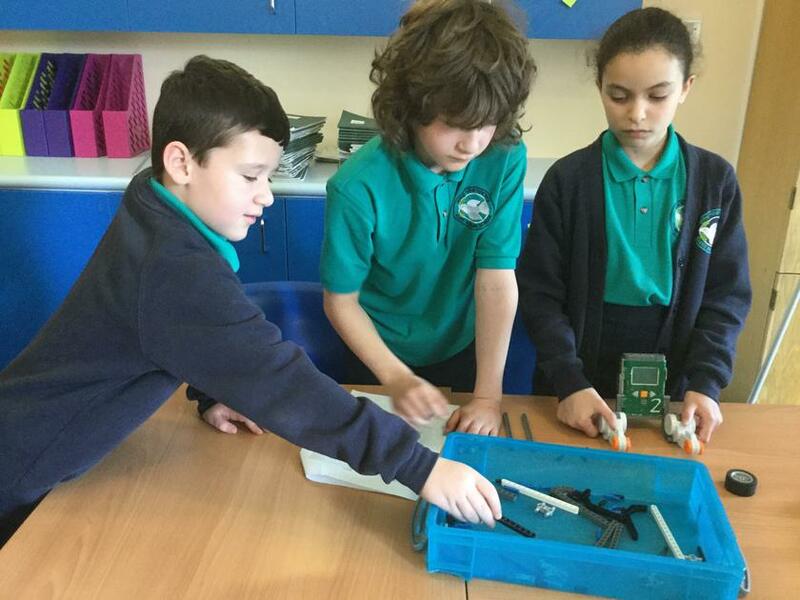 Year 4 has begun a new science topic about the states of matter and will be exploring how matter can change its state when exposed to different variables, such as a change in temperature. 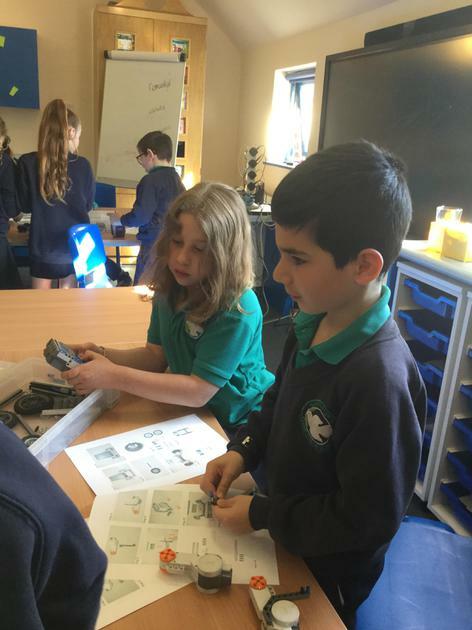 We started off discussing the differences between solid, liquid and gas using water as our primary example; we then brainstormed to see how many different gases we could name. 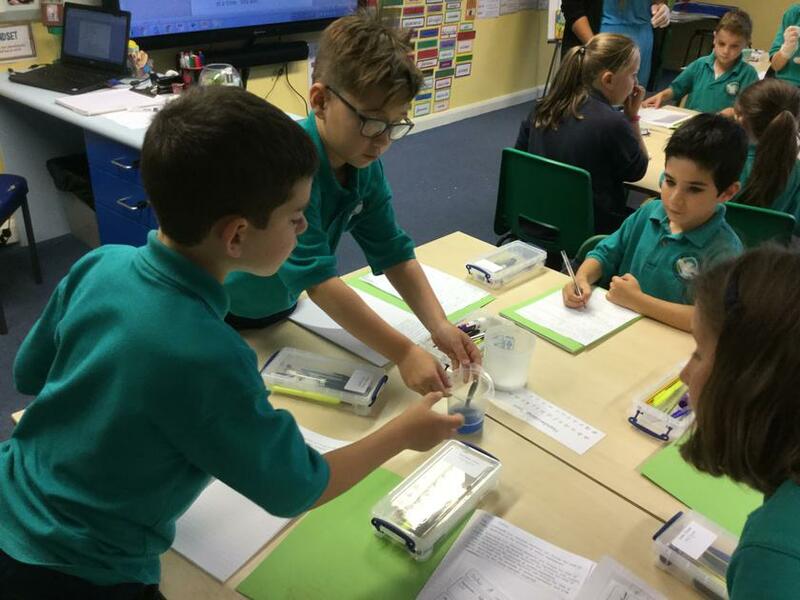 Our first investigation aimed to determine the amount of carbon dioxide contained in different brands of carbonated drinks. 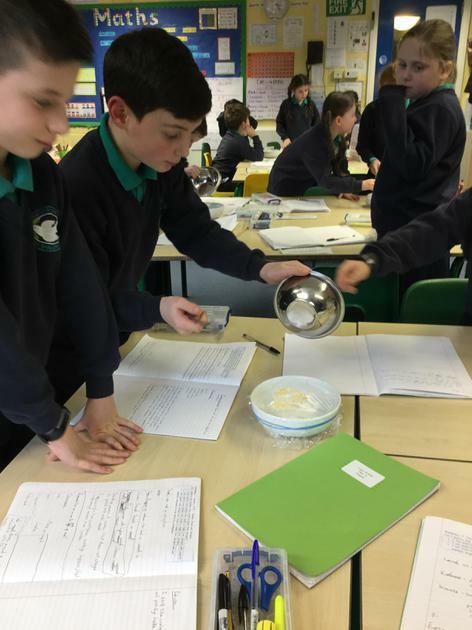 Science Investigation: "How Much Carbon Dioxide is in Soda? 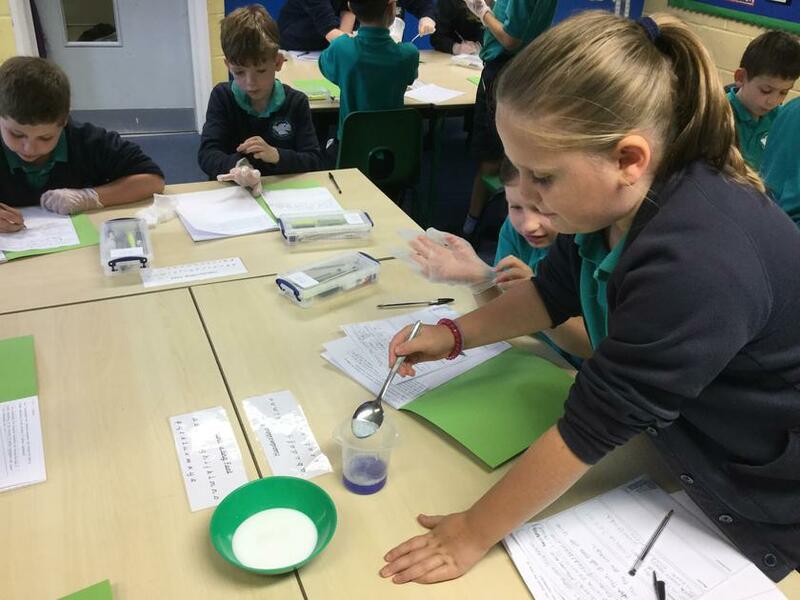 Do Different Drinks Contain Different Amounts?" 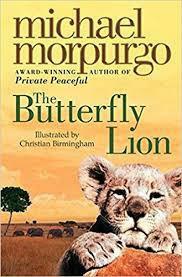 This week, Year 4 has begun a novel study of Michael Morpurgo's The Butterfly Lion. 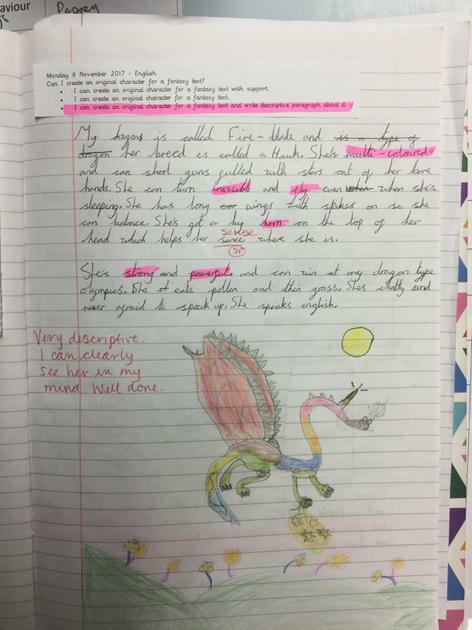 We've read the first chapter and our learning has focused on how the author uses carefully chosen words to evoke feelings in his readers. 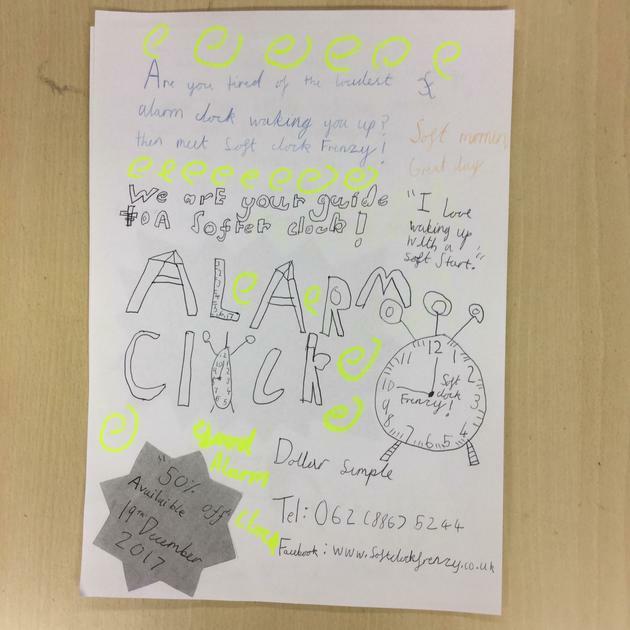 The pupils have made predictions about the plot based on the blurb on the back cover and are eager to find out what happens now that Betie, the main character, has run away from boarding school. 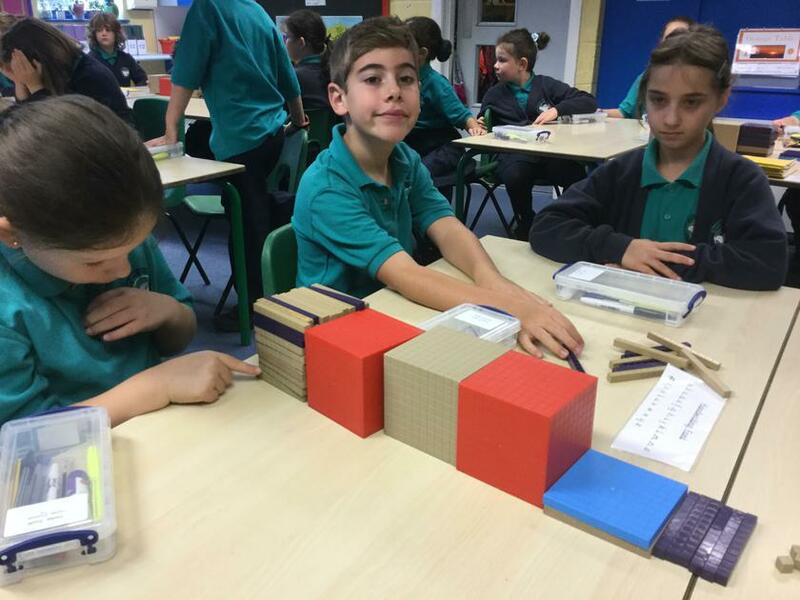 This week, Y4 has been learning about fractions. 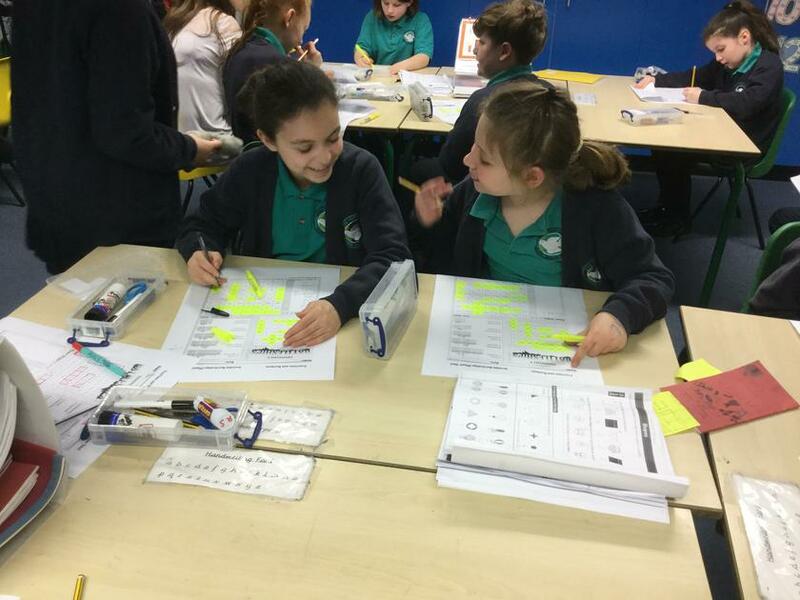 During one lesson, they played “Fraction/Decimal Battleship" in pairs. 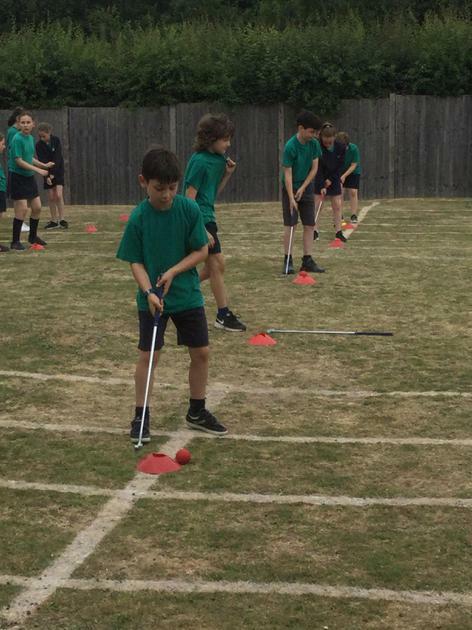 Each child was given a game board and set out their 5 “ships” on a grid marked with either fractions or decimals. 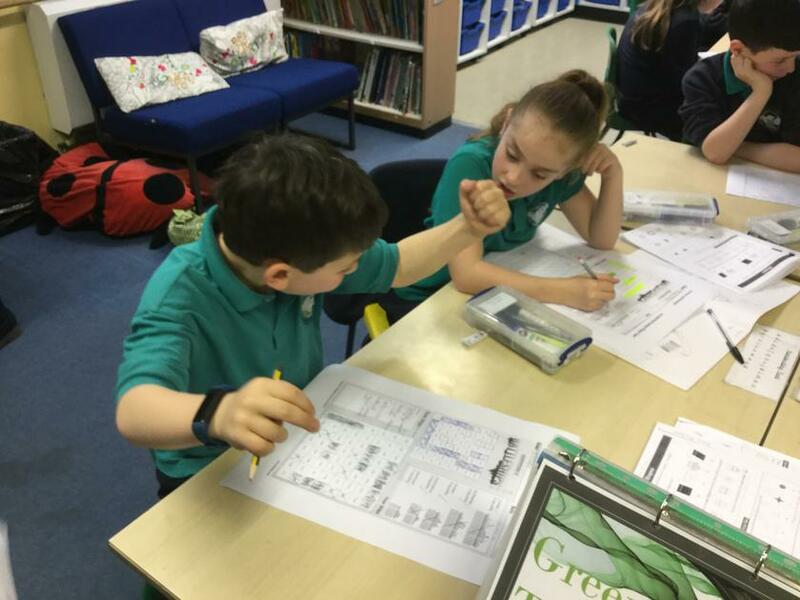 Player One read out a decimal from the grid and Player Two had to find the fraction equivalent on their game board to see if their opponent “hit” one of their “ships”. 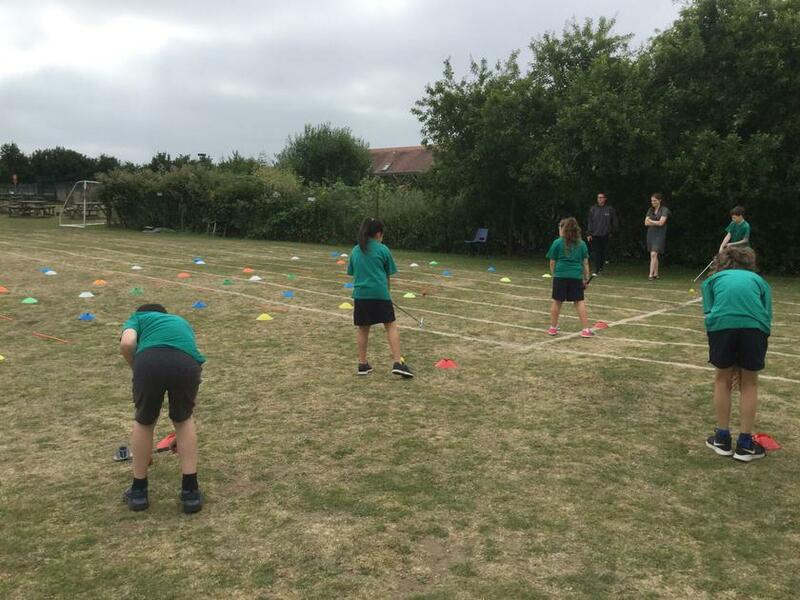 The children thoroughly enjoyed this learning game! 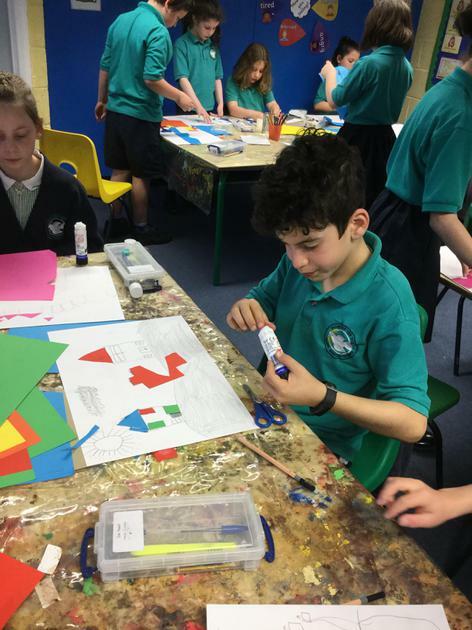 We began learning about artist Marc Chagall this week; the children very much enjoyed making Chagall-inspired "stained glass windows" on transparency paper. 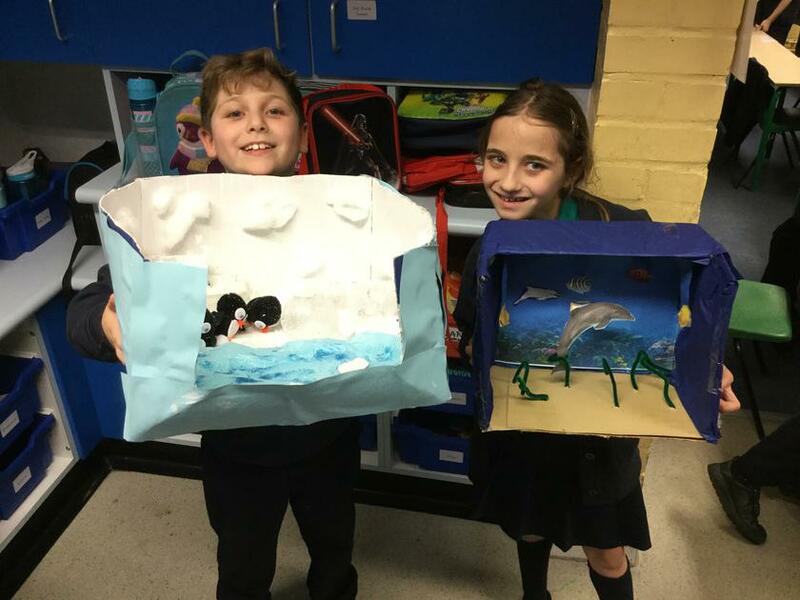 We will be framing them next week and will have them on display in the classroom and corridor. 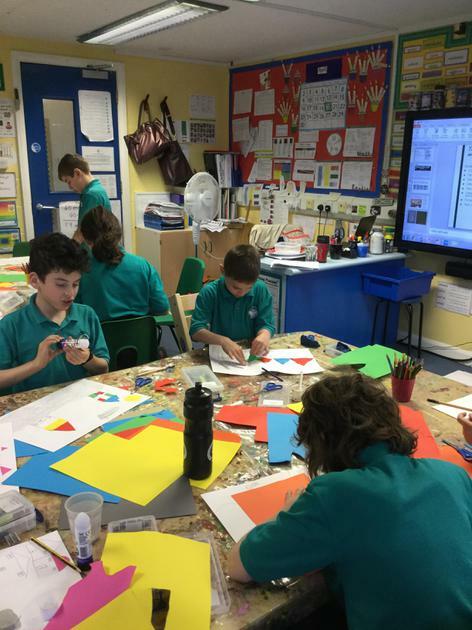 The class learnt about tertiary colours, which are colours next to one another on the colour wheel. 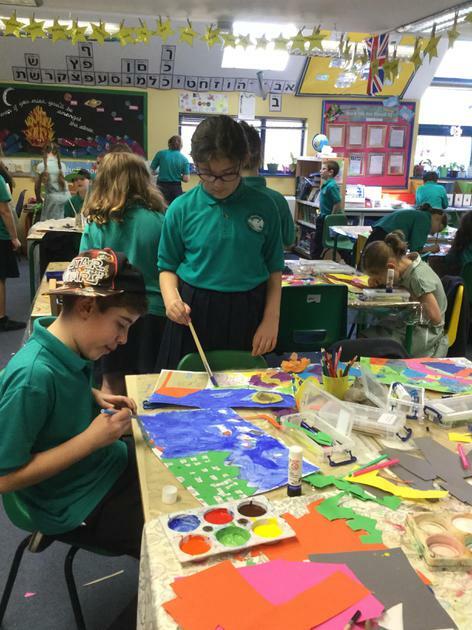 When painting dreamlike scenes, Chagall often used tertiary colour to fade from one shade to the next; the students emulated this technique in their artwork. 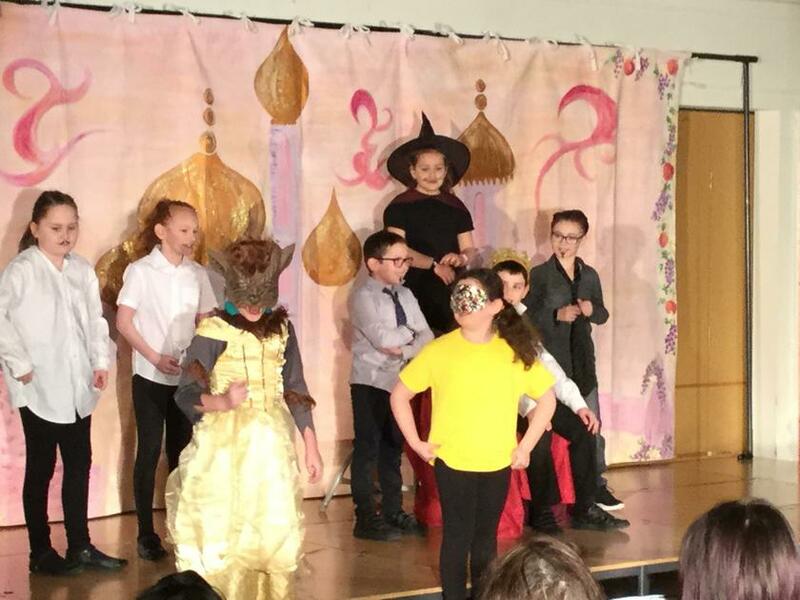 The pupils have been busy as bees: rehearsing lines, practising songs, making props, blocking stage directions, creating costumes and--most importantly--working as a team. 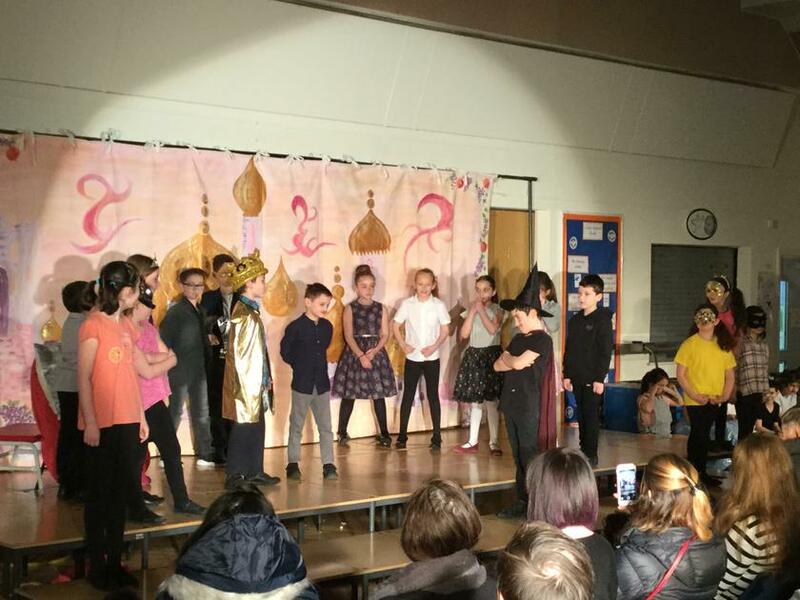 We are looking forward to next Wednesday and Thursday's performances. 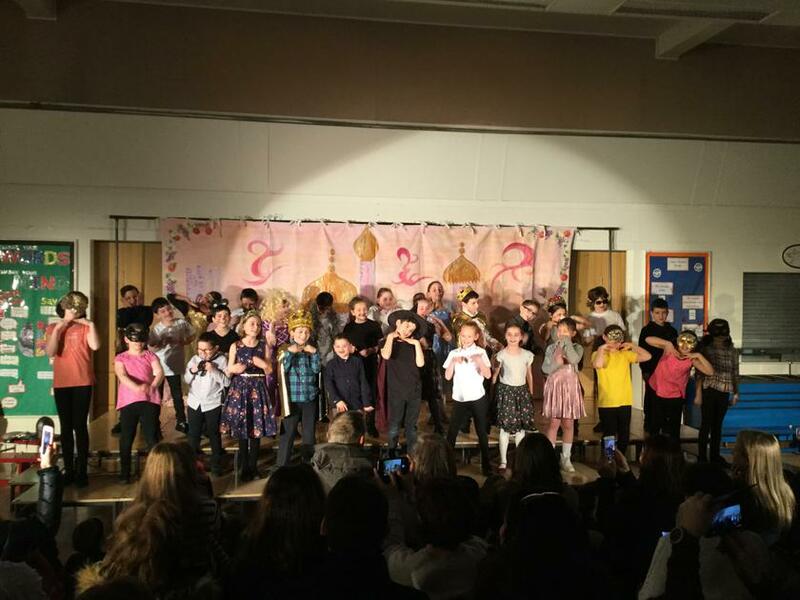 Over the weekend, we'd like the students to practise the musical numbers in addition to their speaking lines; they can access the music using the links below. 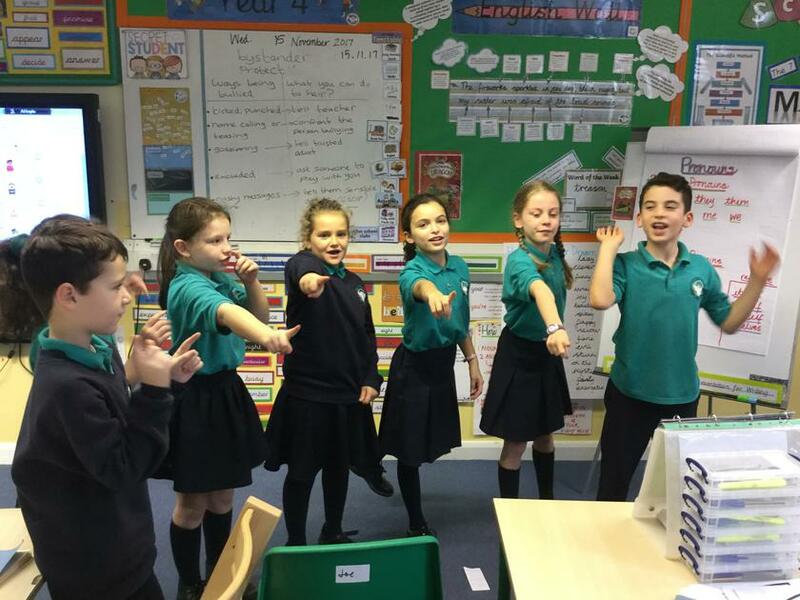 With the new half term comes our new topic: British Monarchs! 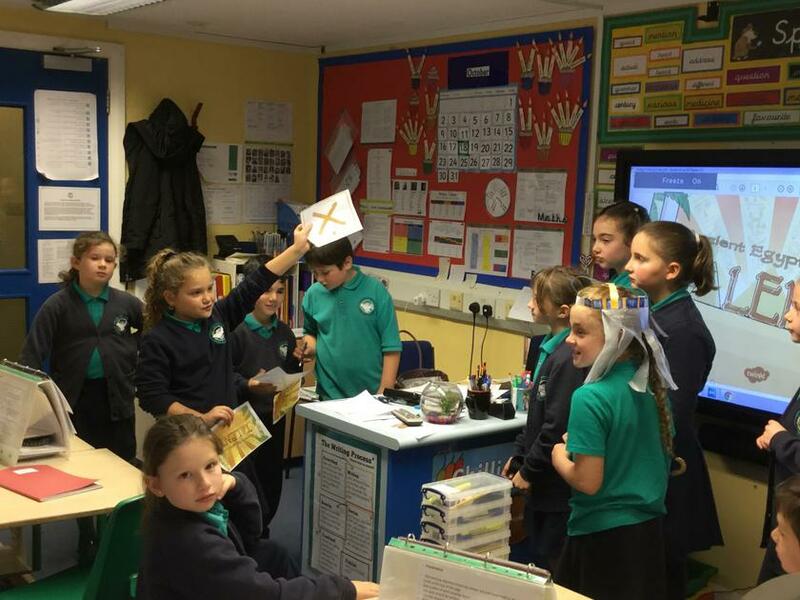 Year 4 will be learning about the monarchs from 1066 onwards--this corresponds with our selection for the school-wide History Challenge, in which I hope many of our class members will take part. 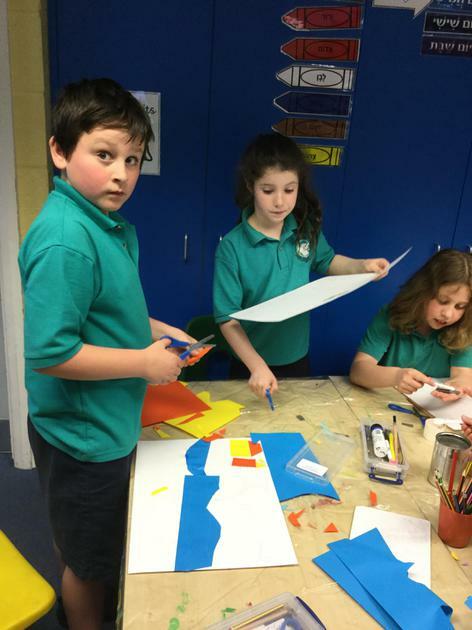 We will be learning about the current royal family in our literacy lessons and the pupils will each be designing a leaflet about them. 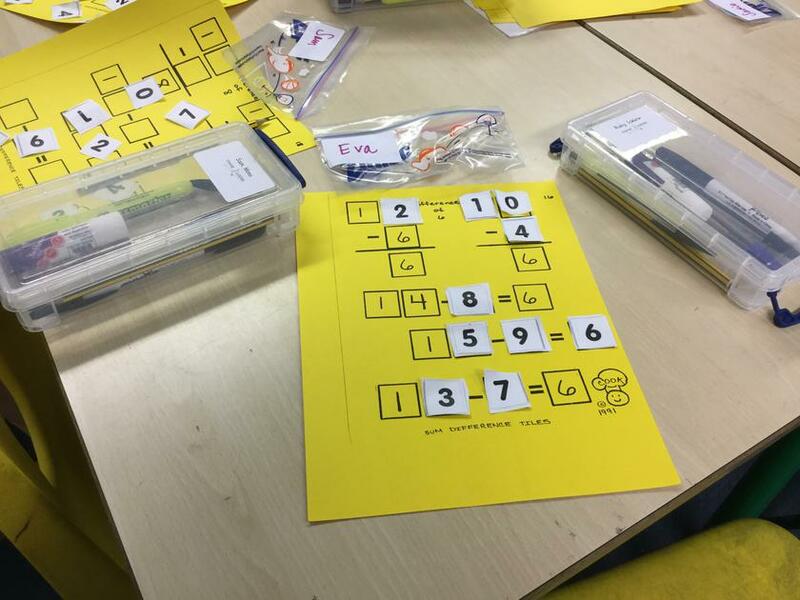 This week in Maths, Year 4 has been focused on Time--telling time, elapsed time and solving word problems about time. 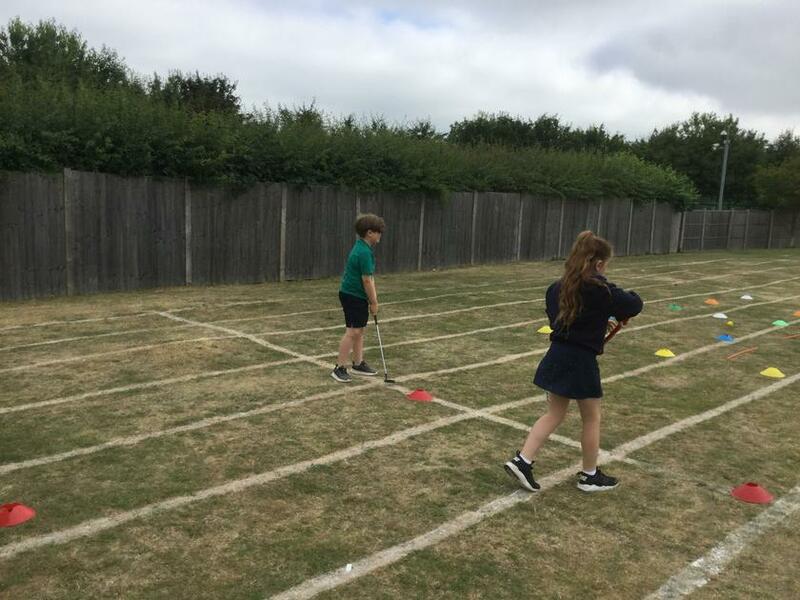 We've made schedules for a hypothetical 'Holiday Camp' and worked out how a key-holder being 45 minutes late to work would throw off the film times in a hypothetical cinema. 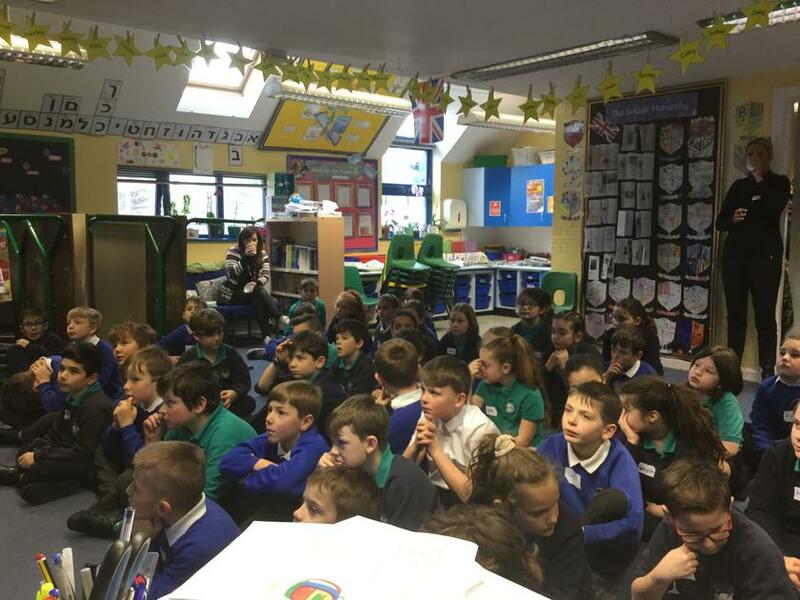 The pupils particularly iz another Kahoot! 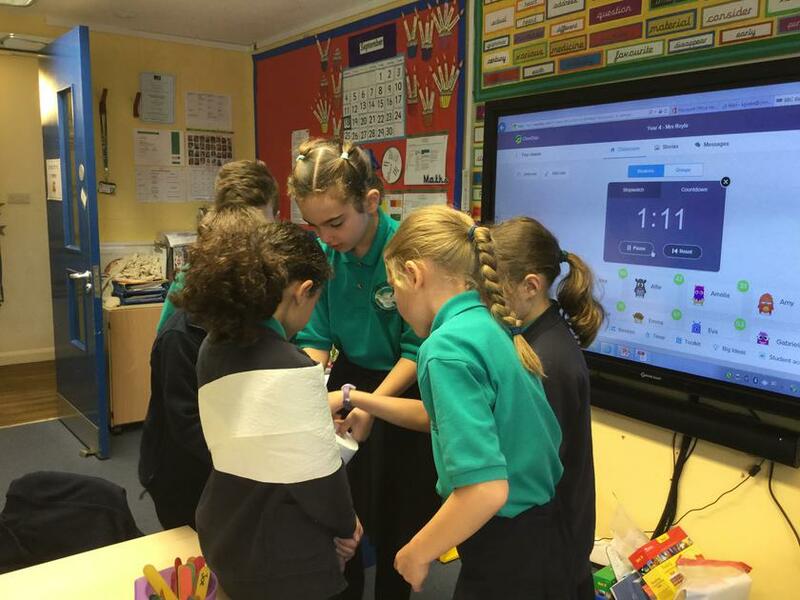 interactive quiz about converting units of time. 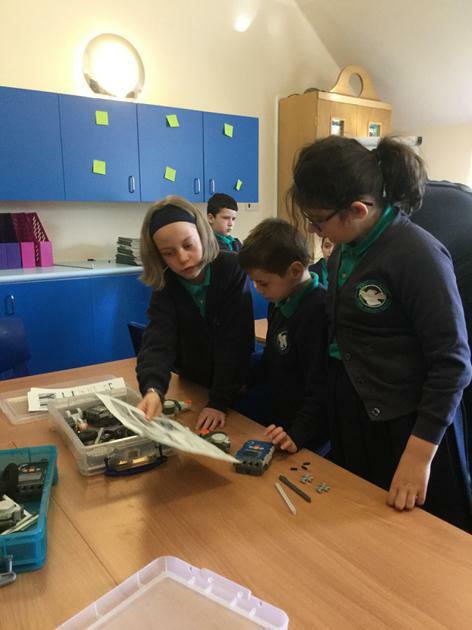 All in all, we've had a busy week! 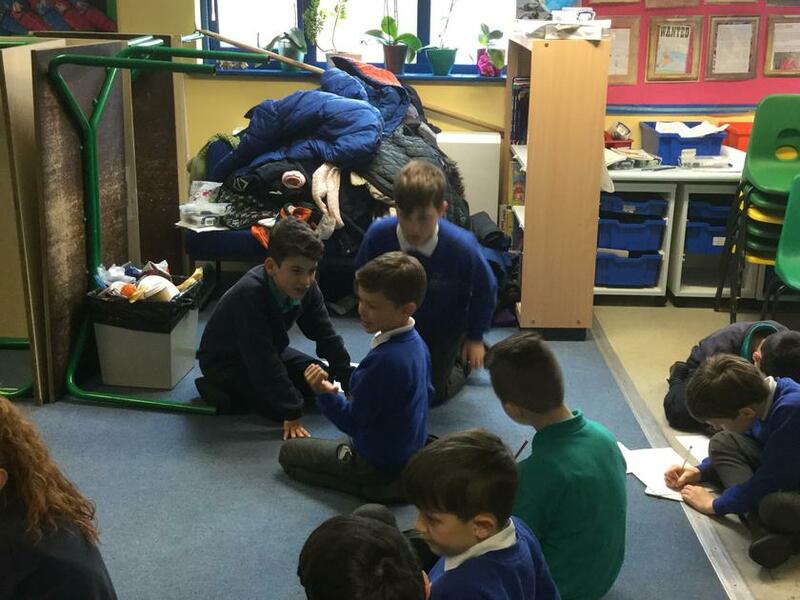 Year 4 has spent the past week learning the features of a balanced argument. 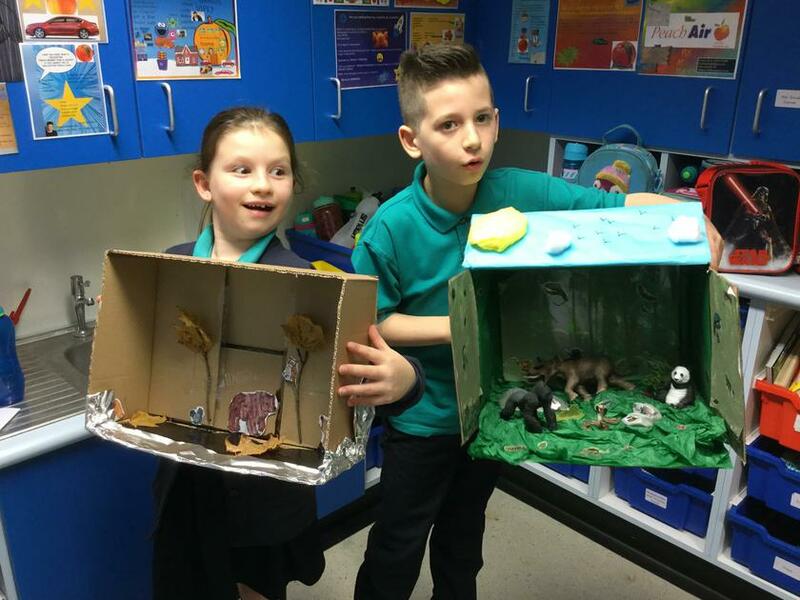 We read two detailed texts--one that asked whether or not dogs need to be on leads in public parks and the other explored the idea of whether or not zoos are in the best interest of wild animals. 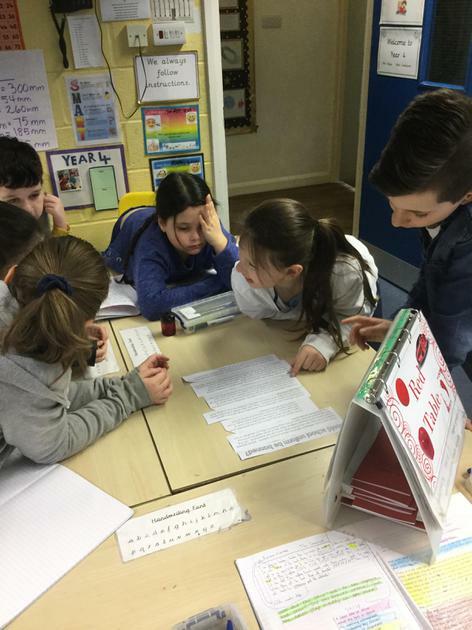 The pupils worked diligently to explore both sides of each argument and we practised linking our ideas with conjunctions and connective phrases. 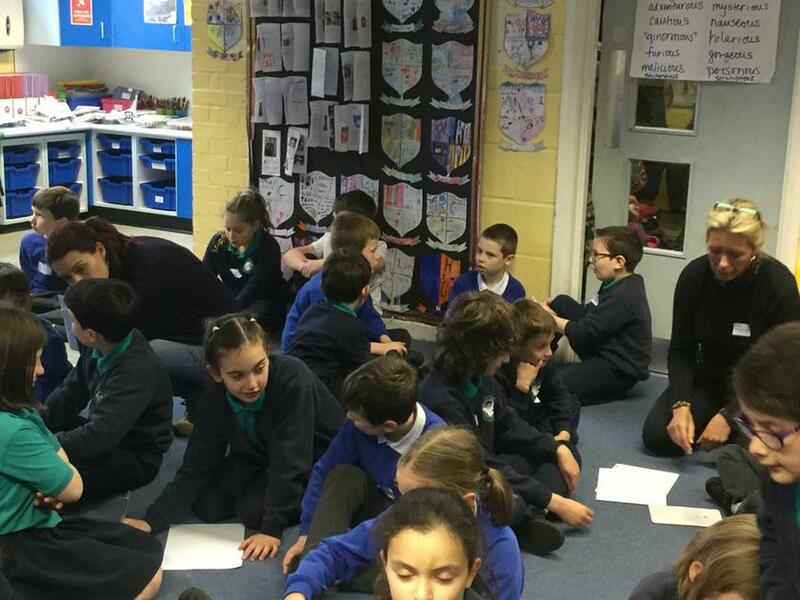 We’ve had a fantastic first afternoon preparing for our Shabbat evening meal and Oneg together. 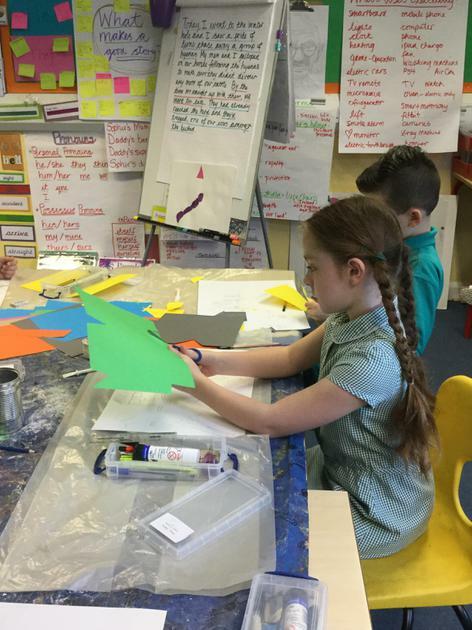 The children spent the day baking challot, decorating the dining table and making cards for their secret buddies. 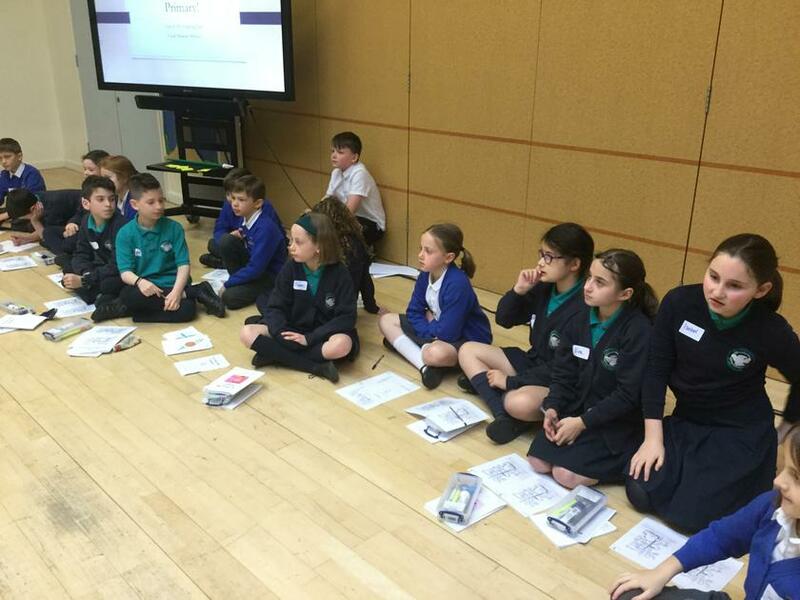 The “ruach” is high—there has been learning, role play, singing and discussing kindness and positive communication. 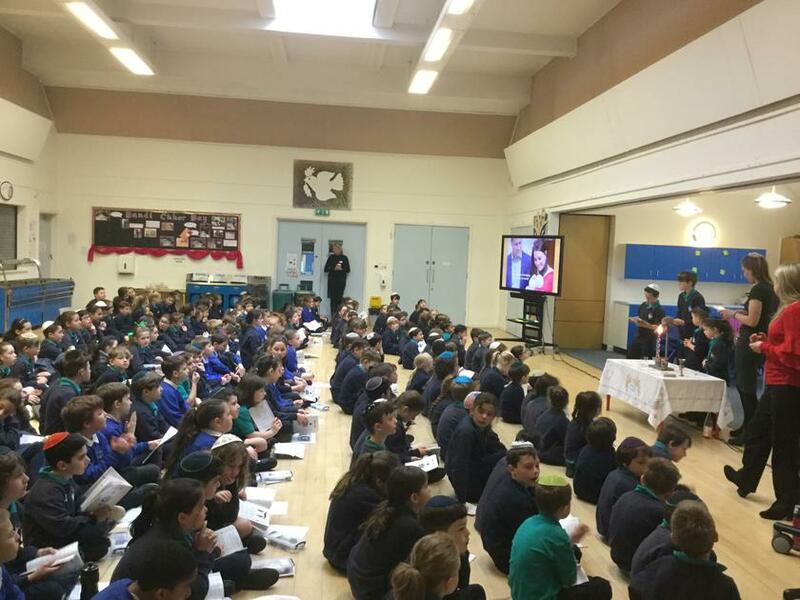 The children are about to begin the Erev Shabbat service and are looking forward to the evening activities. 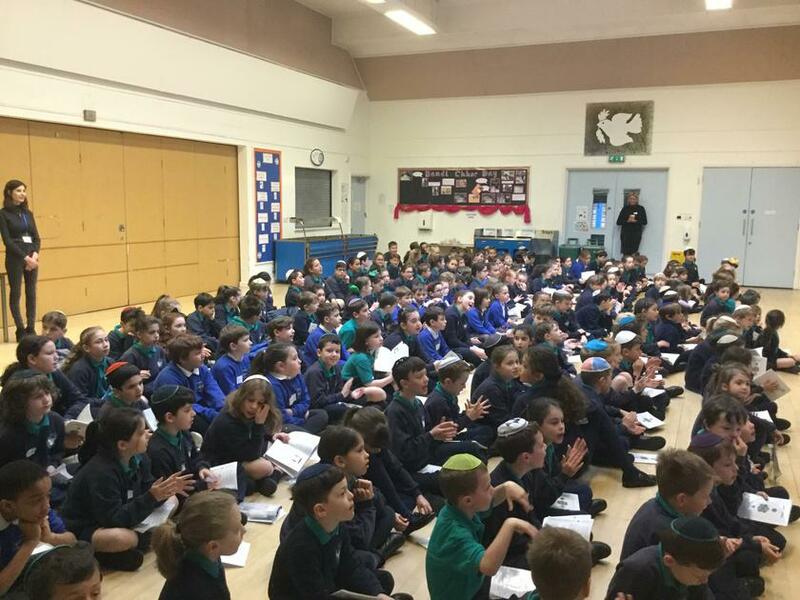 We look forward to seeing you all tomorrow for our community Havdalah! 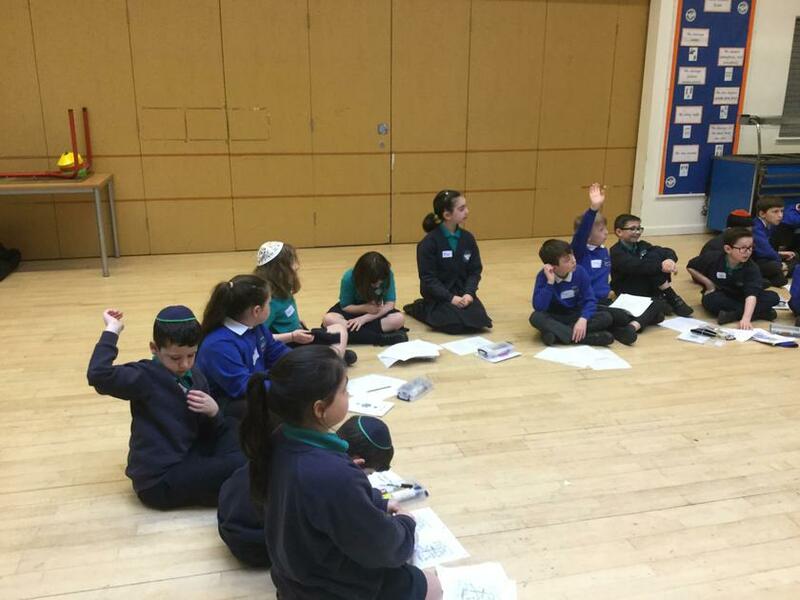 Shabbat Shalom from Year 4 and the Shabbaton team. 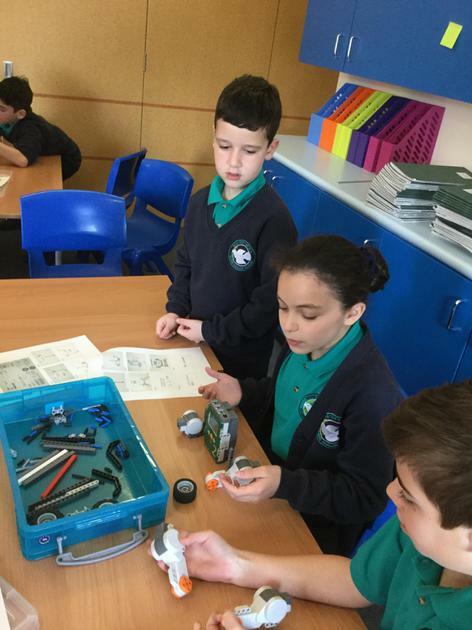 In Science this week, Year 4 has been learning about how sound is made by vibrations. 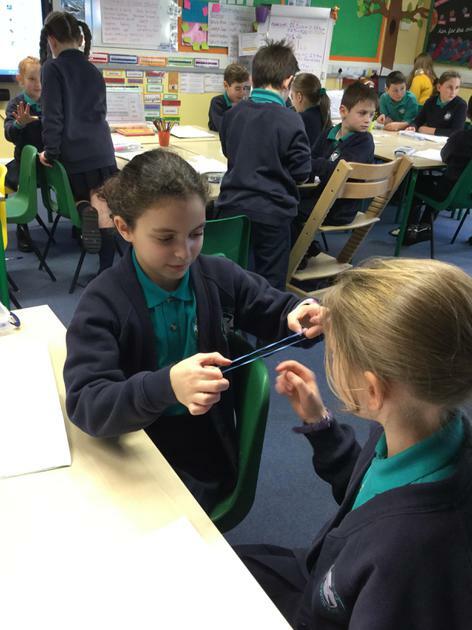 We investigated our own vocal chords vibrating and used elastic bands to help visualise the connection between sound and vibration. 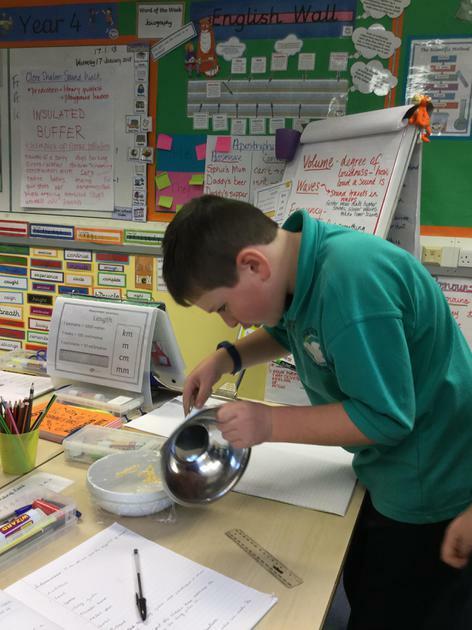 We then set up an experiment to help us "see" sound: the student stretched cling film over bowl and put bits of rice cereal on top. 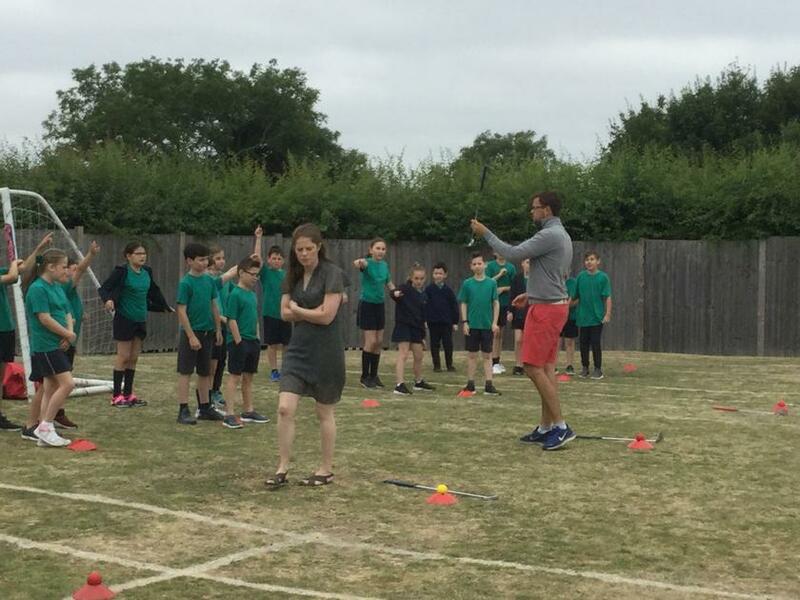 They then took a metal spoon and a metal pan and made a loud BANG near the bowl; the class was pleased to watch the individual pieces of cereal "jump" as a result of the traveling sound waves. 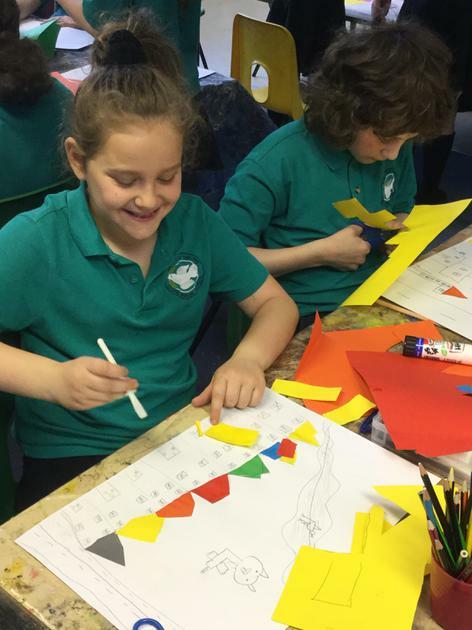 This week,Year 4 has been working on "retelling" Judith Kerr's The Tiger Who Came to Tea"--essentially putting the story into our own words. 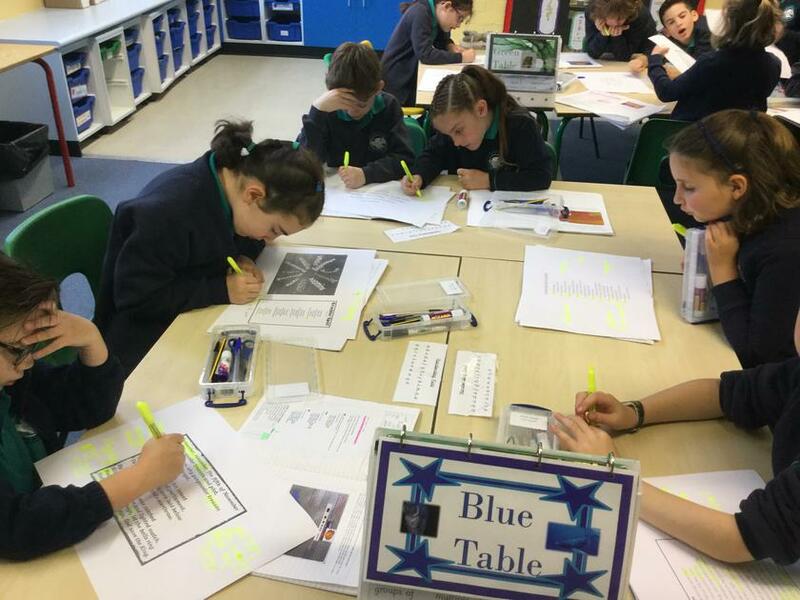 We began the week using a thesaurus to select synonyms for some of Kerr's words that will "up-level" the text. 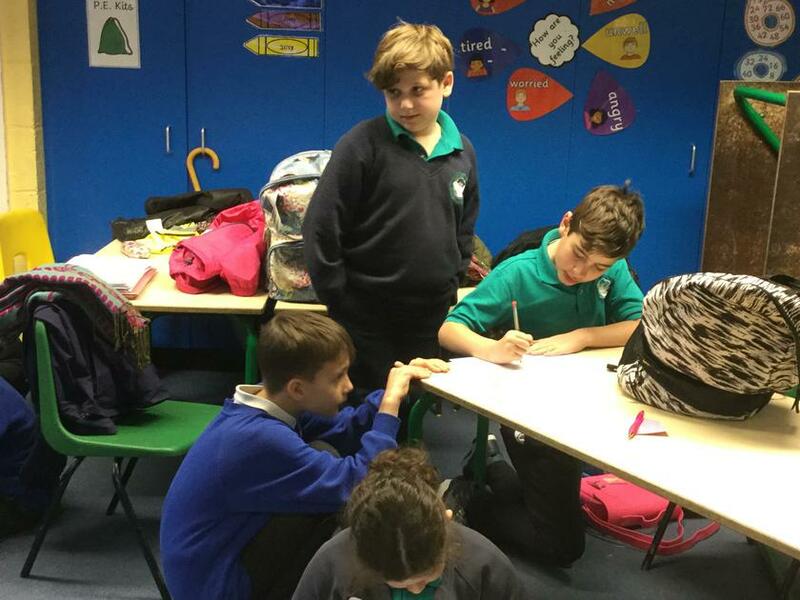 On Tuesday, the students worked in pairs to decide on the 6 main events in the story; on Wednesday, each student drew a story board to illustrate their main events. 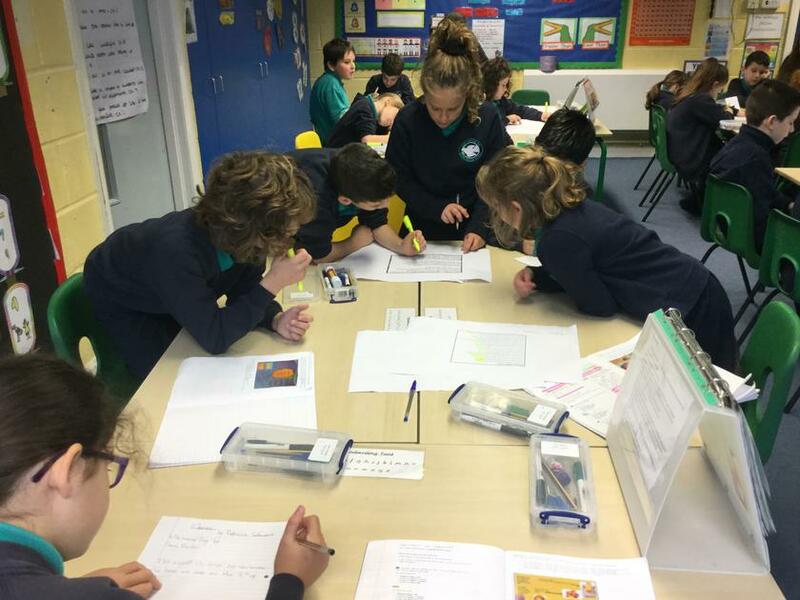 We spent the last two days of the week writing a higher-level version of the story, exhibiting our knowledge of paragraph structure and correct use of fronted adverbials. 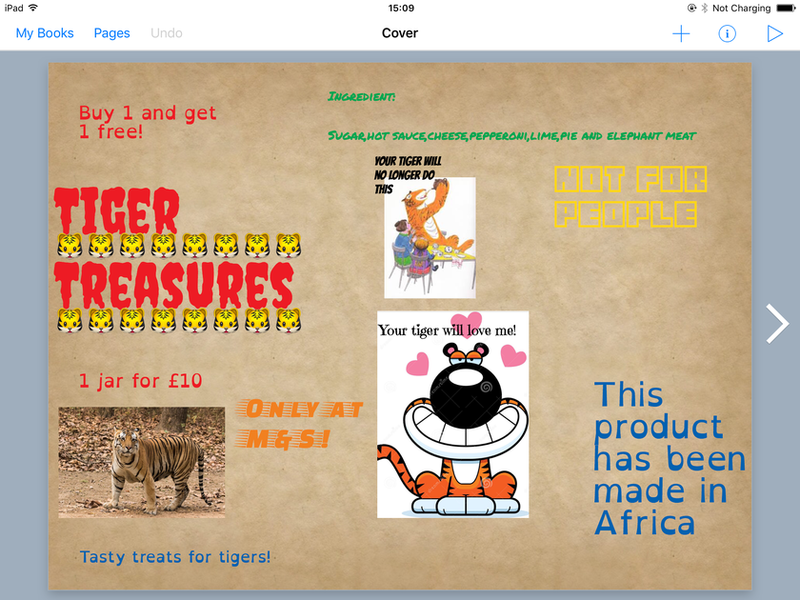 Another fun tiger-related activity Year 4 thoroughly enjoyed this week: we've used Power Point and Book Creator to make labels for tinned tiger food! 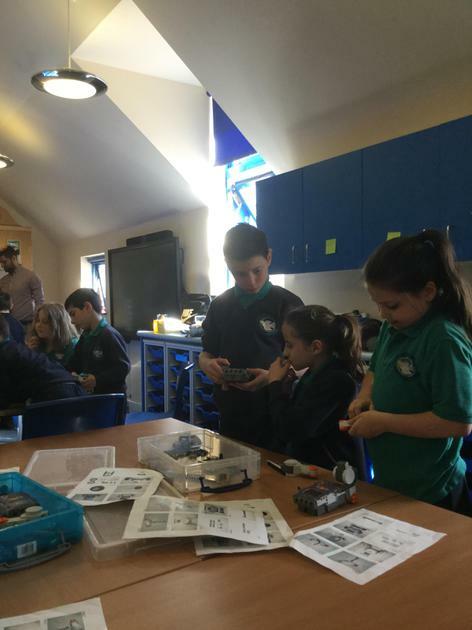 We'd like for each child to bring in a jar or tin so that we can print our labels and attach them to a container so they can be properly displayed in our classroom. 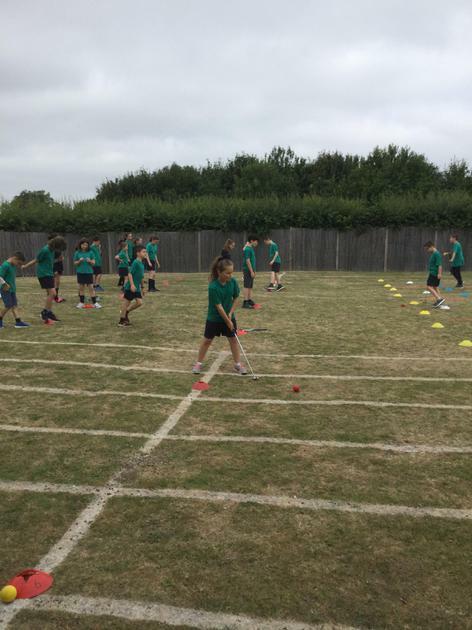 Welcome Back Year 4! 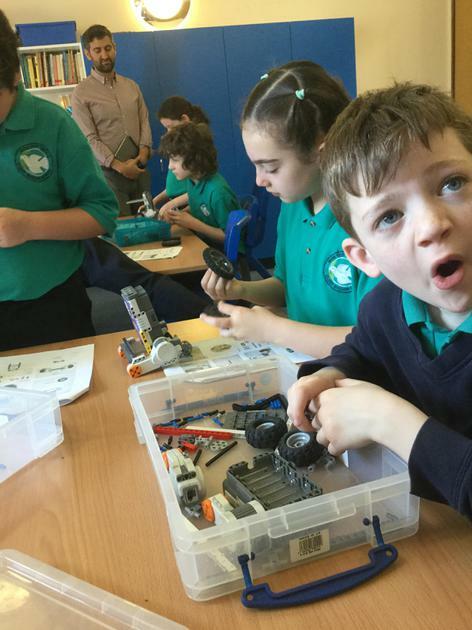 We have a great, action-packed half-term ahead of us and it's going to be an amazing 6 weeks. 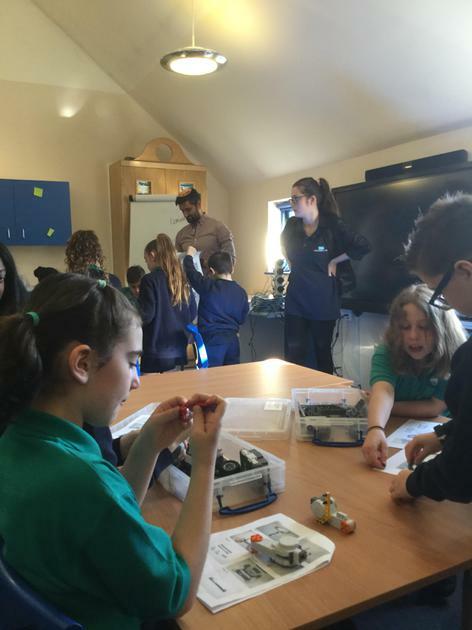 At the end of this month we have our Shabbaton, which both students and staff are very much looking forward to. 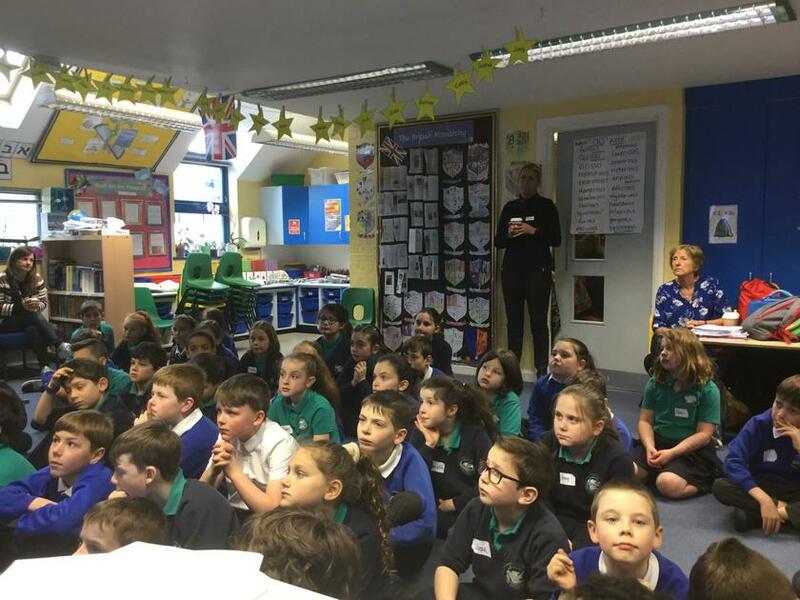 We've started the year off with a school-wide topic: Take One (Jewish) Author--each class is reading a book written by well-known and loved author Judith Kerr. 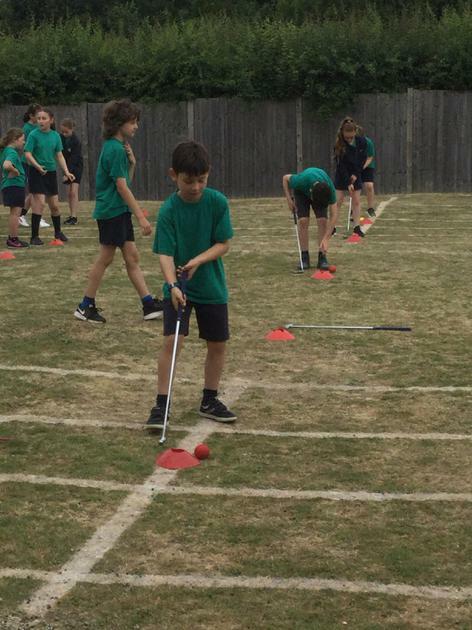 Years 3 and 4 are enjoying an old favourite: The Tiger Who Came to Tea. 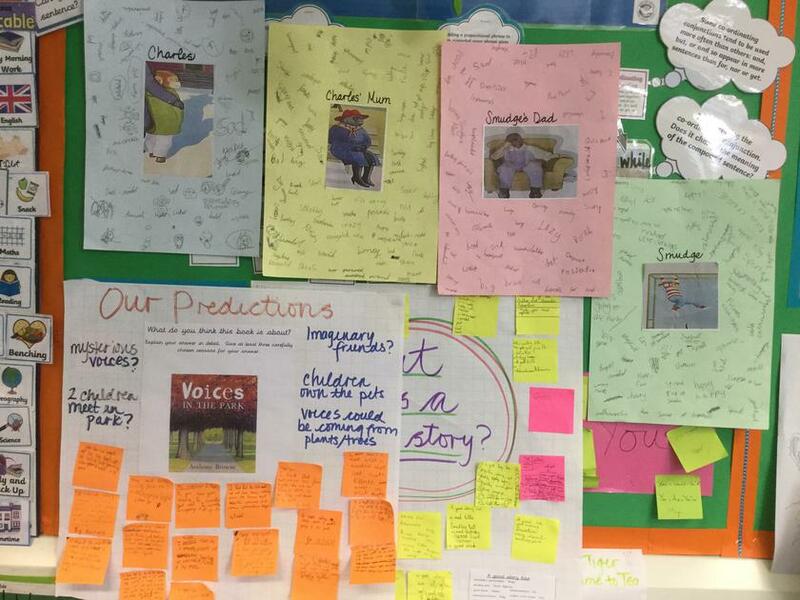 This week, Year 4 researched facts about Judith Kerr and we've spent time learning the features of biographical texts. 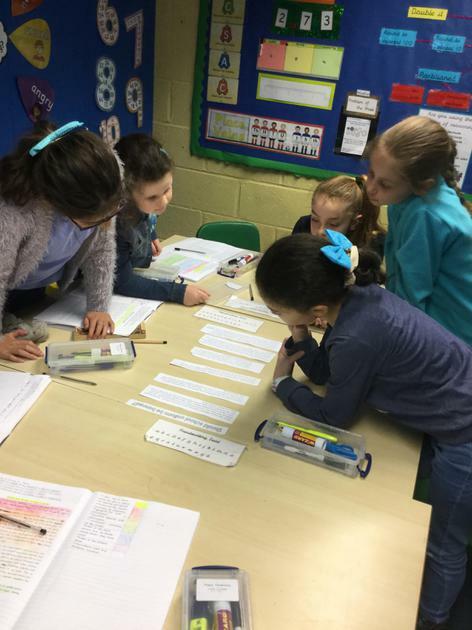 Once the pupils had gathered their data and organised it into categories and chronological order, we wrote short biographies about Kerr and her accomplishments. 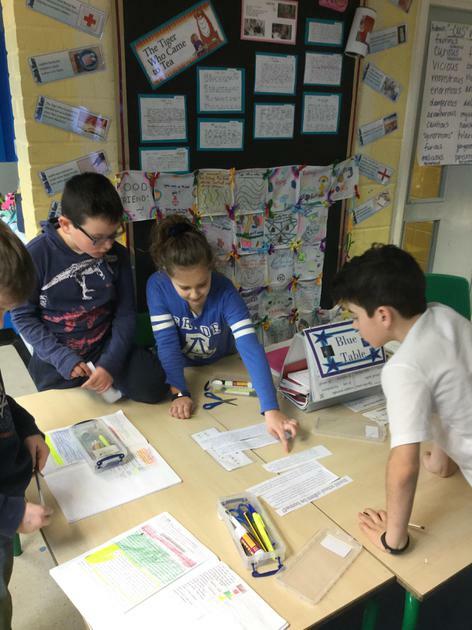 The class worked very hard at this task and each of them has an understanding of both the structure and common features of a biographical text. 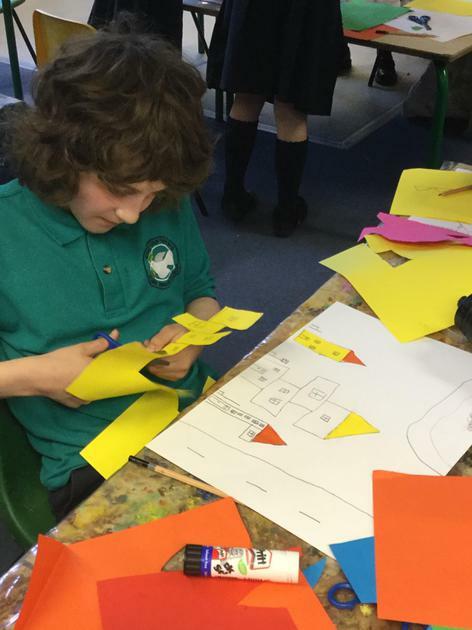 In Maths this week, we have been exploring the concept of solving for perimeter of various shapes. 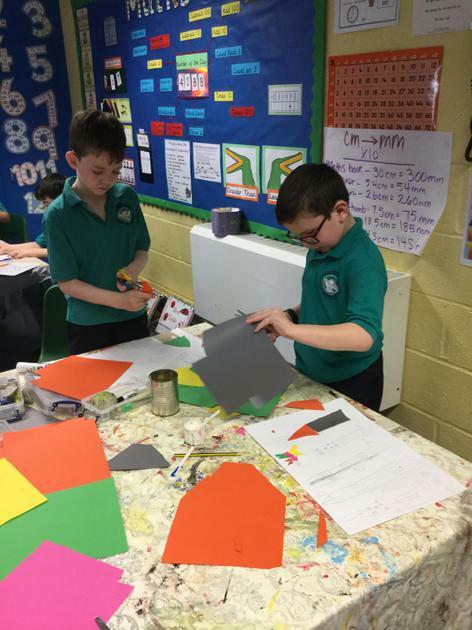 Through hard work and hands-on investigation, the pupils have come to understand how to find the perimeter of a shape when given the measurements of all sides as well as how to figure out length or width when given the perimeter and only some information about a shape. 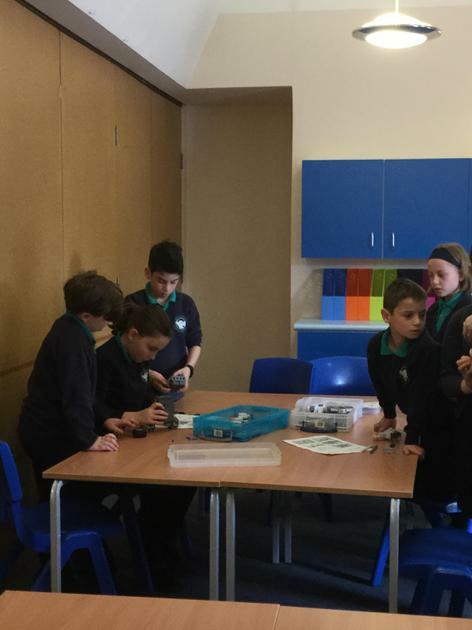 I will say that the class worked diligently, helped one another and enjoyed the satisfaction of solving perimeter puzzles. 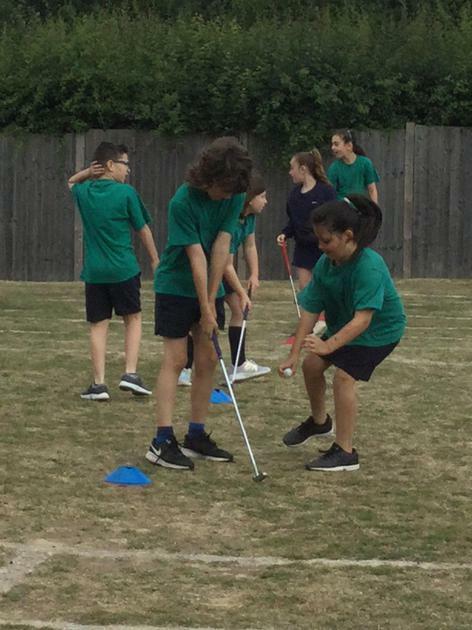 It was lovely to see the group work hard and with pride. 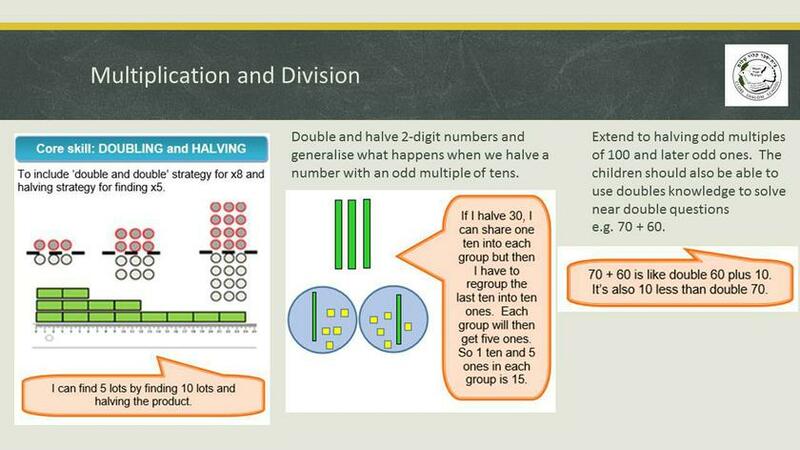 In Maths we have spent the week solving multiplication word problems. 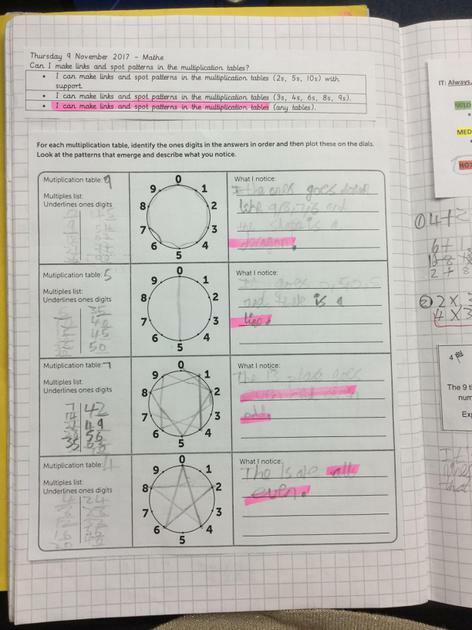 We began with single-step problems and by the week's end the students were all working on two-step problems and even writing problems of their own! 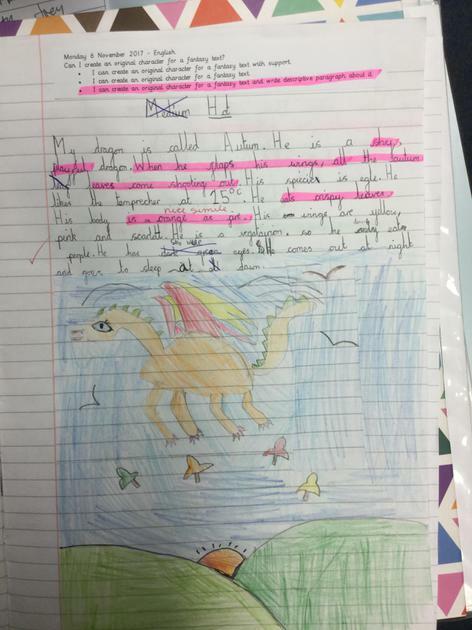 We've come to the final chapters of How To Train Your Dragon and this week, we've drawn story maps of "Hiccup's Fiendishly Clever Plan", devised to save the Hooligan and Meathead tribes from being devoured by the infamous, monstrous dragon called the Green Death. 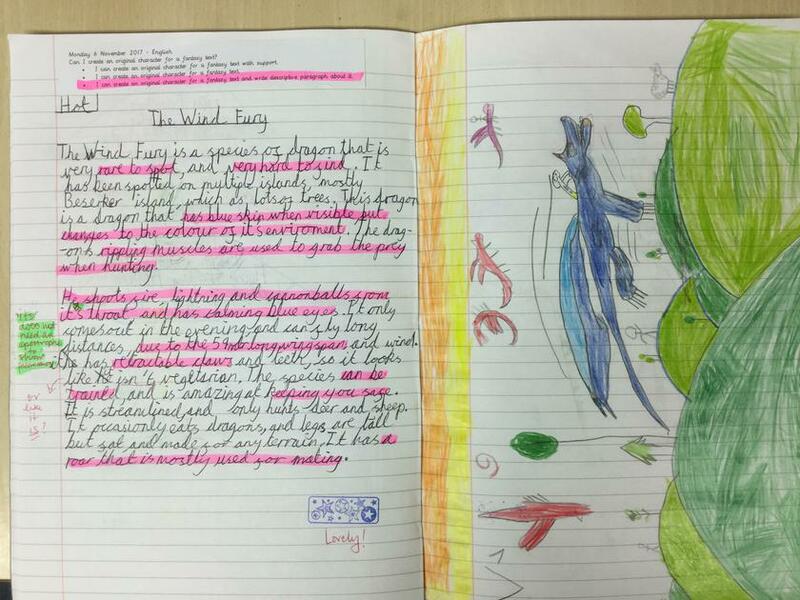 Each student drew a "story map" of Chapter 14--Hiccup's Plan to defend his tribe from certain doom. 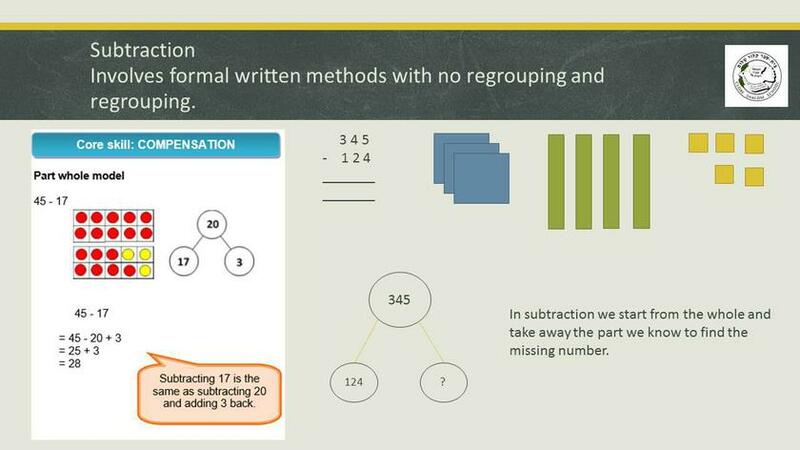 This week, the pupils have been busy working on addition and subtraction word problems. 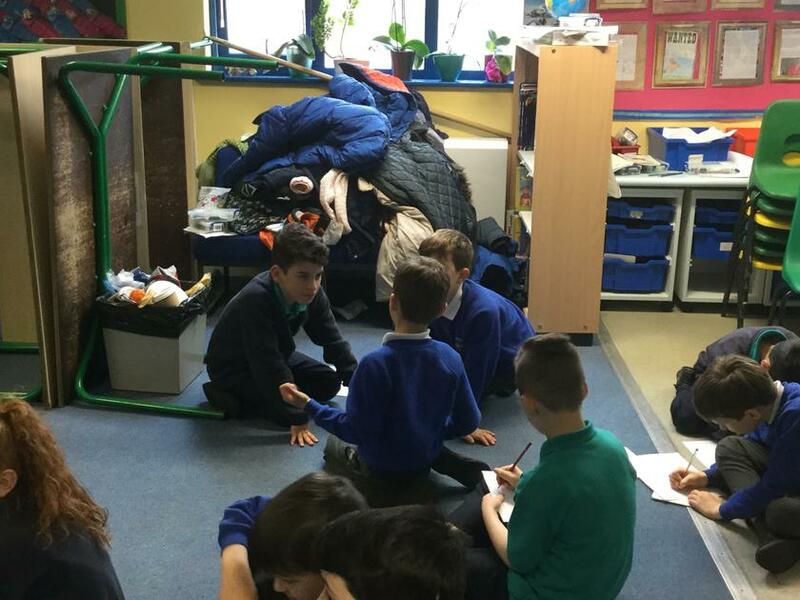 We began the week by exploring the various types of word problems and by the end of the week, the children were writing their own. 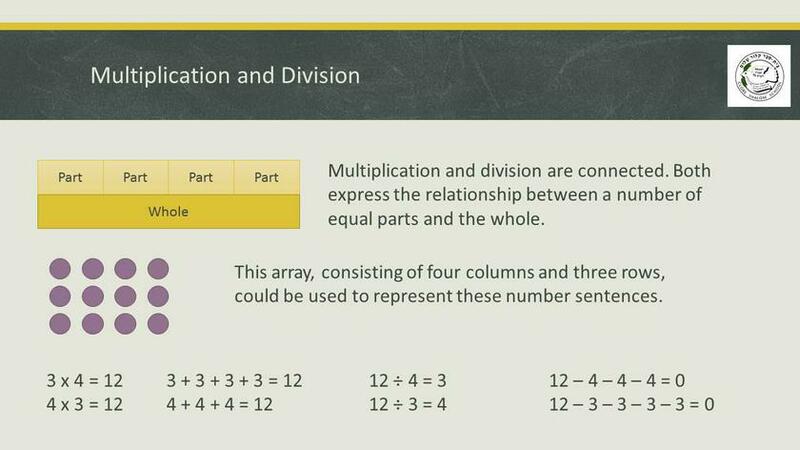 We will continue this into next week, but the focus will be on word problems to be solved using multiplication and division. 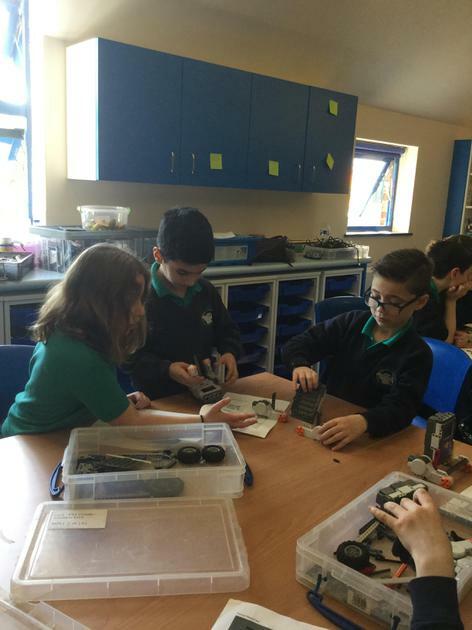 We are coming to the end of the novel How to Train Your Dragon by Cressida Cowell. 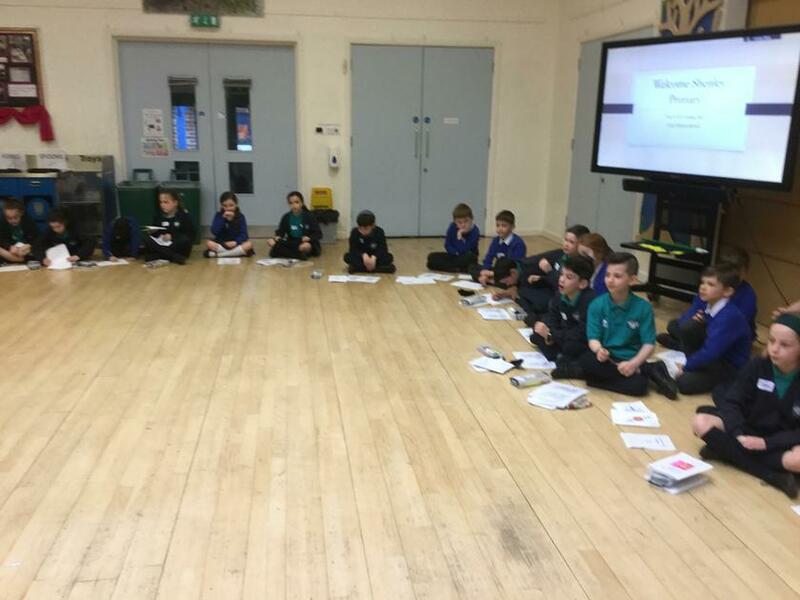 The students practised their dialogue writing skills, learnt about reporting verbs and explored the concept of a character's inner dialogue. 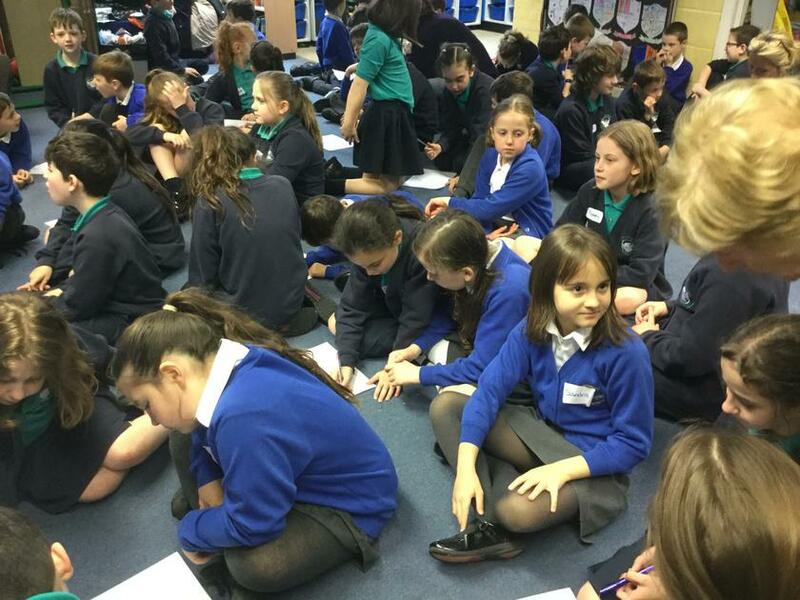 Year 4 has been very busy improving their writing skills and will soon have a chance to put all their learning into a final piece of writing based on Cowell's novel. 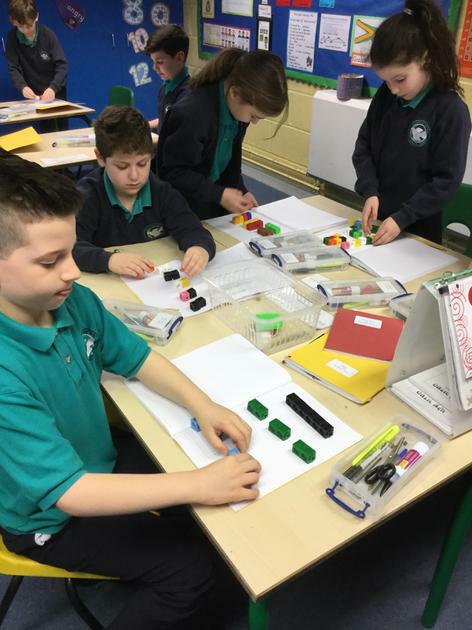 This week in Maths, Year 4 has been working on using their multiplication skills to solve integer scaling and correspondence problems. 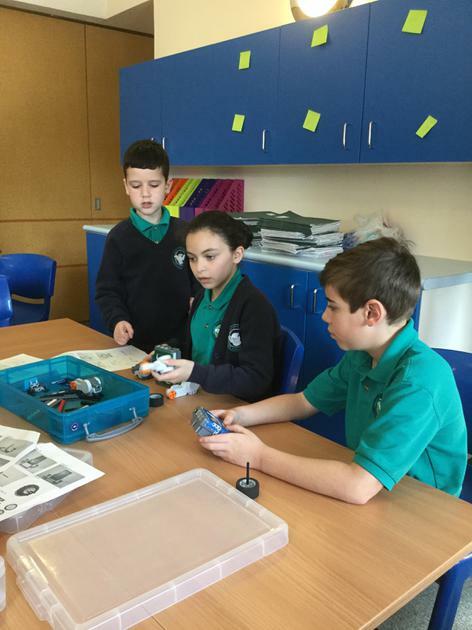 The students used various manipulative resources to support their learning and the class is thoroughly enjoying being challenged! 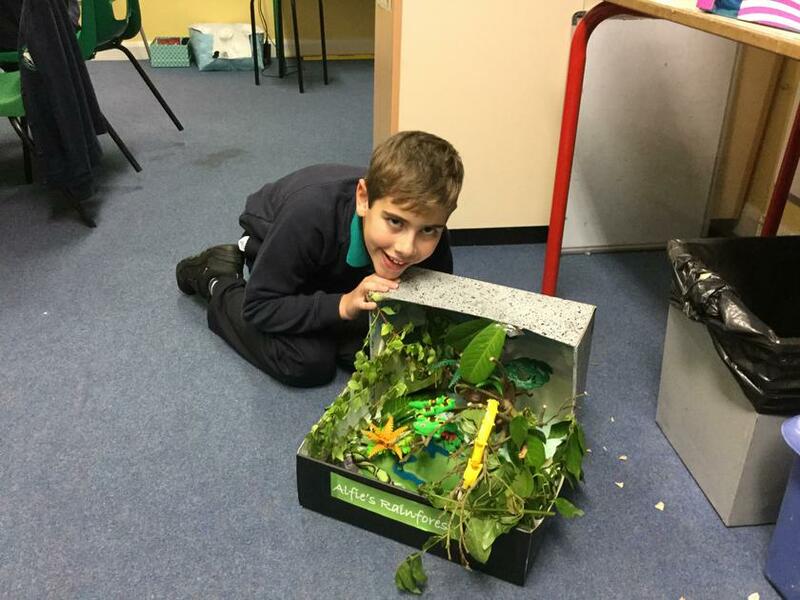 We've finally come to the end of our Animal Classification and Habitat Unit and the students have very much enjoyed learning the basics of conservation biology and ecology. 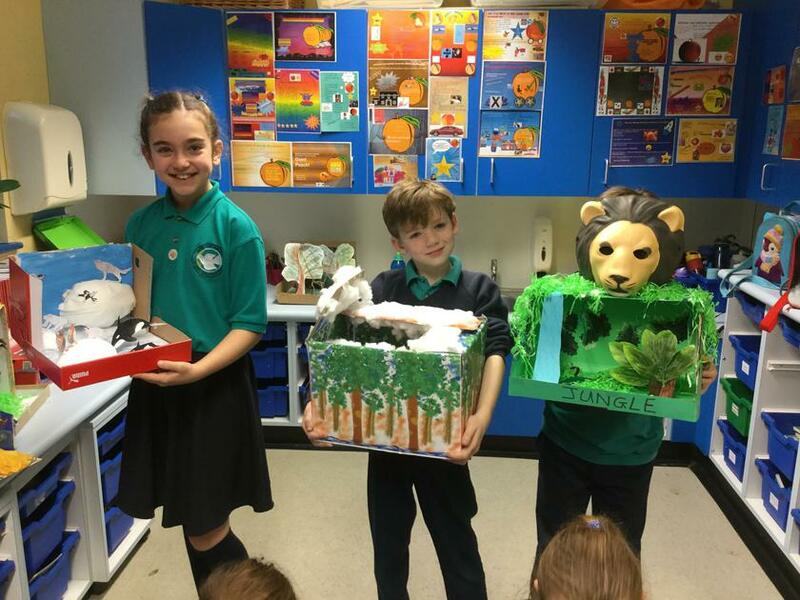 We began by learning how scientists classify animals (vertebrates vs. invertebrates) and moved onto discussions of local and global animal habitats. 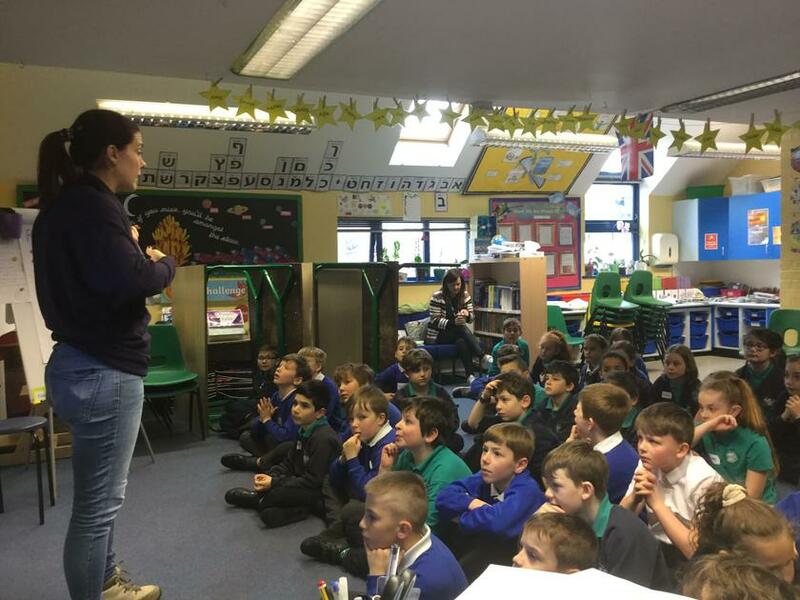 We learnt about predators and prey, about the food chain and about the global crisis of animals--including humans--being threatened by factors like pollution and global warming. 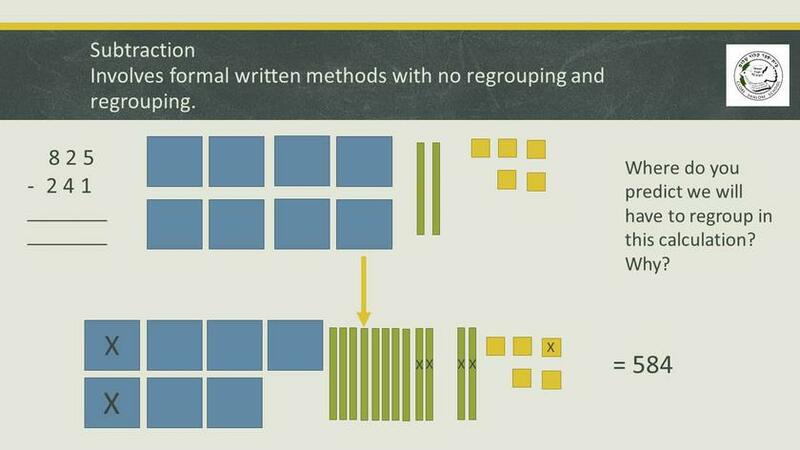 This week, in addition to the grid, the students were each given an extra sheet of multiplication work to do to support them in rapid recall of the times tables. 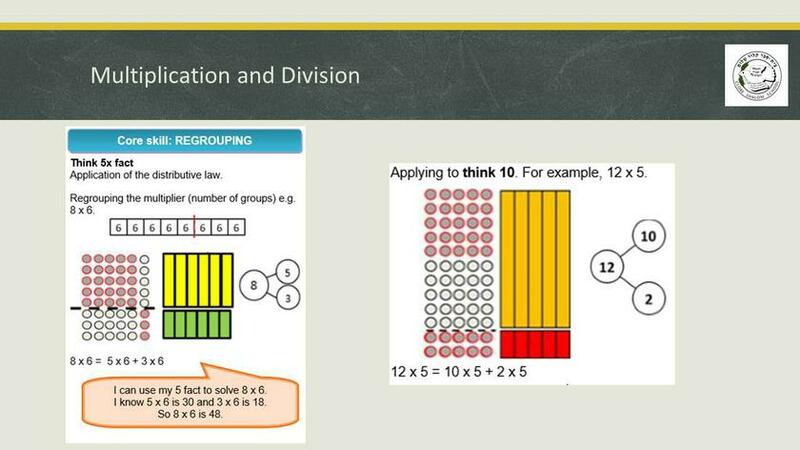 If you feel your child(ren) is/are secure in the times tables through 12s, please do quiz them on DIVISION facts instead. 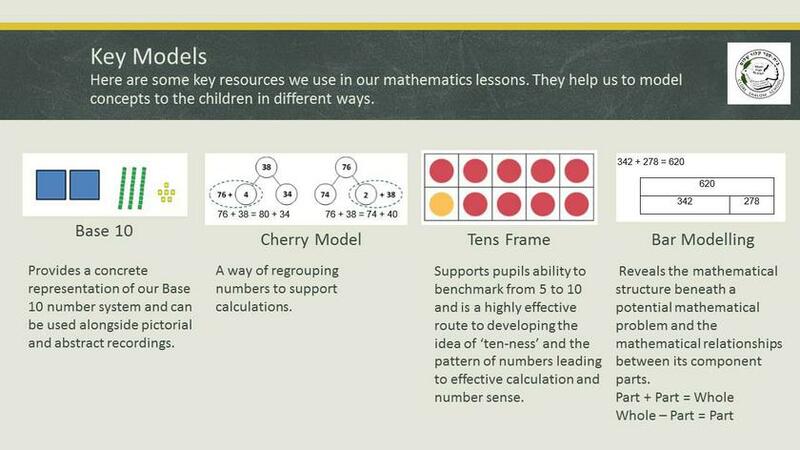 We are at a point in the year when instant recall of multiplication facts is crucial to their learning, so please practise with your child(ren) as much as possible. 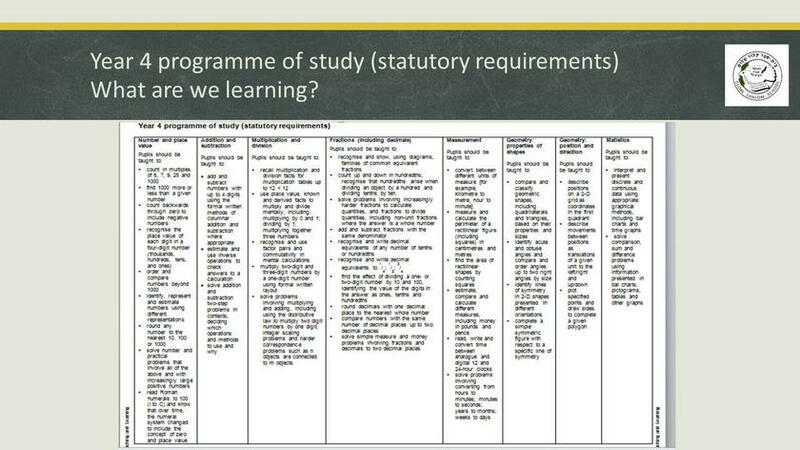 Spellings List 5 is shown below; the test for this list will be on Wednesday 29th November. 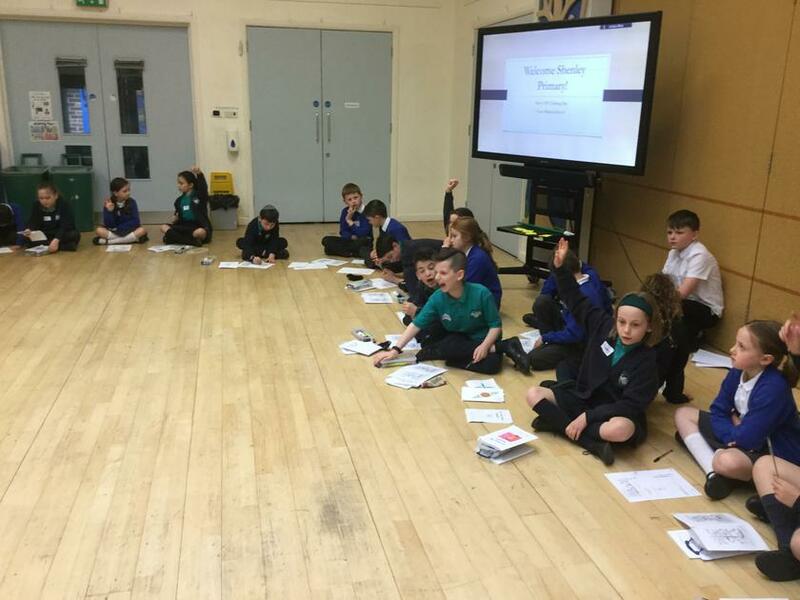 Year 4 had an fun-filled week of learning about the different kinds of bullying, how we can work together to prevent bullying from happening and--most importantly--what to do if we witness or experience bullying firsthand. 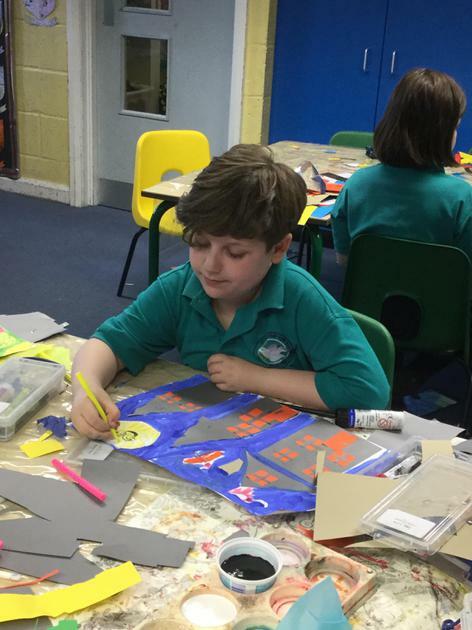 We began the week in House Groups; each House designed a poster with an anti-bullying slogan in the centre. 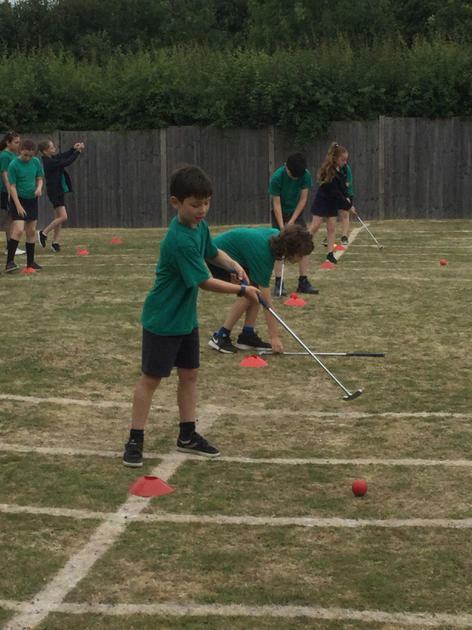 Each day of the week, Year 4 took part in different lessons and workshops on this theme. 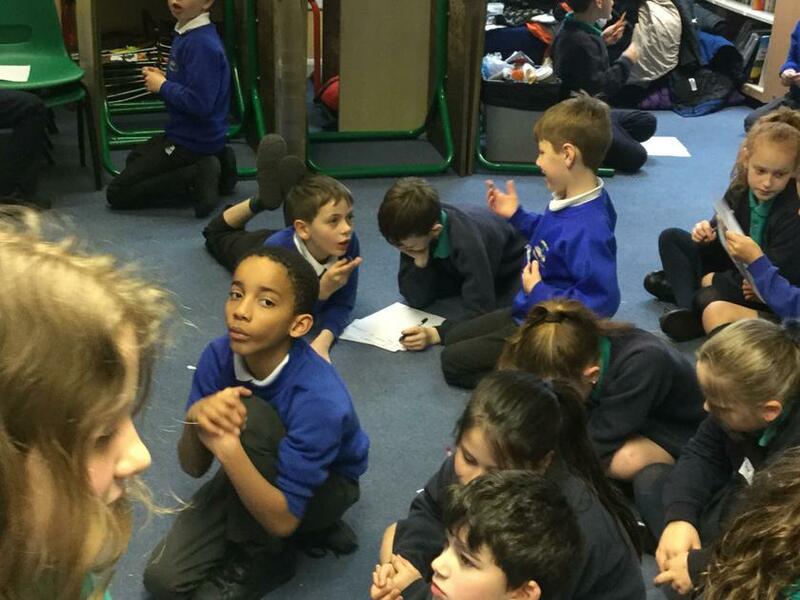 The pupils generated some fabulous writing in response to a short film we watched; some of their writing will be displayed in the hall next week. 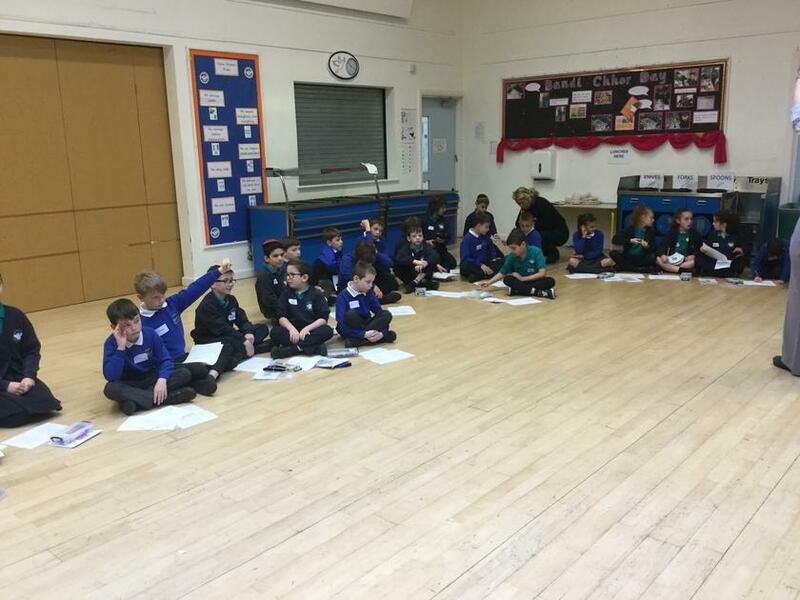 We've begun a new novel this week: How to Train Your Dragon by Cressida Cowell. 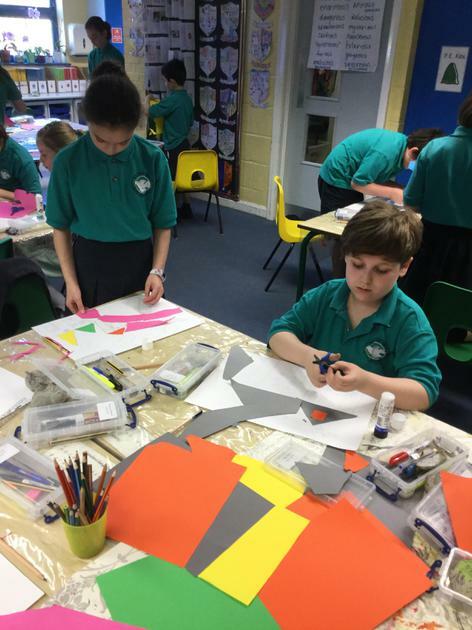 The students' first assignment was to create a dragon of their own, which the students had lots of fun doing. 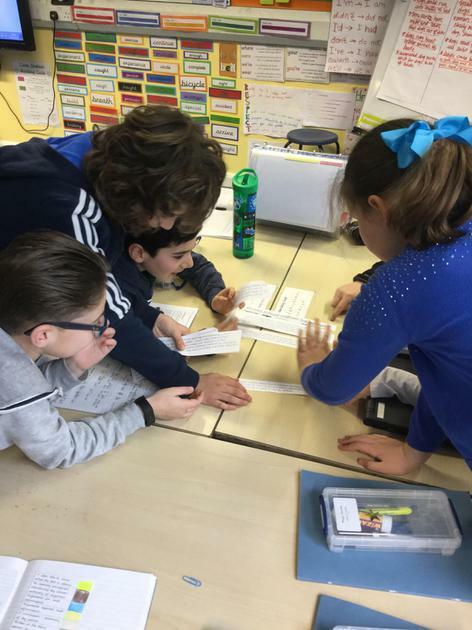 We brainstormed and developed a word bank filed with amazing adjectives to describe dragons and then everyone was off to work designing their original beasts. 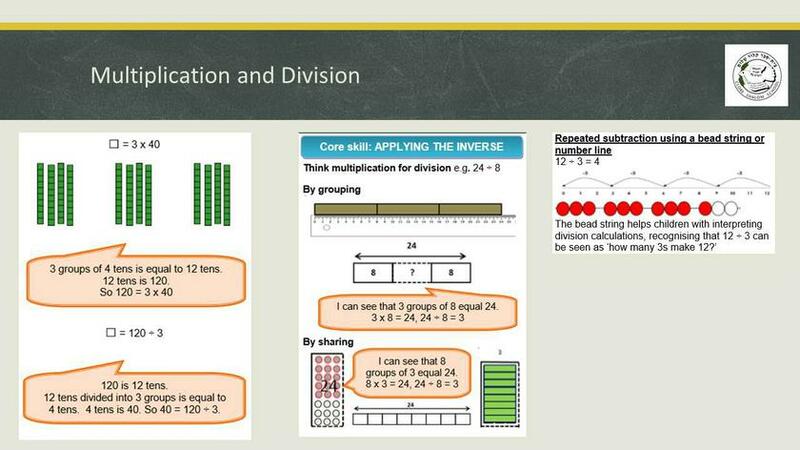 In Maths, we've started learning about the Distributive Law of Multiplication. 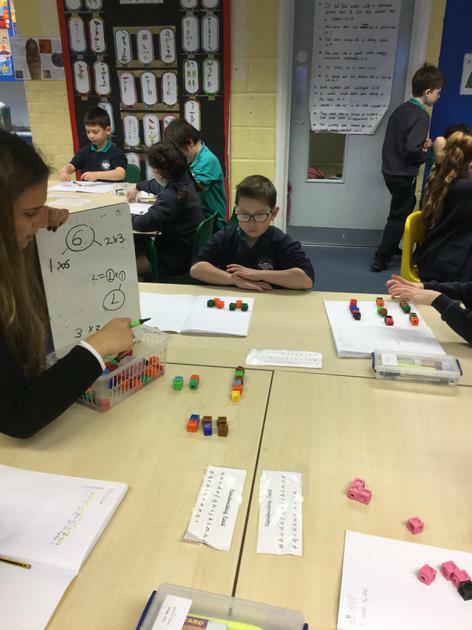 The pupils have been learning to build arrays and regroup them using their knowledge of the times tables. 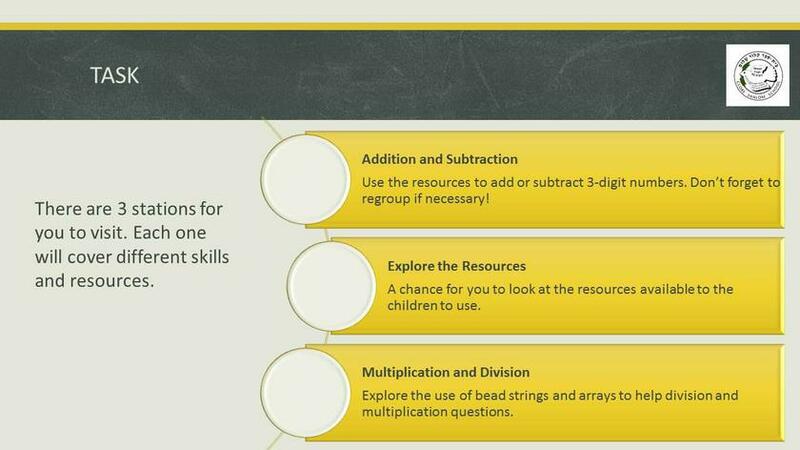 Please do help to reinforce our lessons by practising multiplication facts at home with your children. 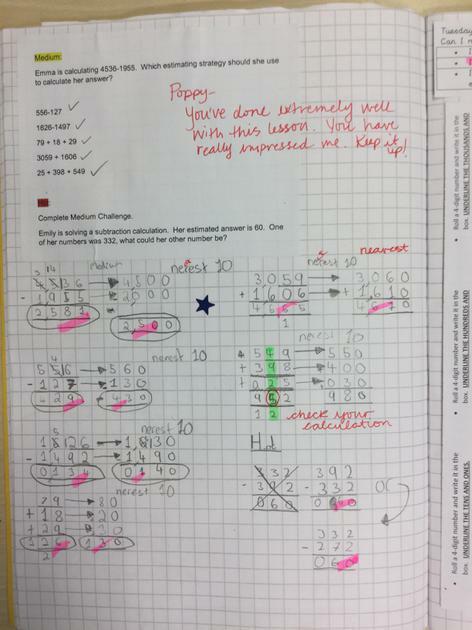 Aside from regrouping, we have been looking for patterns and links within the multiplication tables. 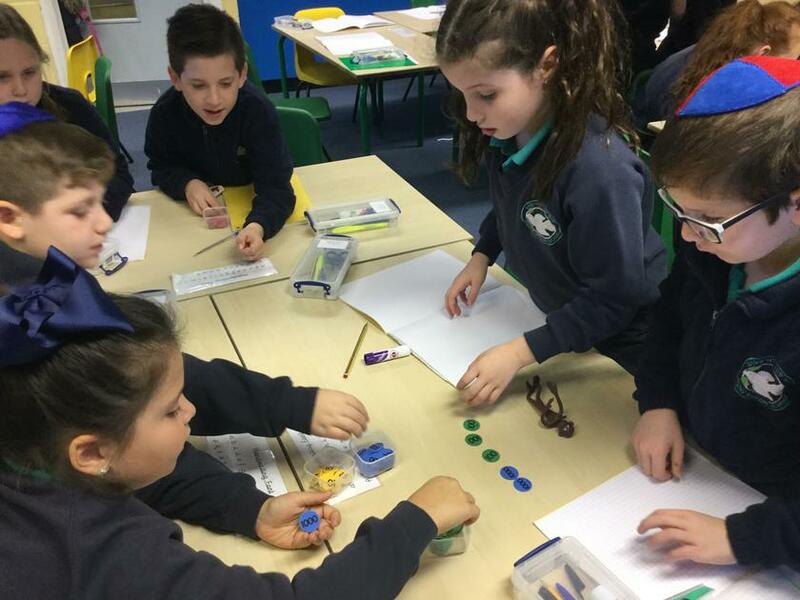 We used 'Number Dials' to help us see the patterns more clearly. 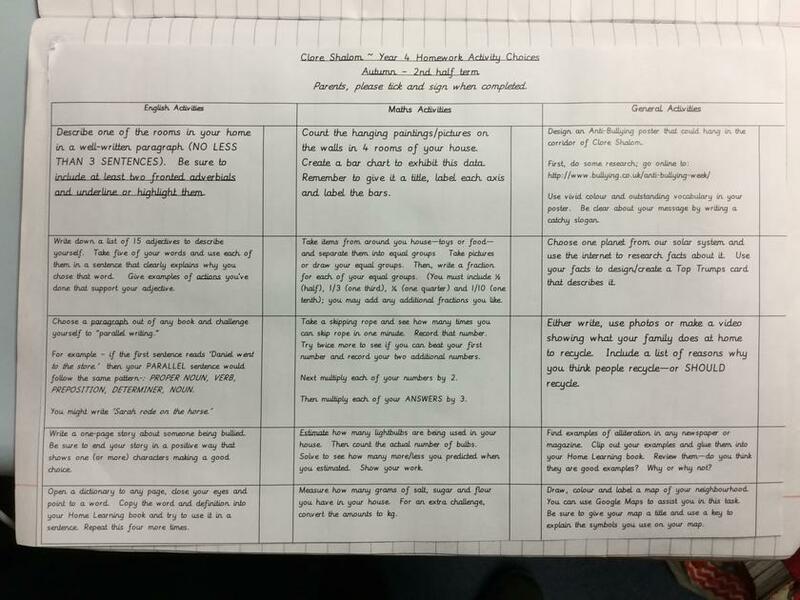 First and foremost, here is a copy of Year 4's Home Learning Grid for this half term. 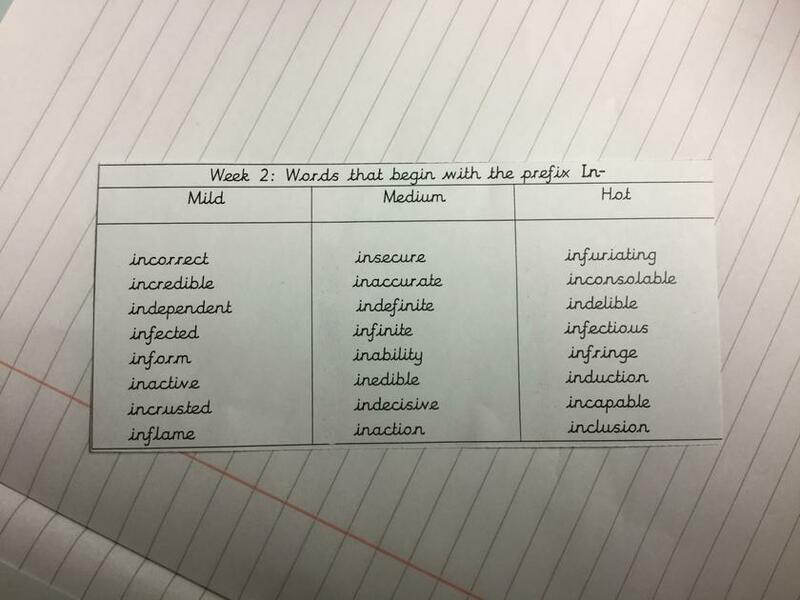 Below that is this week's Spellings list; the test on these words will be Wednesday 8 November. 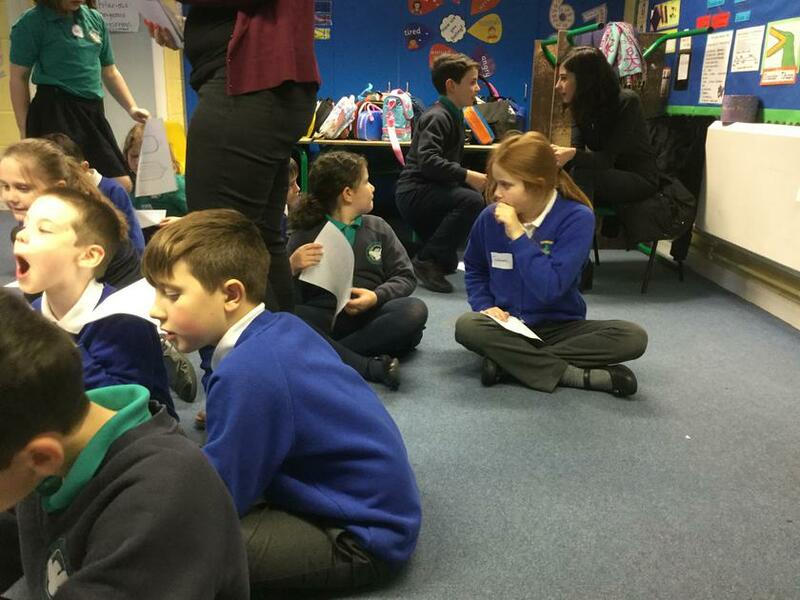 This week, the students have been merging their History and English lessons in order to explore the story behind Guy Fawkes Day and the failed Gunpowder Plot of 1605. 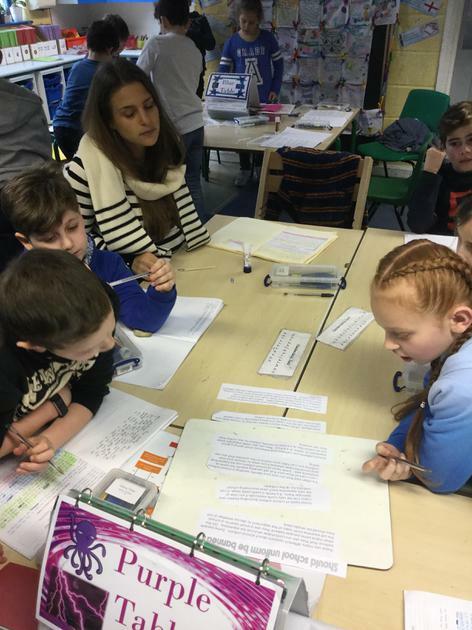 The children spent all week reading and studying the historical events and, on the literacy side, each student wrote a cinquain - a 5 line poem (similar to haiku) - either about Guy Fawkes and his plot or the modern experience of bonfire night. 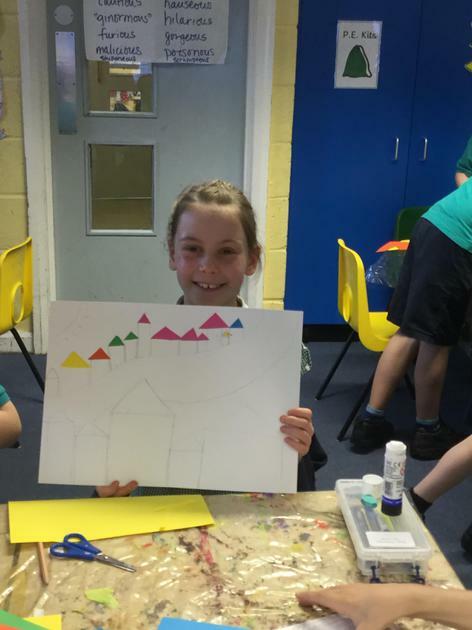 As an Art lesson, the class used glitter, pastels and chalk to decorate a cutout of the Houses of Parliament against a background of a night sky filled with fireworks. 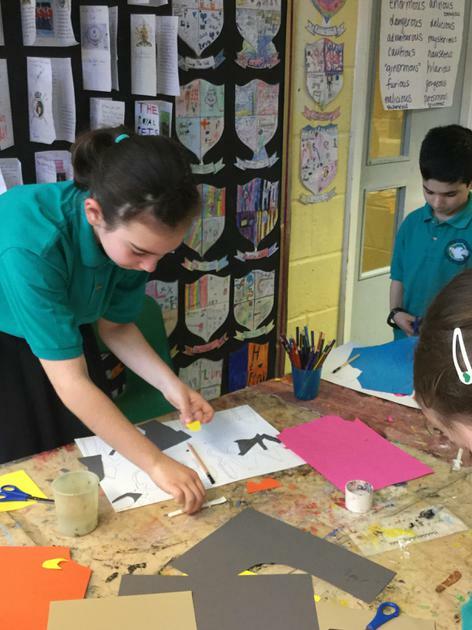 Some of the best works will soon be displayed in the corridor just outside the Hall next to our British Values board, so parents - please do have a look at Year 4's hard work when you are in the building. 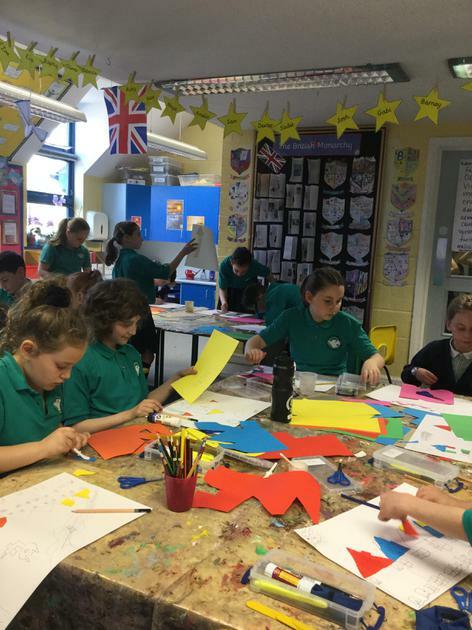 The half-term holiday is upon us and the students in Year 4 have been very busy since we began in September. 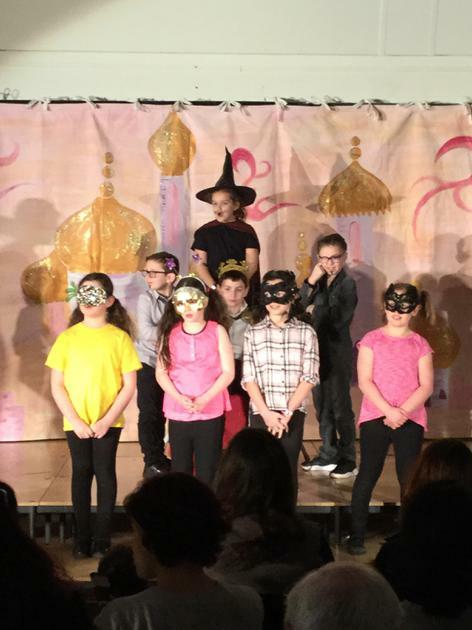 The students enjoyed a drama-based lesson on Egyptian Gods and Goddesses. 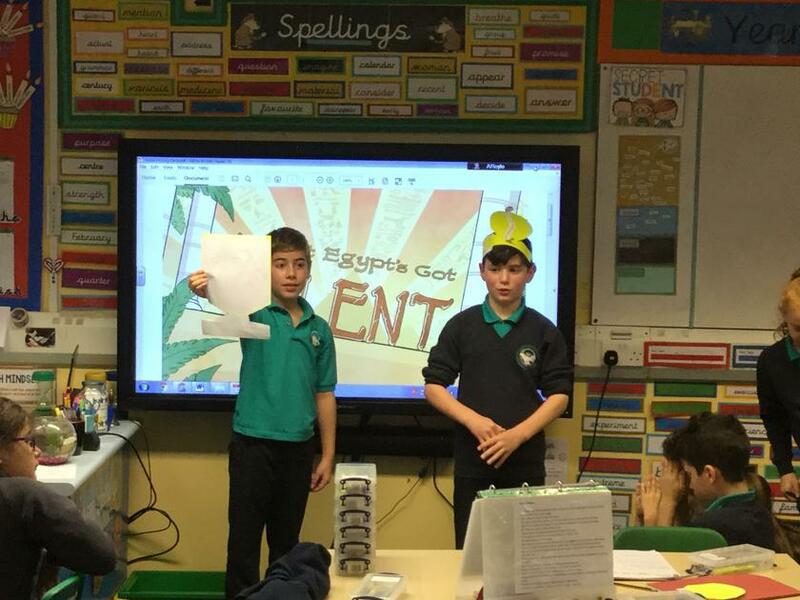 Each small group came up with a short skit that revealed their chosen God or Goddess's powers. 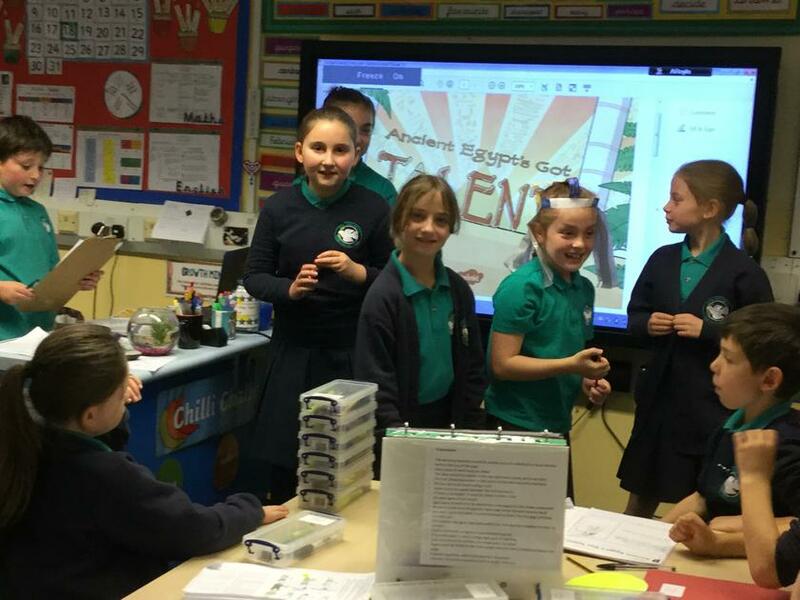 The students then "competed" in Ancient Egypt's Got Talent. 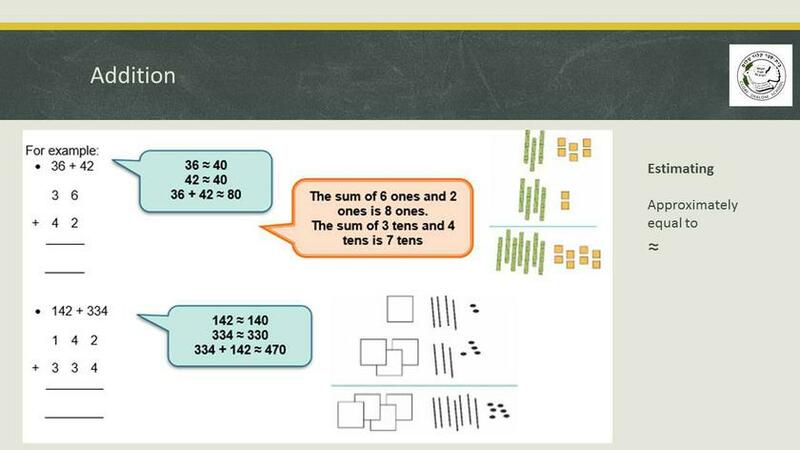 This week, we worked on using rounding skills to estimate sums and differences. 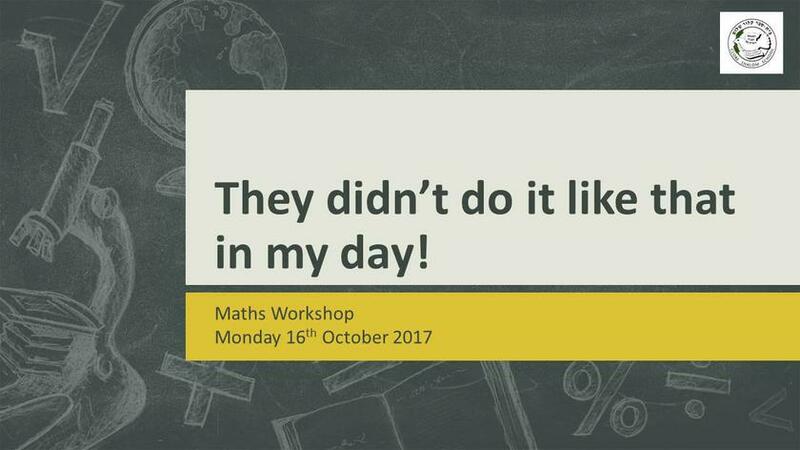 This is a mental maths skill that is particularly useful when working with money, which will be part of next week's challenges. 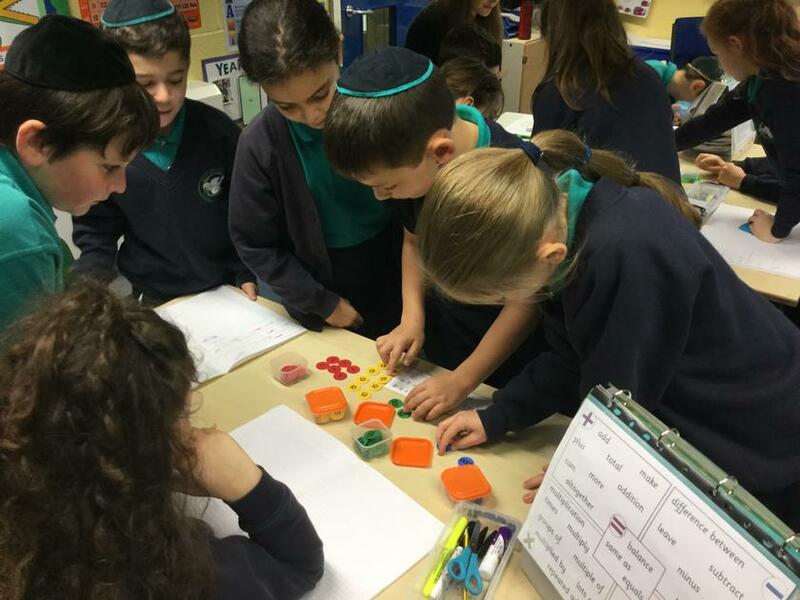 In addition to estimating, we worked on regrouping, and the class used Base 10 blocks to support their understanding of this concept. 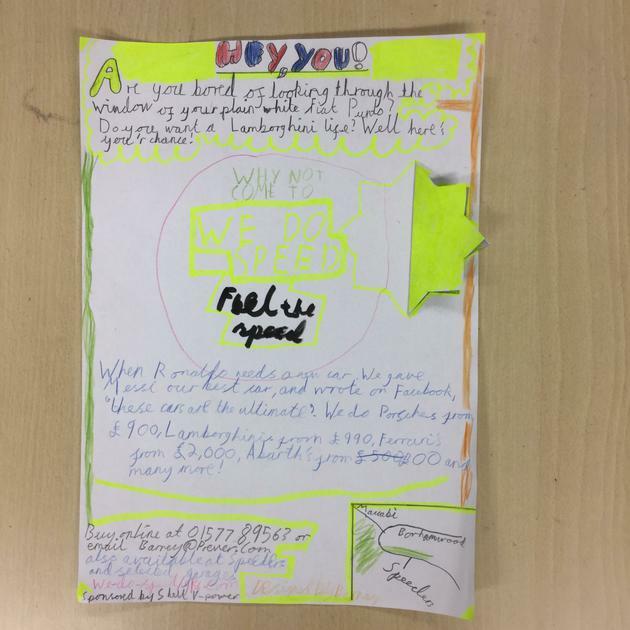 In English, we learnt about the persuasive writing that goes into writing adverts. 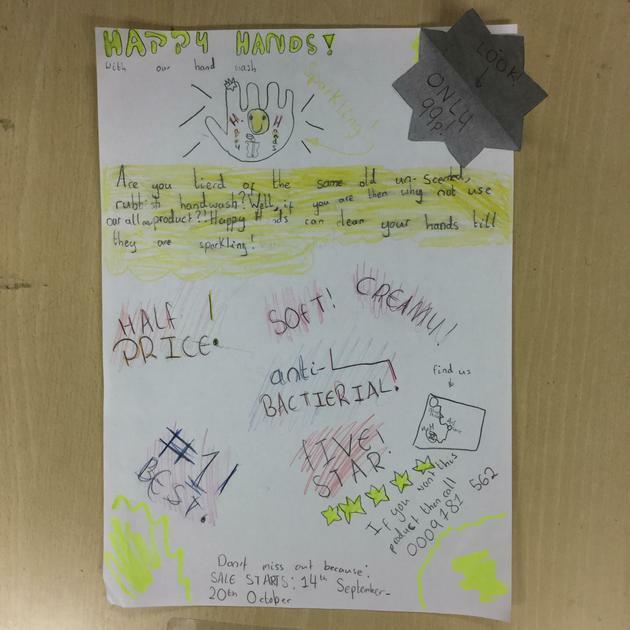 The pupils investigated many of the "hooks" advert authors use to grab the attention of their readers--who are actually potential customers! 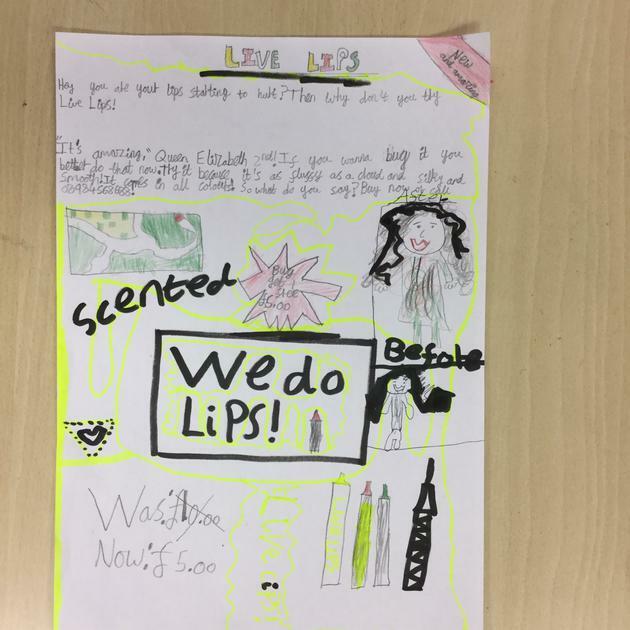 We discussed many strategies--slogans using alliteration, celebrity endorsement, special offers, logos and vivid colour pictures, promises and powerful word choice. 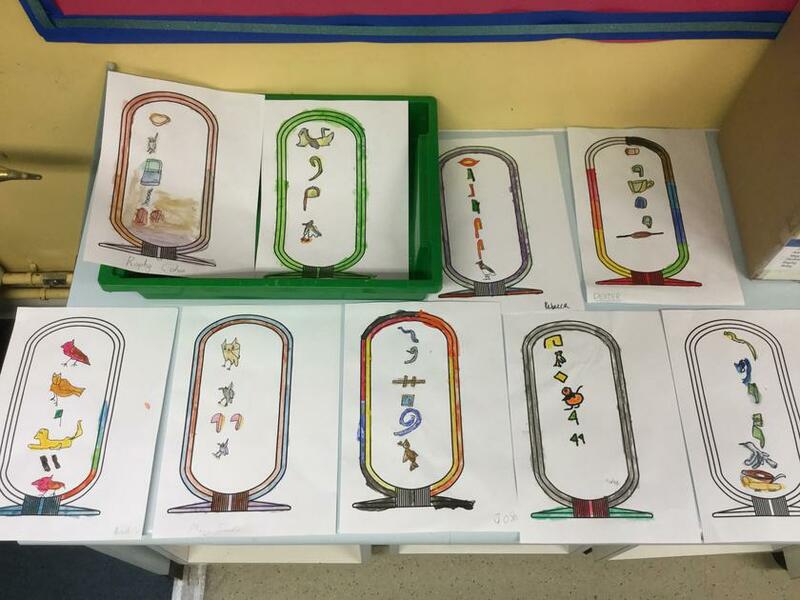 Year 4 is still learning about Ancient Egyptian culture and this week, the class used sketching pencils and watercolours to create their own cartouche - an oval frame that traditionally would surround the name (written in hieroglyphs) of a powerful leader, a priest or even a God or Goddess. 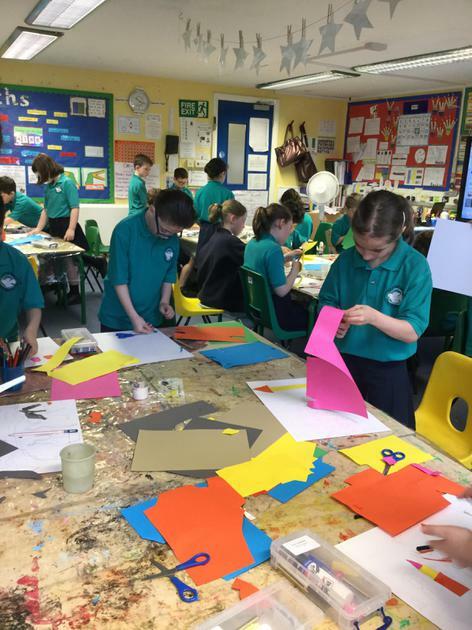 We are all looking forward to our upcoming visit to the British Museum to view the magnificent Egyptian collection, which will be an exciting opportunity to view actual Egyptian artifacts up close. 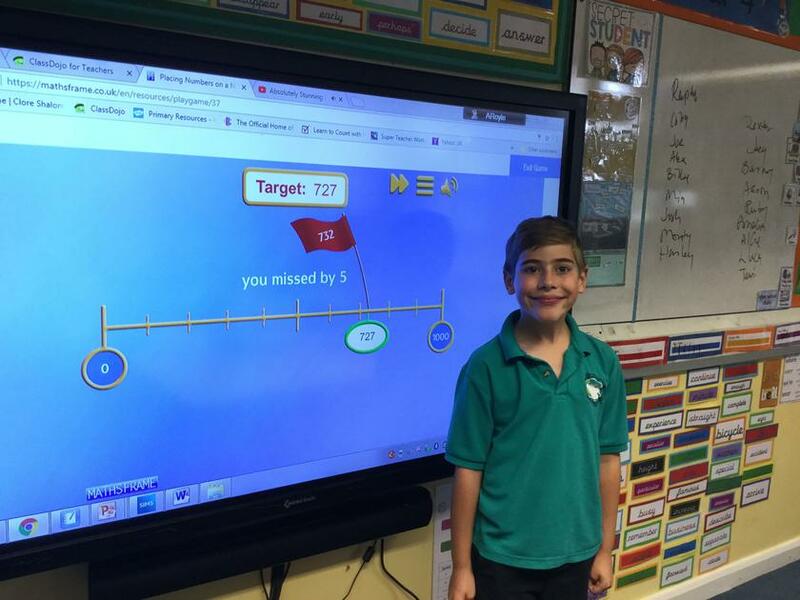 This week in Maths, we worked on rounding 4-digit numbers to the nearest 10, 100 and 1,000. 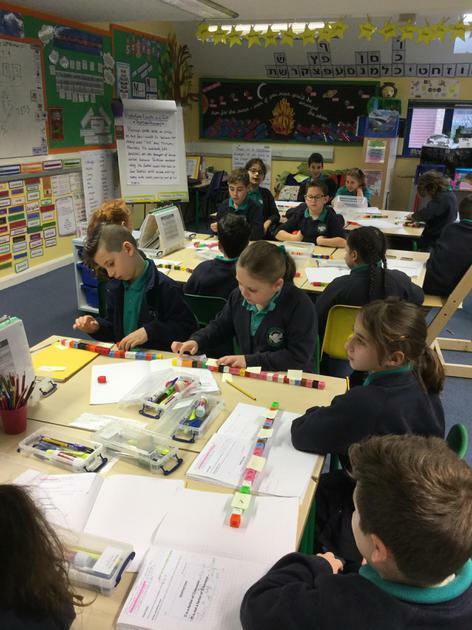 We also used our estimation skills to determine where a number might appear on a given numbers line; this is referred to as using a line of magnitude and, after some practise, Year 4 has become quite adept at this skill. 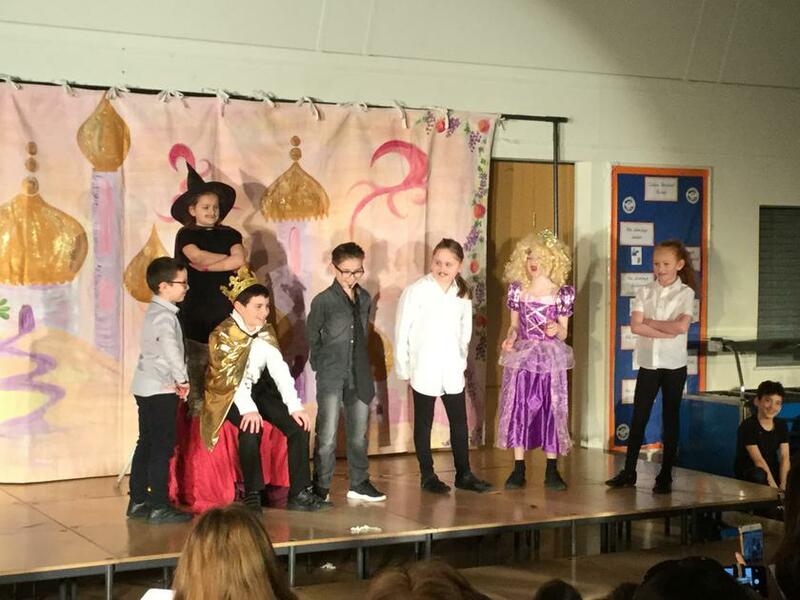 The students are still enjoying James and his adventure in the giant peach. 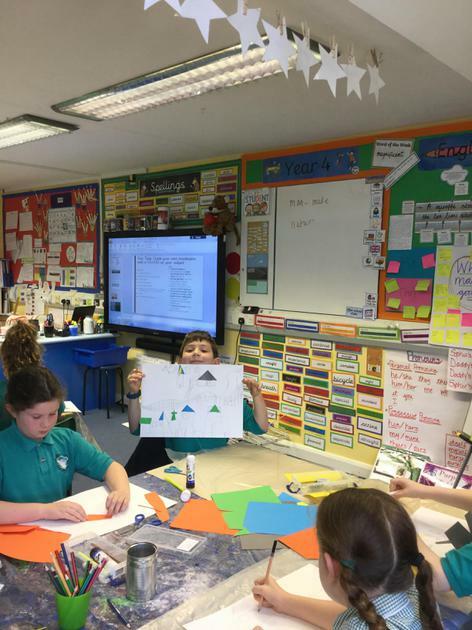 This week, we focused on describing a setting using strong adjectives, fronted adverbials and complex sentence structure. 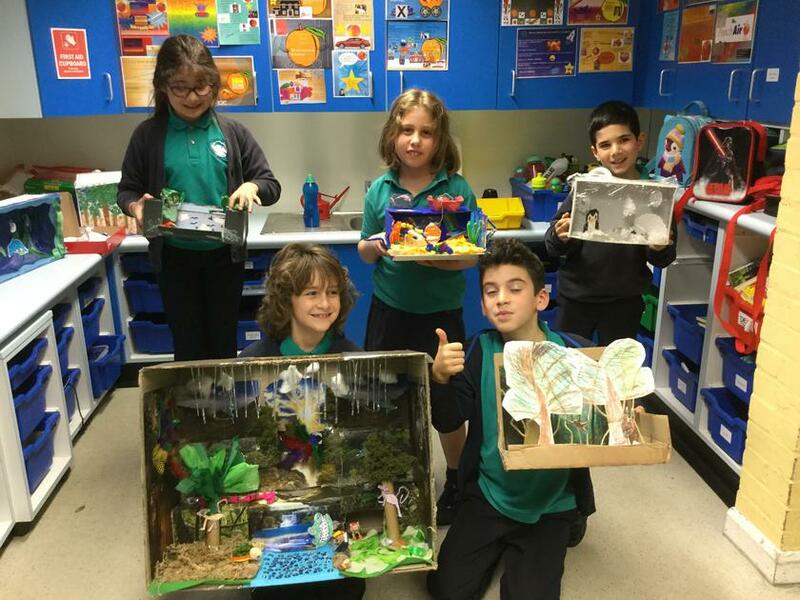 Our Science curriculum has taken us in a new direction--we are now studying about living things-the characteristics of life, habitats, classification and the human impact on the natural world. 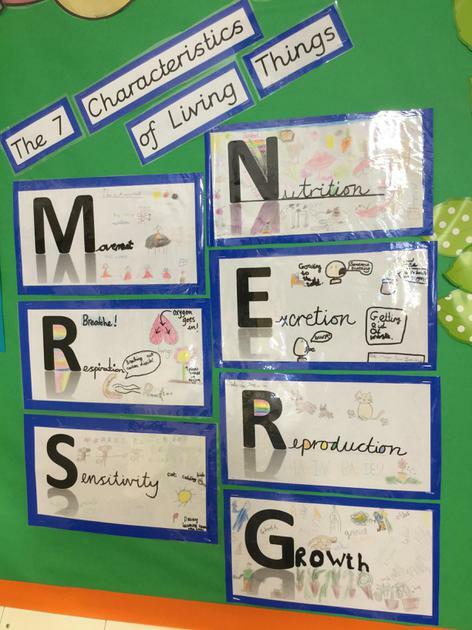 We began by getting to know "The 7 Characteristics of Living Things" and the pupils use the acronym Mrs Nerg to help them remember each of the characteristics and their meanings. 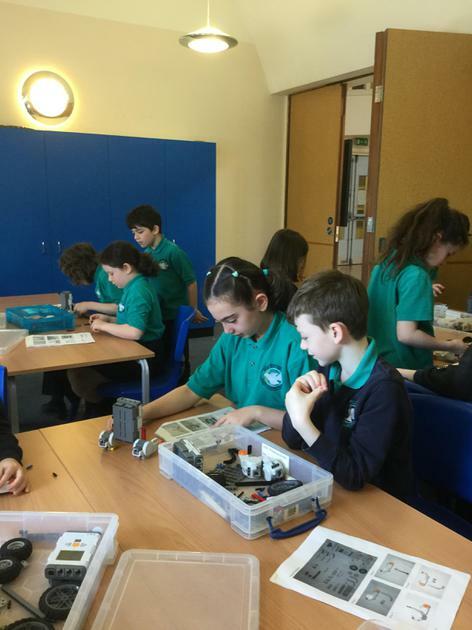 The class was buzzing with curiosity; we enjoyed a full half-hour of discussion and the group was eager to learn more. 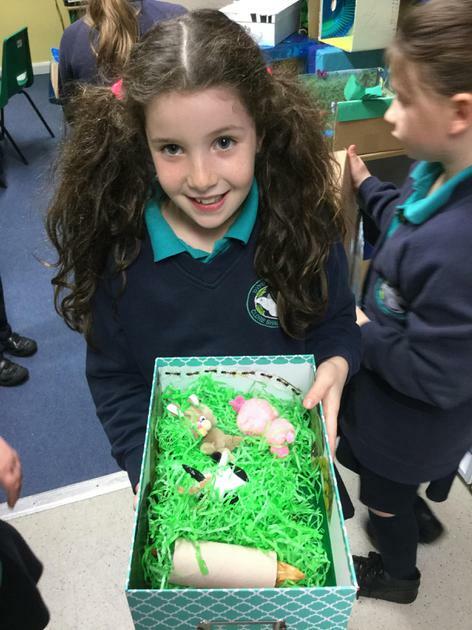 I have no doubt that this will be one of the highlights of the Science curriculum! 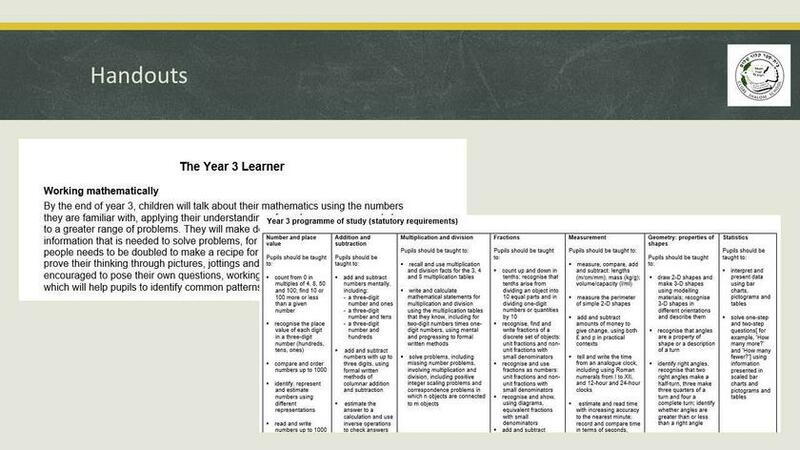 This week, we've focused on recapping Place Value concepts, particularly reviewing the value of each digit, determining 'greater than/less than' and ordering them in 'ascending and descending' lists. 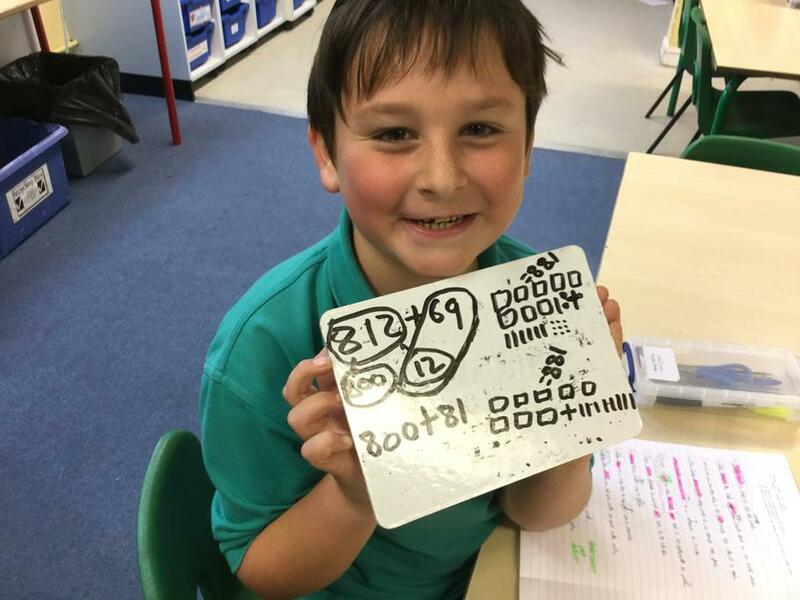 We've extended our learning beyond our prior work in Year 3 into working with 4-digit numbers. 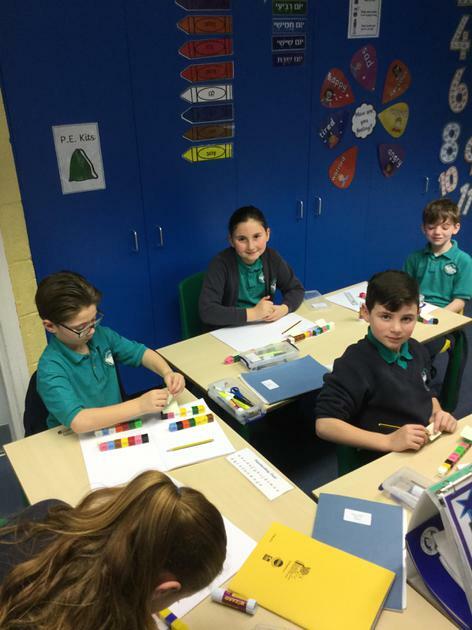 Additionally, we have introduced the concept of negative numbers, which the students picked up extremely quickly and have enjoyed using number lines and various manipulatives that are available to support their understanding of concepts both old and new. 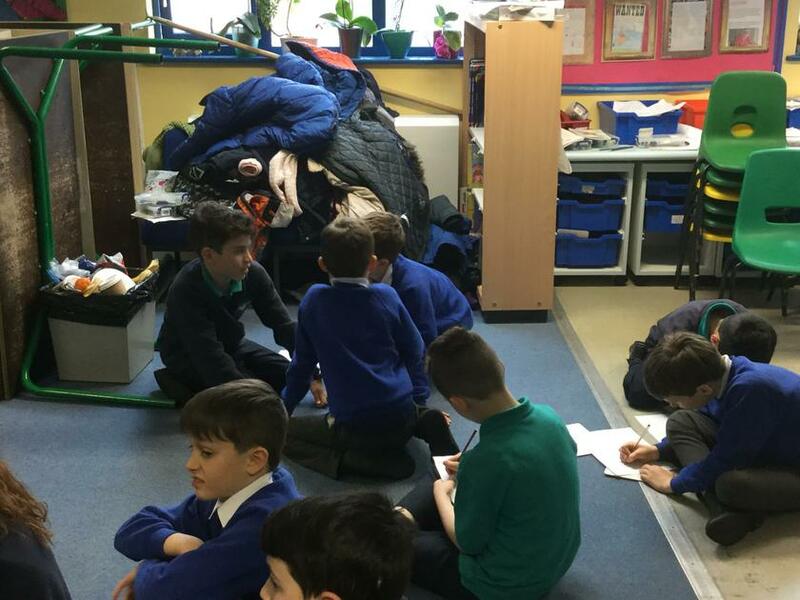 The class is still enjoying the Roald Dahl novel James and the Giant Peach. 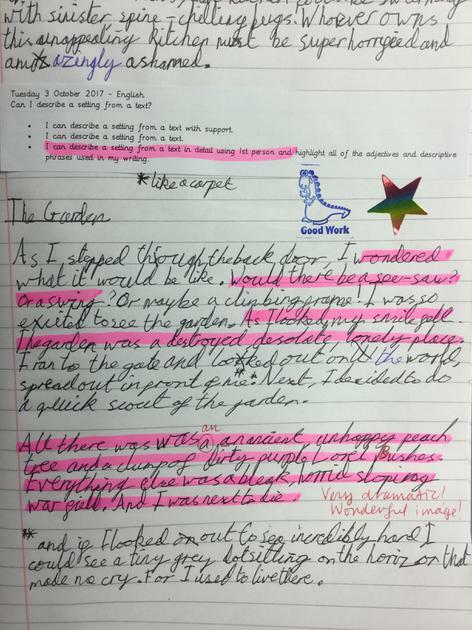 We completed a piece of extended writing (as well as a few smaller writing assignments) based on the first 3 chapters of the book; many of the pupils' works are on display in the main corridor of the school--I encourage all parents to stop and have a look when you are in the school! 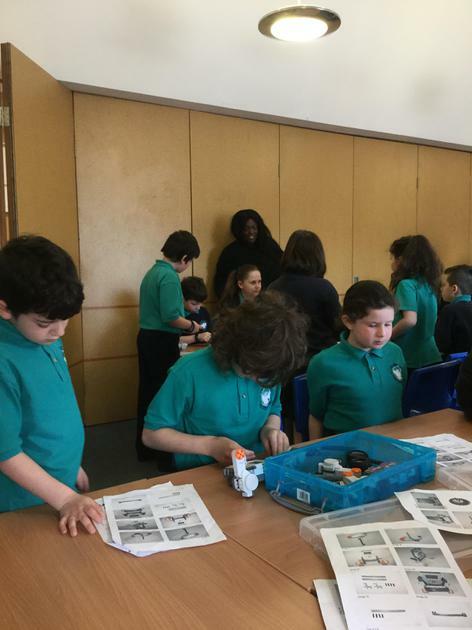 Please do check in with your child(ren) and if they have any missing school supplies, they do need to bring 20p per item. 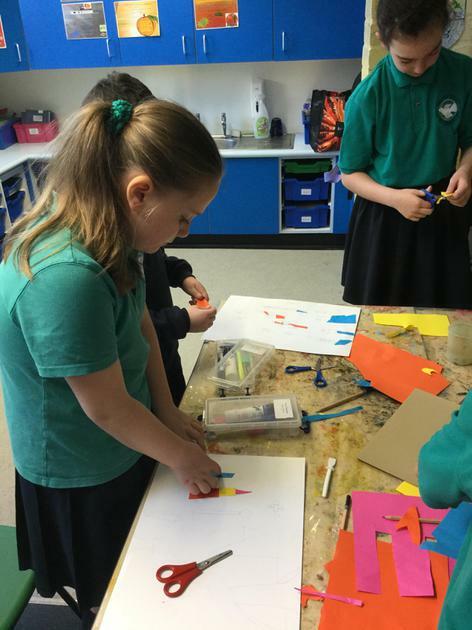 Our class did another supply audit today and many of the pupils need to purchase new glue sticks as a matter of urgency. 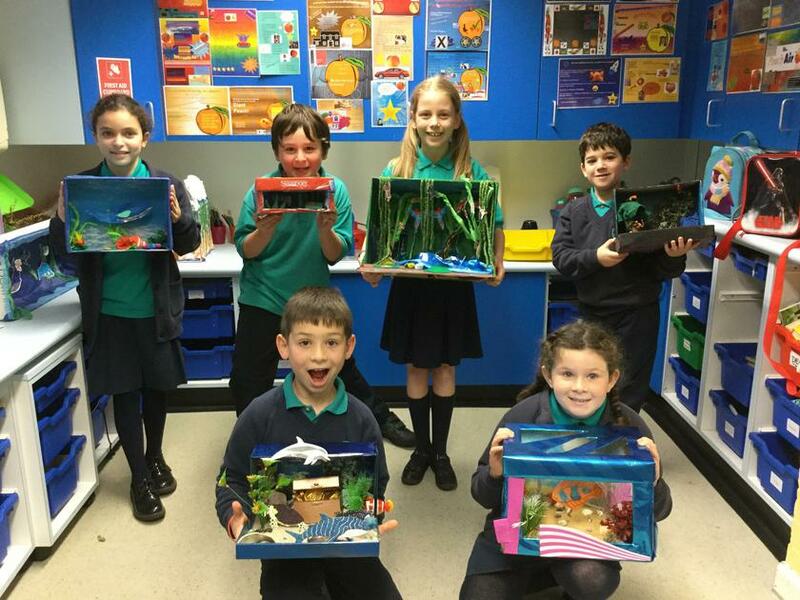 Their supplies are vital to their success in class--please support them in this! 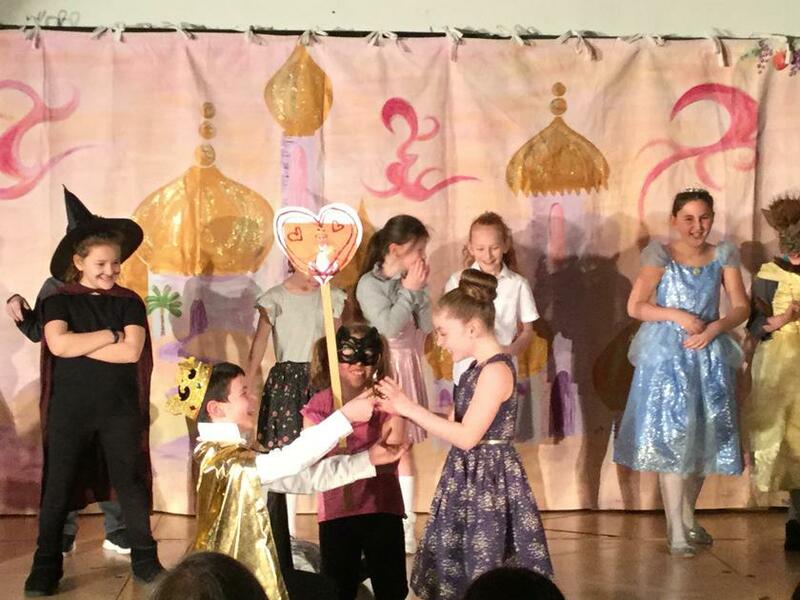 Additionally, we do need to have the signed copy of both the Internet Safety Contract and the Home School Agreement returned as soon as possible. 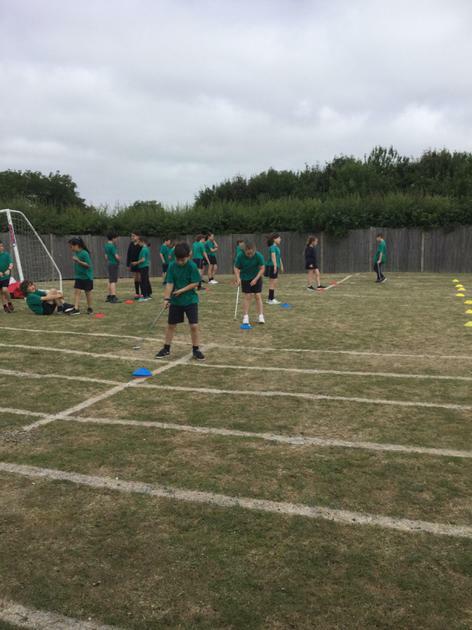 Thank you to those who have already done so. 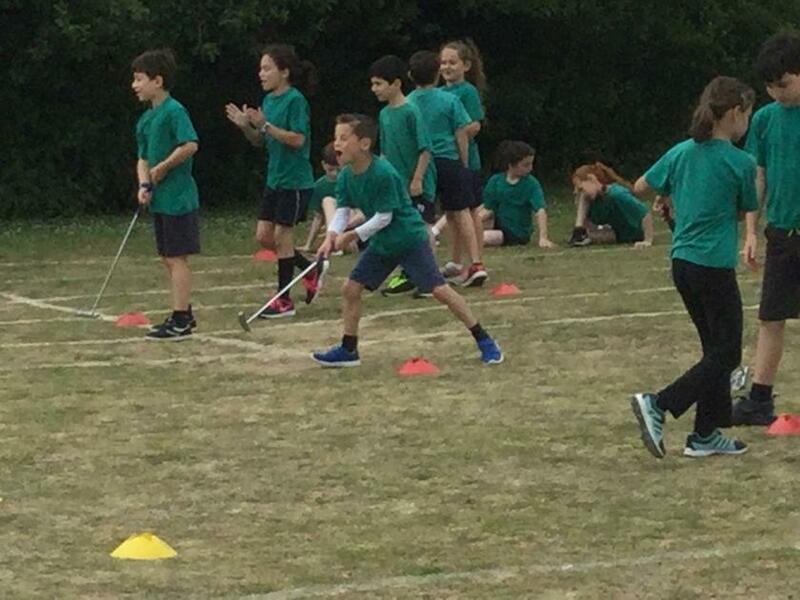 Finally, I want to wish all of the Year 4 families a Shanah Tovah and a healthy fast on Yom Kippur. Please do not worry about Home Learning for this week--enjoy the chaggim with your families and friends. 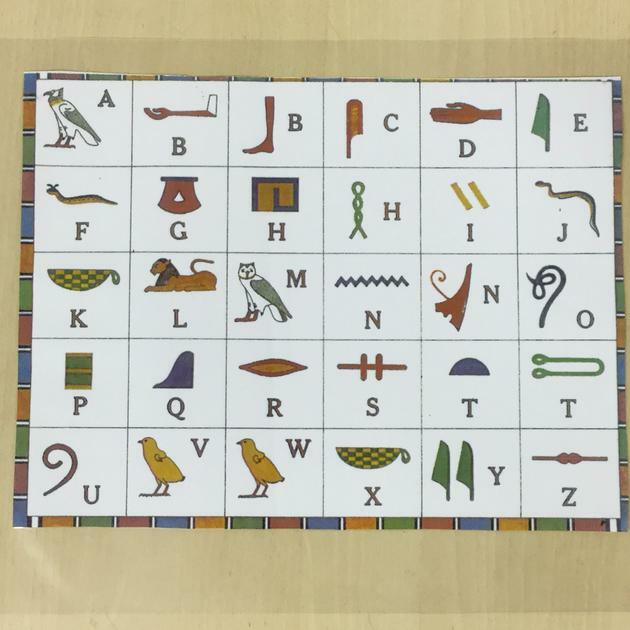 This term, we've been studying the daily life of the people who lived in Egypt during ancient times. 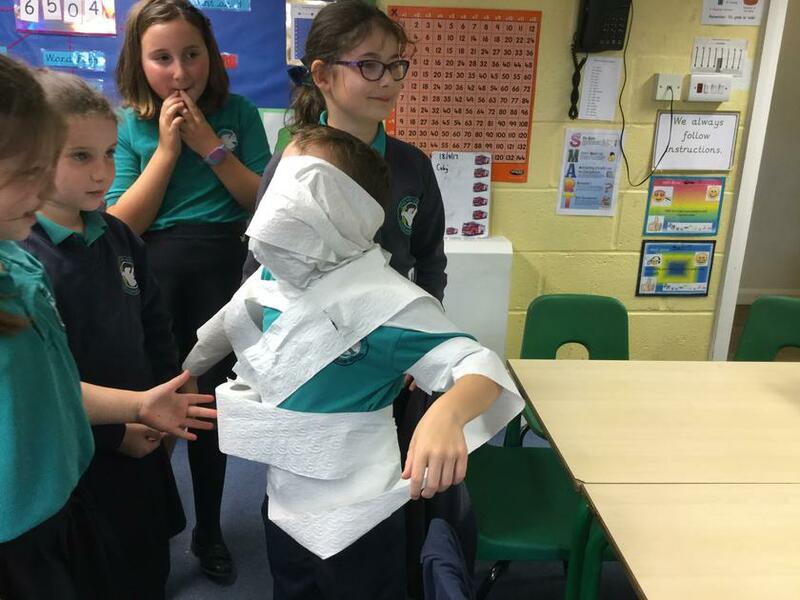 The students have been learning about the various jobs people held--farmers, soldiers, stonemasons, scribes, fisherman, jewellery makers, boat builders, slaves and special priests who were responsible for the complex process of mummification of the dead. 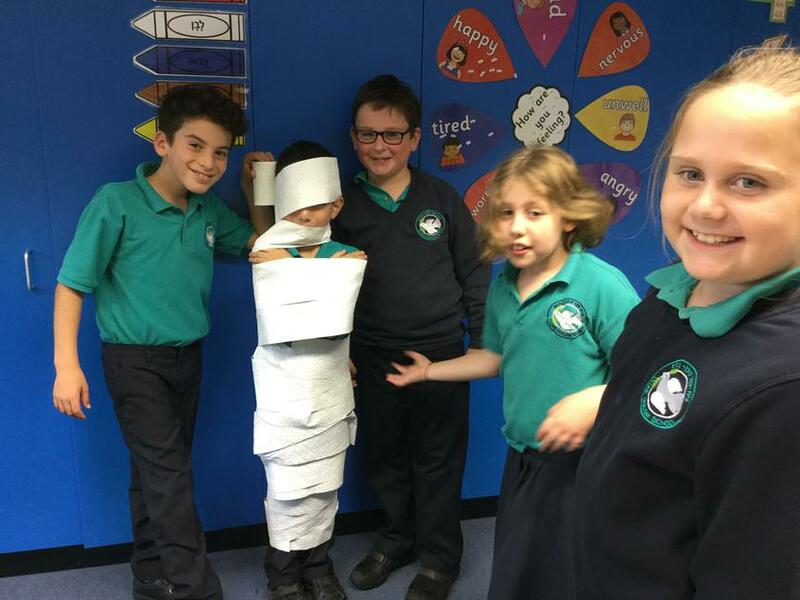 The students particularly enjoyed hearing about how bodies were prepared for burial and the class had a grand time "mummifying" some of the members of Year 4! 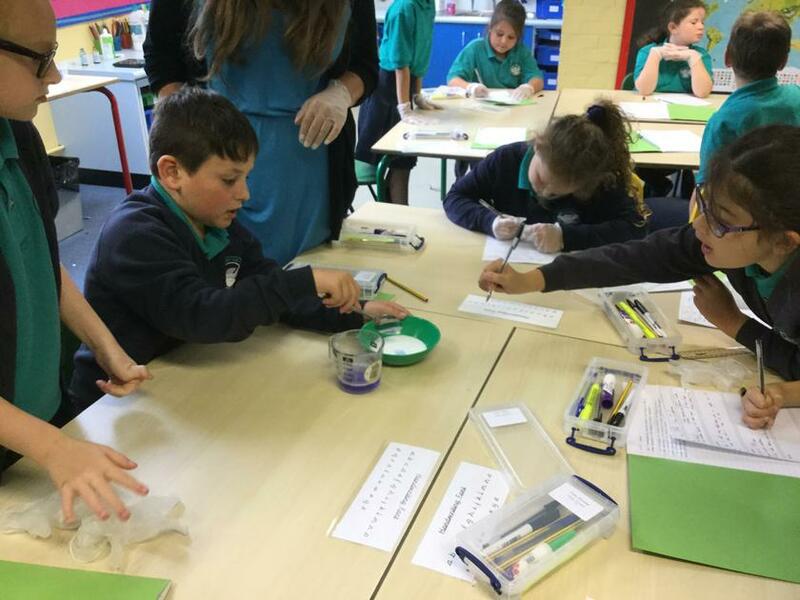 To introduce the proper procedure for running scientific experiments--namely, the Scientific Method, Year 4 engaged in a fabulous afternoon of SLIME MAKING! 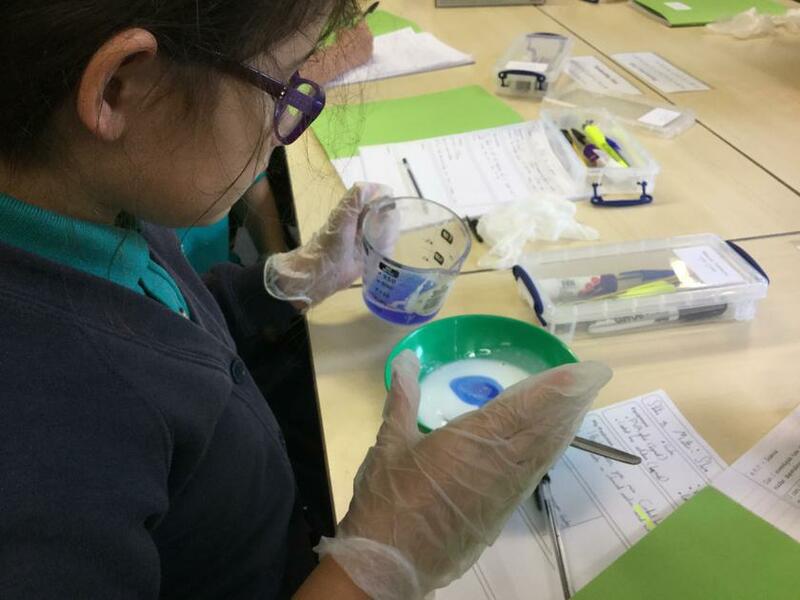 The pupils learnt about the states of matter and about chemical reactions. 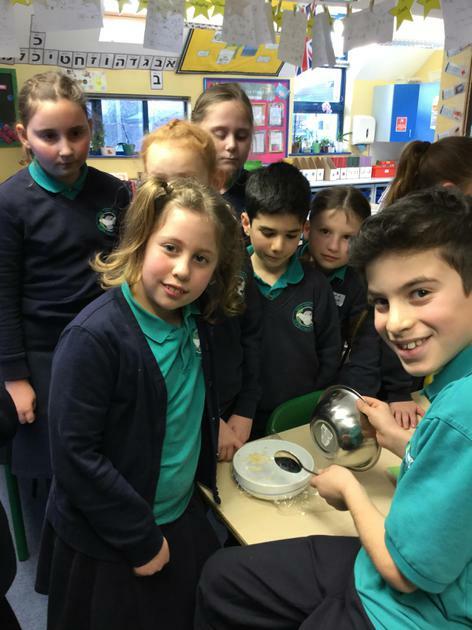 Before the experiment began, they made a prediction about what they believed would happen when they mixed the ingredients together. 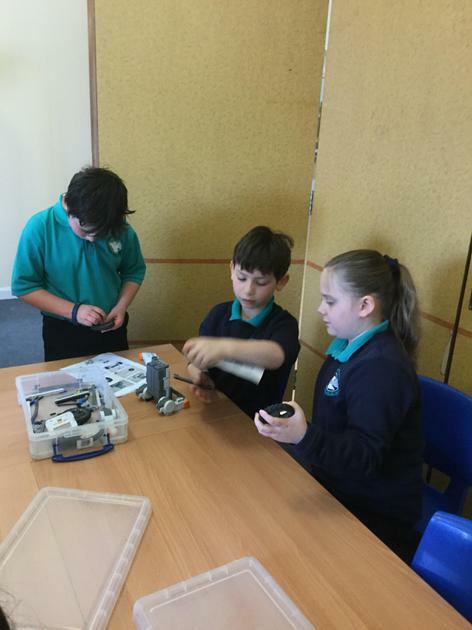 They ensured that their experiment was a "fair test" by changing the amounts of the ingredients they used, leaving some ingredients out altogether and by replacing the active ingredient with water. 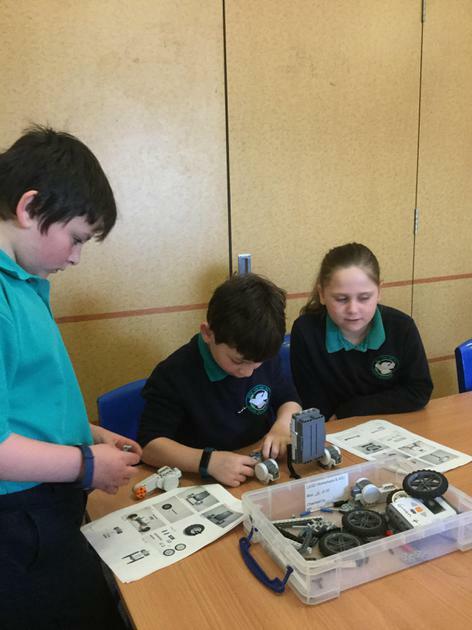 Once the slime had been created, they each wrote a detailed account of the materials used, the steps they followed and ultimately, whether or not their prediction was correct. 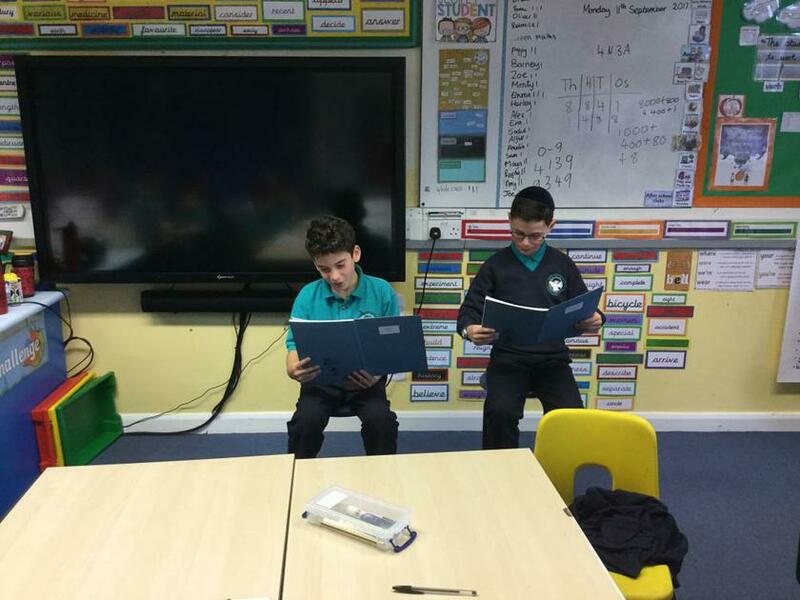 The class has begun to read James and the Giant Peach by Roald Dahl. 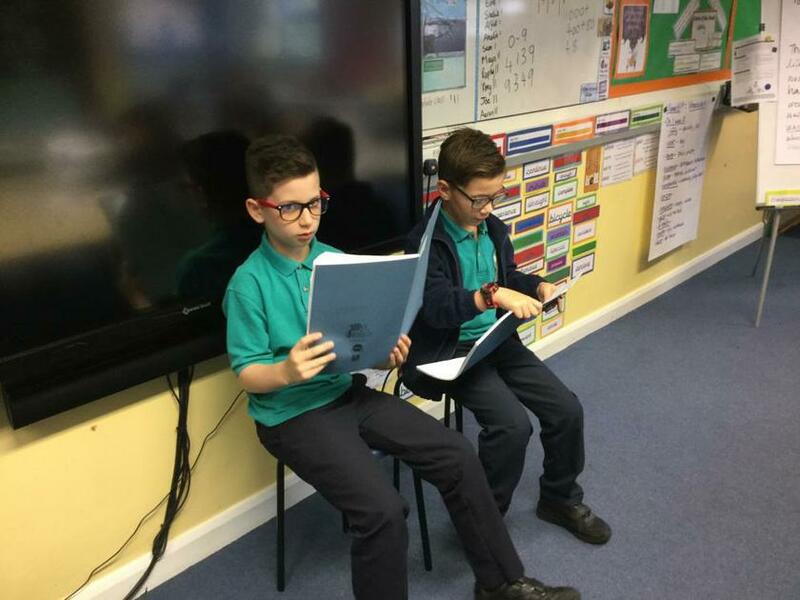 During the first two chapters, the class was introduced to James's terrible Aunts: Aunt Spiker and Aunt Sponge. 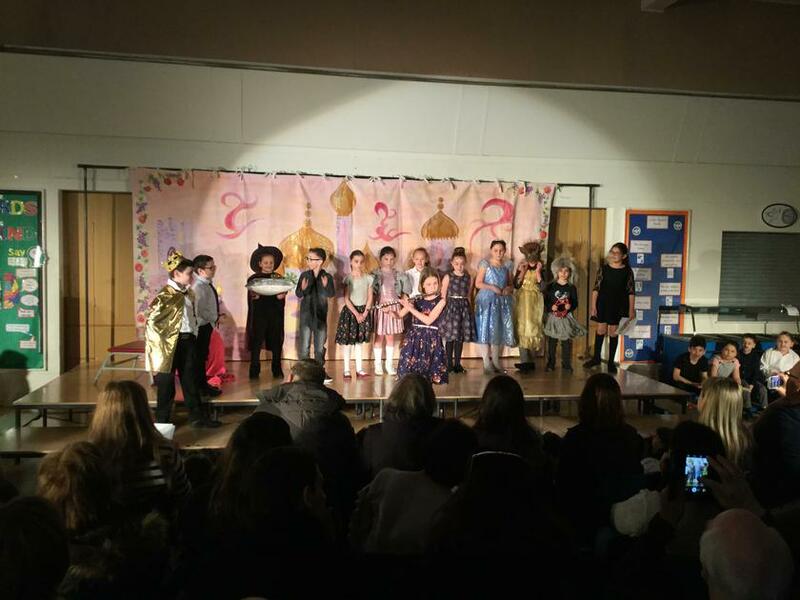 These two malevolent sisters treat James horribly and author Roald Dahl uses vivid figurative language--particularly metaphor and simile--to describe the wretched women who are now James's guardians. 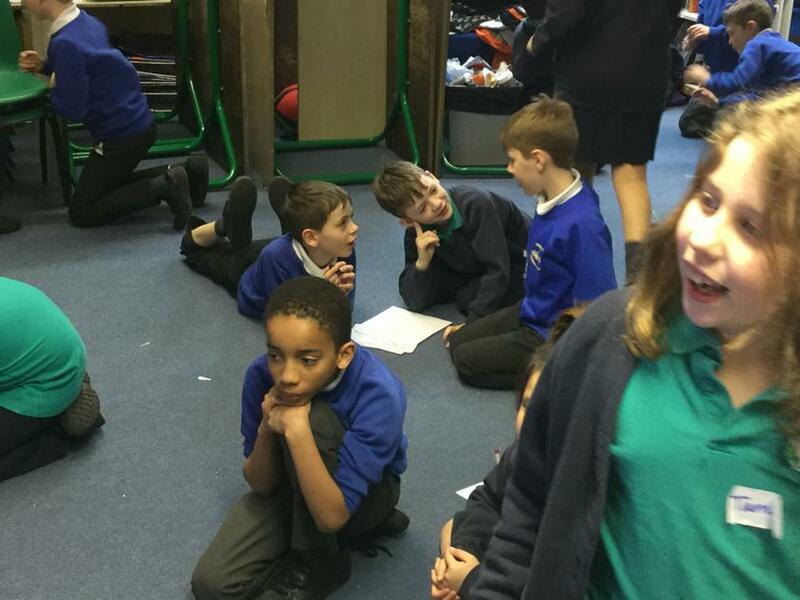 As a creative writing exercise, Year 4 was challenged to use descriptive and figurative language to create a THIRD horrible Aunt. 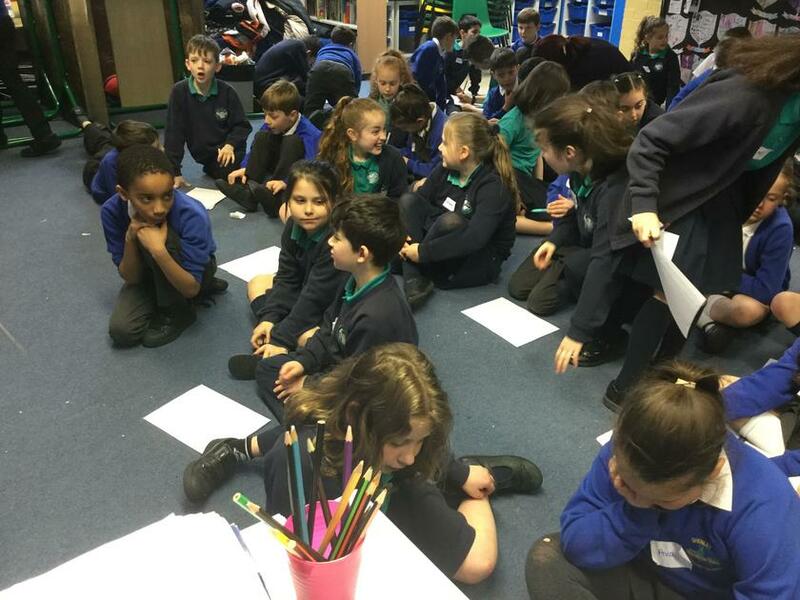 They worked in pairs and each child offered much of his/her imagination to collaboratively write outstanding descriptions of a new, awful Auntie. 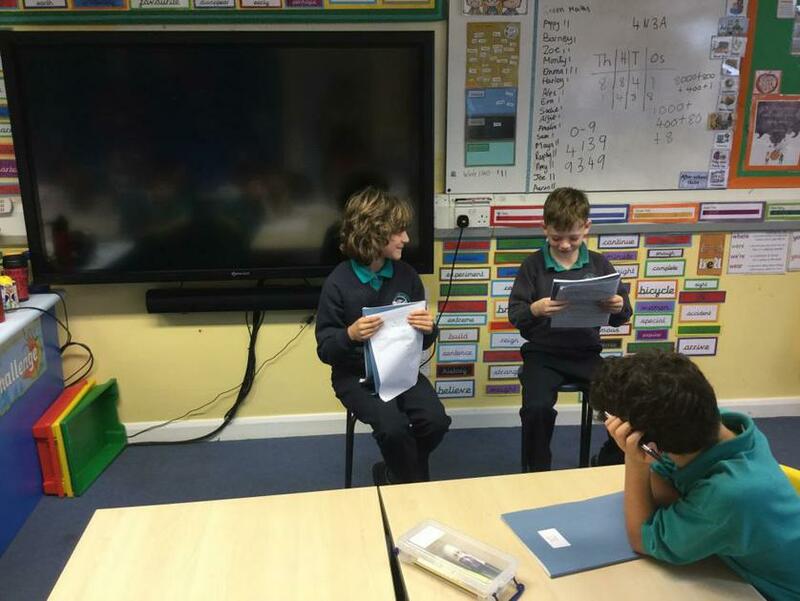 Once the children wrote their amazing (and quite humorous) descriptions, they were then asked to stand up in front of class and "become the Auntie" in a popular drama exercise called 'The Hot Seat'. 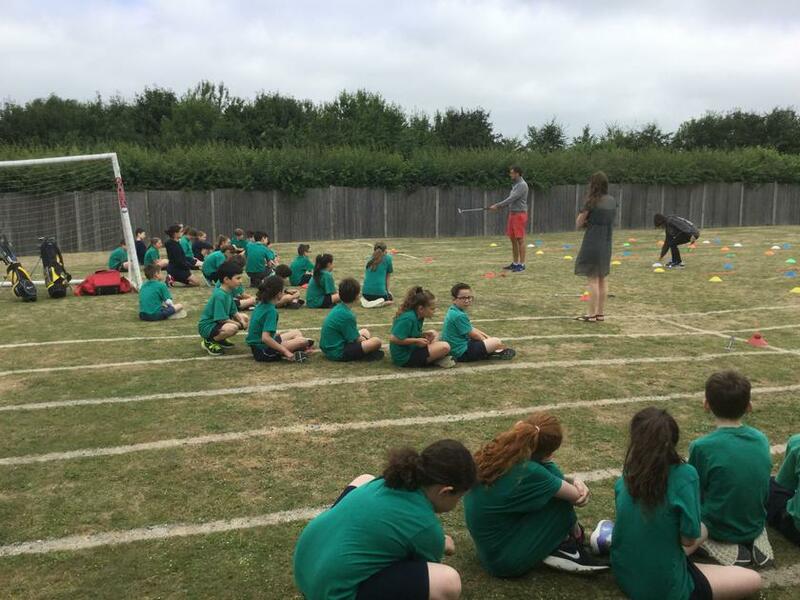 The students behaved as if they were the Aunt and were able to answer questions from the class about who she is and what makes her so horrible. 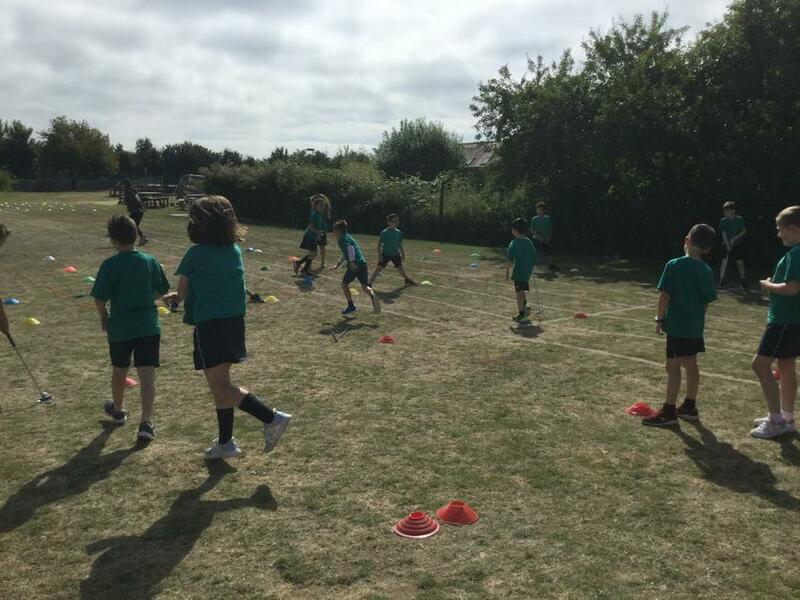 We hope you have had lovely holidays and are now gearing up for working hard in Year 4. 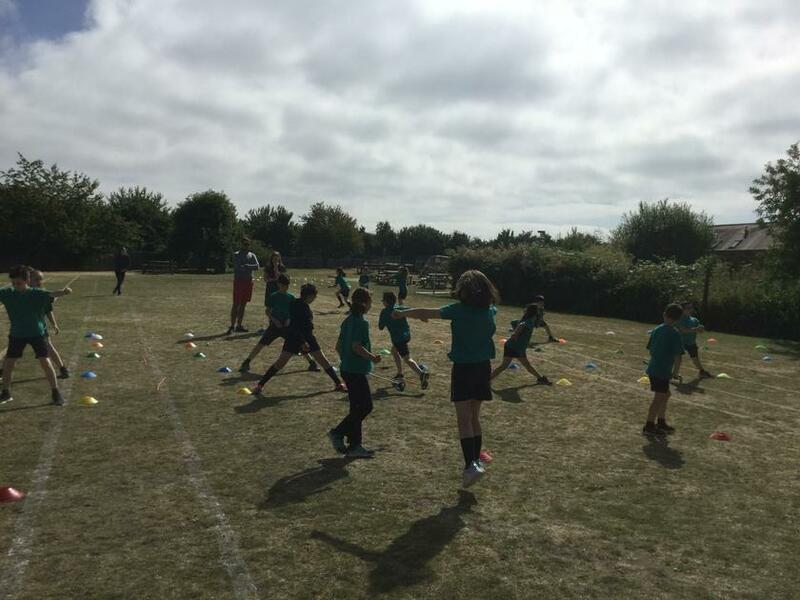 We are both very excited to be teaching you this term and we are ever so excited as we have a year full of fun things planned! 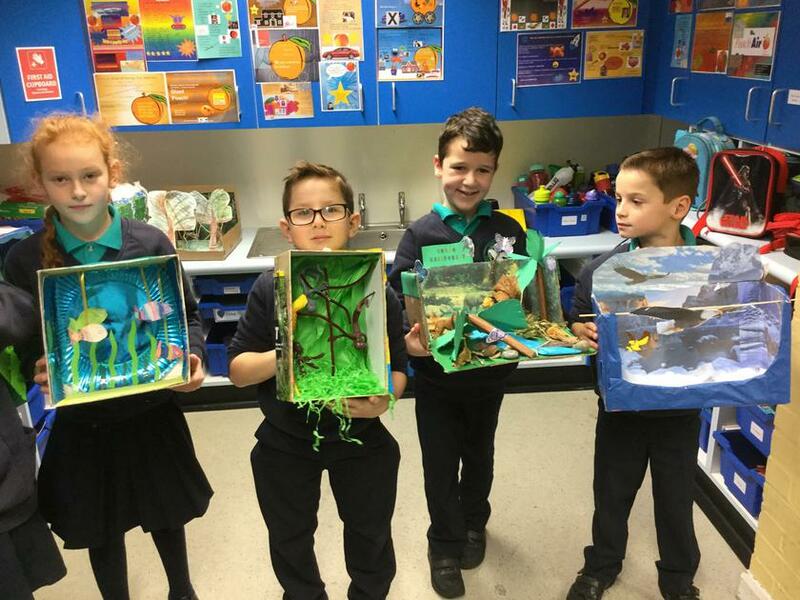 This term we will be looking at animal habitat and classification in Science. 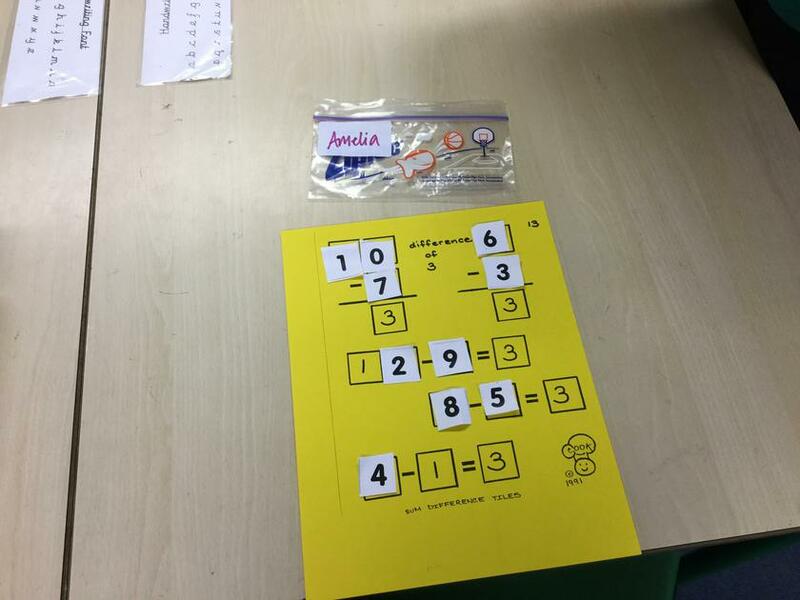 In Maths, we will be working on place value and number patterns, so make sure you have been practising your times table as they will come in handy. 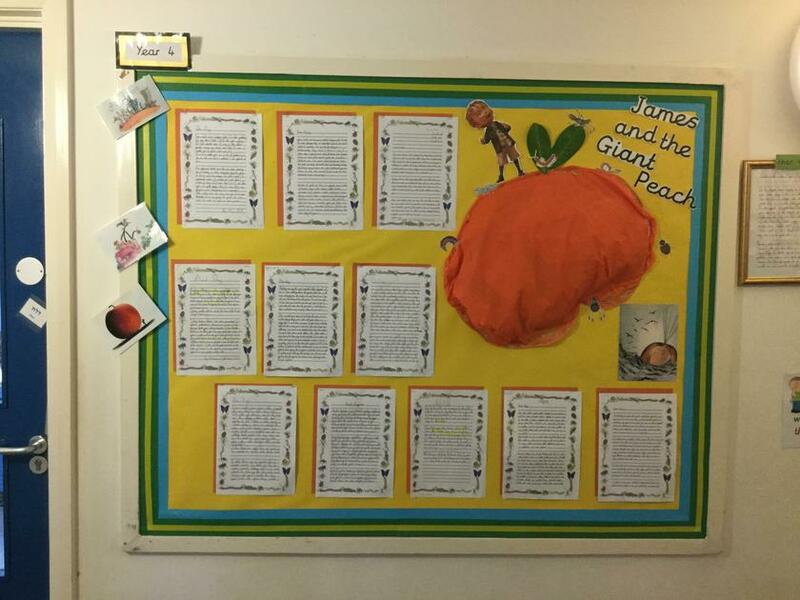 In English/Literacy we are reading the well-known book James and the Giant Peach--and we have lots of fun activities planned around this book as a theme. 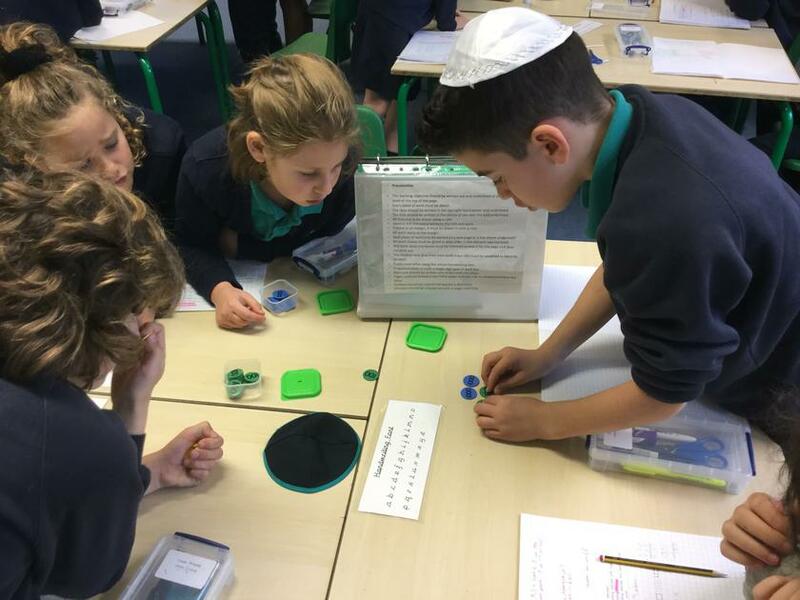 Make sure you have everything you need - you need a proper water bottle, your PE kit (with EVERY item clearly named) and small amounts of pocket change in case you need to buy additional supplies OR you wish to donate tzedakah on Fridays. 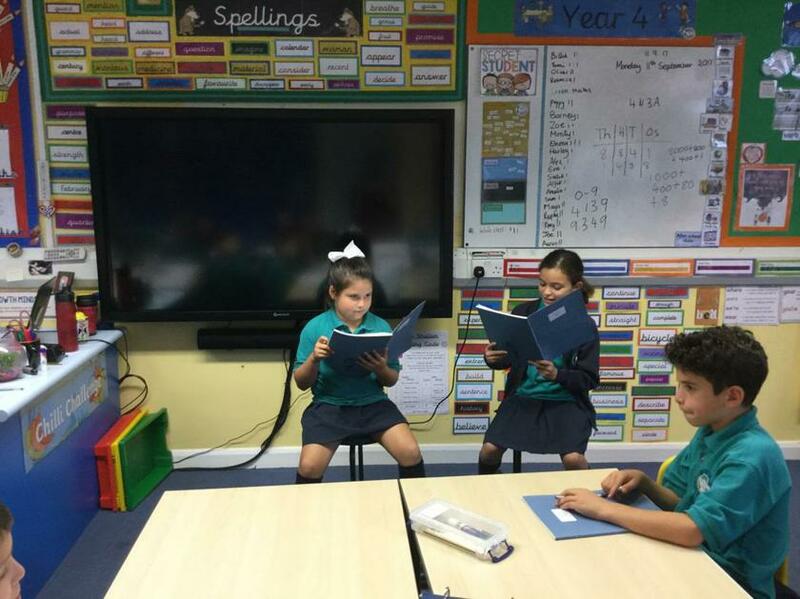 Homework books and spellings lists will be given out on Fridays. 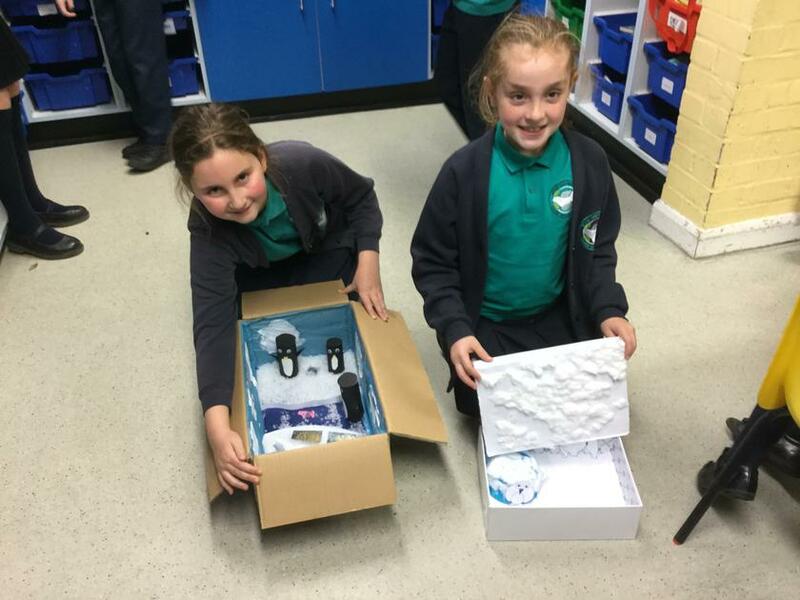 Please give them back to us by Wednesday so we can mark them. 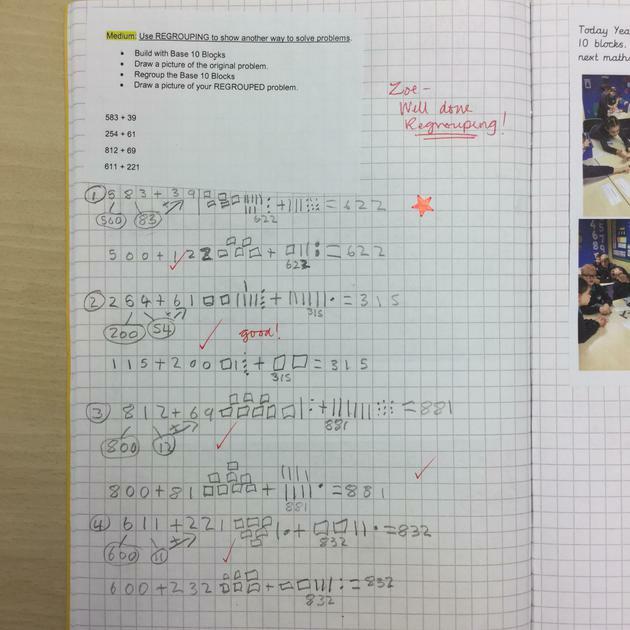 Your marked books and new spellings will come back to you each Friday. 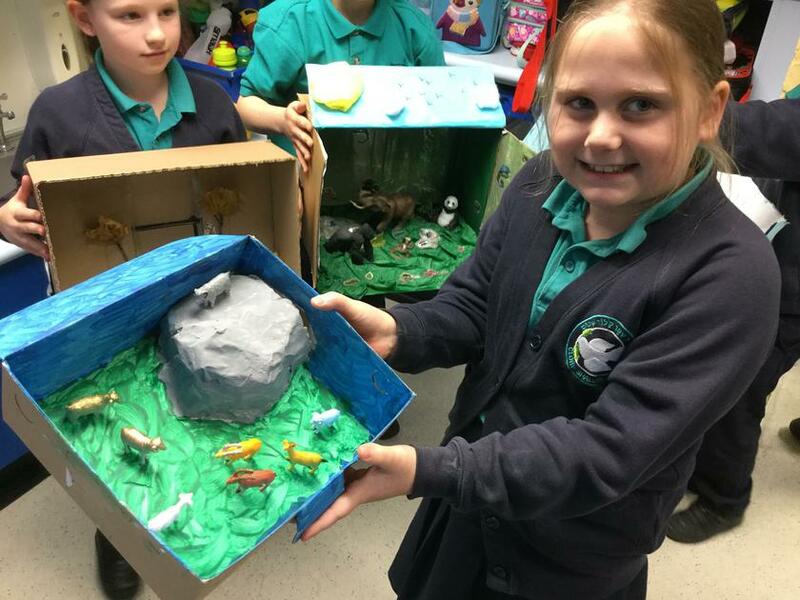 I look forward to seeing all the creative projects you come up with! 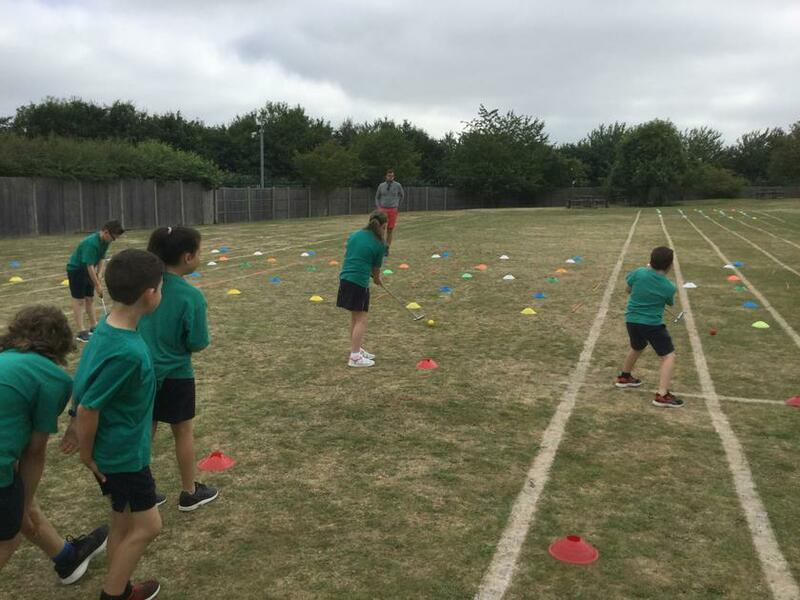 Have you seen the Kids' Zone on this website? 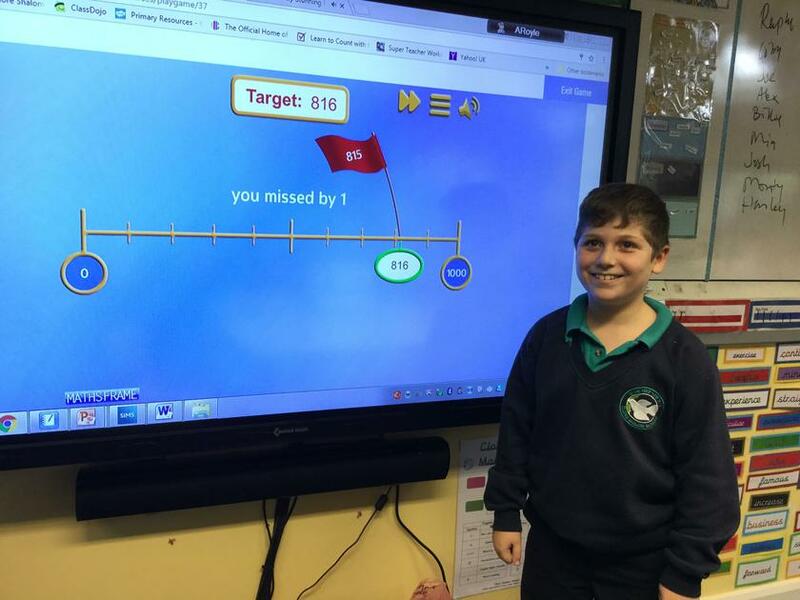 It is a fabulous online resource where students can play games and visit some interesing websites. 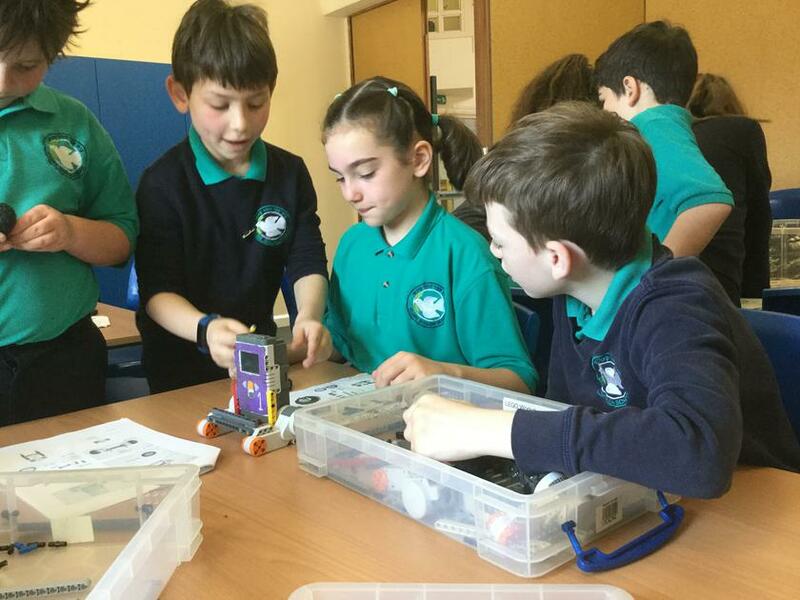 Do take the time to explore it at home with your families!